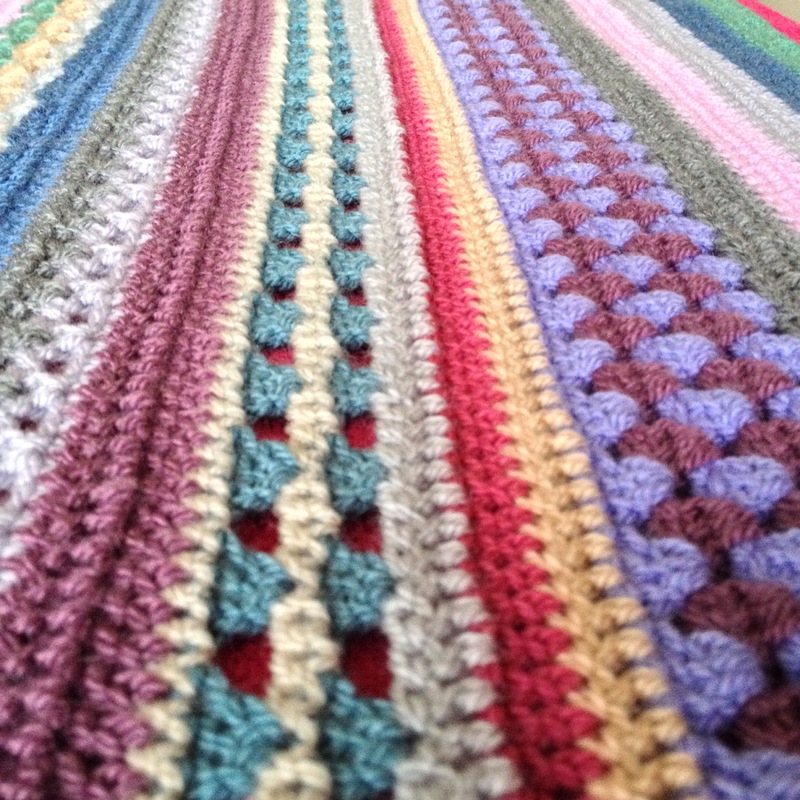 There are very Wintery low light levels at the moment, which means the photos are a little muted; so you need to imagine this blanket as even brighter! It is finished! We’ve celebrated late-Christmas with my cousin and family this weekend and she loves the blanket. I’m so pleased. So yes, the colours; you definitely won’t have seen this combination together here before, though I have used them all in other makes. 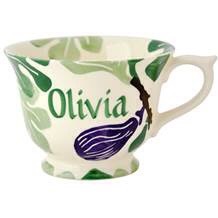 My cousin loves Emma Bridgewater china and these are the designs she wanted me to use as a basis for colour selection, but with the specific proviso that there be ‘Space Hopper’ orange because she loves it. Plus cream, lavender and a bright yellow. Eek! This was really out of my colour comfort zone, but actually as the blanket came together they seemed to work together more, the Mister says it’s quite Aztec-y. I’ll take his word for it. Pattern links and details about how to make a Spice of Life blanket are here on the designer Sandra Paul’s Cherry Heart blog. 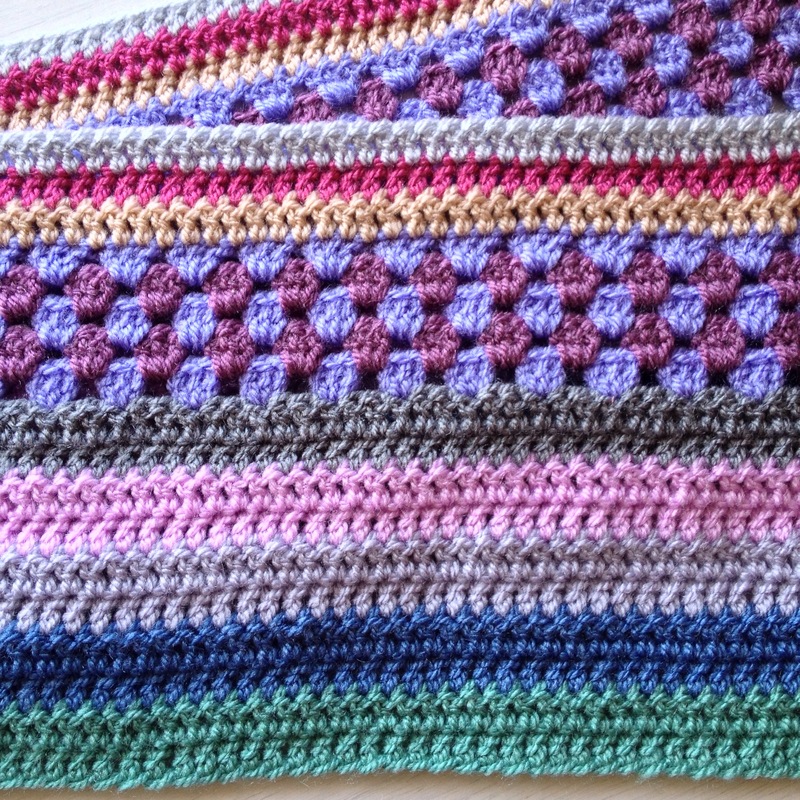 Hooks: I used 4mm, 4.5mm and 3mm again, see my first blanket post for information. Size: 3′ 6″ or 42″. This one’s smaller than my first blanket, it’s more of a lap blanket. 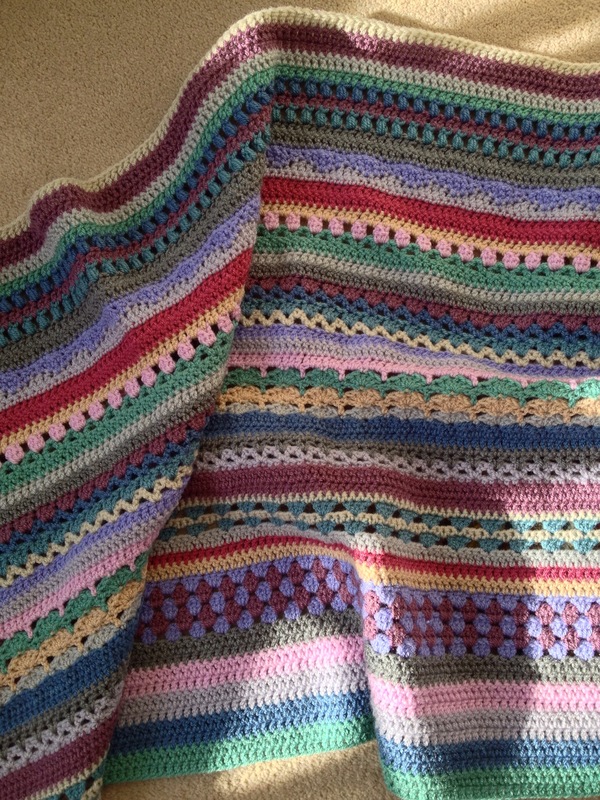 I’m glad it’s done, the multi-stitch blankets are interesting to crochet and the variety of stitches make them really pretty, but oh all the ends! 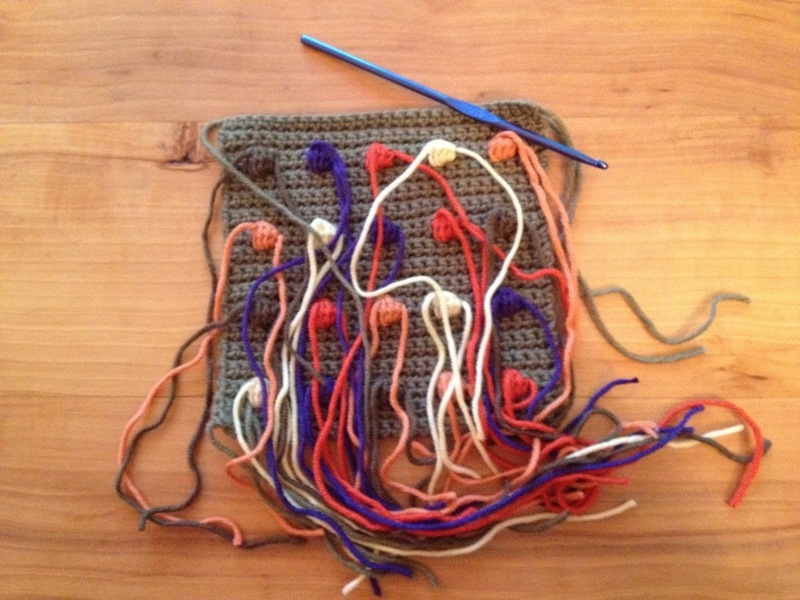 And now I’m on to a little bit of knitting…more about that tomorrow. I was pretty pleased with myself for finally finishing darning all those ends yesterday! The colours look pretty muted here, but it was a moment of celebration so I broke my ‘always take photos in natural light’ rule. The sides don’t look as wiggly as I expected. It’s not going to be perfect as I swapped about from a 4mm to 4.5mm hook, but as it’s just for me to snuggle in over the winter it’s all good. 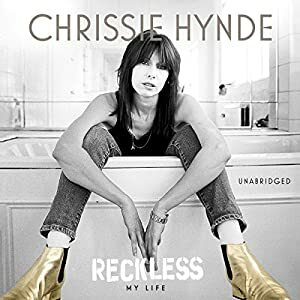 I’ve just started listening to Chrissie Hynde’s memoir, read by Rosanna Arquette. I love her descriptions of growing up in Akron, Ohio. It’s going to be a cracking listen, I can tell. I’m joining in with Ginny’s Yarn Along again. Here are my previous Yarn Along posts. I actually thought my last was fairly recent, but look how long ago it was! I’m pretty staggered. One thought I wrote about blogging makes me smirk. That feeling obviously didn’t stick around for long. This was my favourite week so far, in terms of the pattern, but I might have said that last week? If I did then it’s no bad thing; as it obviously means my enjoyment is increasing, not waning! There have been so many ‘I’m really glad the puffs are done’ and ‘I hated the puffs’ comments on the Facebook group page that even I was feeling a bit apprehensive about them. And I don’t usually get in a state about crochet. I haven’t done any puff stitches for ages, but actually they’re fine! As with lots of the stitches I thought might need to be looser, I used my 4.5mm hook. I ended up quite enjoying them, but have to say that they are definitely yarn eaters. I’m tempted to crop the second photo so you can’t see the ends that crept into the frame, but I’ll fess up here and now that I haven’t darned a single one yet. My excuse reason is that I’ll probably need to steam block again, when the blanket’s finished, and don’t want my neatly darned threads popping out when it’s pinned out. Phew now that’s off my chest I shall sleep easier. Ha! It took me a while to get around to part 3 of the pattern (actually part 2; as part 1 was initial info on the CAL. I do think it would have made it easier all round to call that week 0, but there we are) as I developed a stonking cold last week. I’m still coughing and rattling around, but at least my brain is working again. I really enjoyed doing this week’s pattern, there was a good variety of stitches. The rows of V stitch are so preety! 2 minutes after publishing: Oh dear I don’t think my brain is working that well after all since I’ve forgotten to say that I’m in the process of steam blocking the ends! I’ve left it pinned on the ironing board to dry while I write. My tension must have been a little tighter than the rest after the shell rows. I know others in the Spice of Life Facebook group (now with over 4K members!) have found the same, so it’s one of those things with this type of row. It’s harder than than you realise to crochet a lot looser than usual. 6 hours after publishing: Working on the next part today I’ve gone up a hook size from 4mm to 4.5mm for some of the tighter rows. It’s sorted the tension issue and so there will be no more steam blocking each week …hurrah! Just trying to crochet looser would be hard to do. I think it might well result in inconsistent stitches overall. By changing hooks back and forth I think I’ve cracked it. So, the first part of the Spice of Life CAL was issued this week, on Tuesday. All the details can be found here (free of charge.) I think the popularity of the CAL has taken everyone at Black Sheep Wools by surprise; there are now over 3,000 members in the Facebook group alone and they’re from all over the world. Lots and lots of photos are popping up on Instagram all the time. Look for #spiceoflifecal. Many people have chosen to use yarn from their stash, so there are some wacky colour schemes as well as those that make you sigh ‘I wish I’d chosen those!’ I was lucky enough to be asked to take part, I’ve written about that here. I’m really enjoying being part of a CAL again, and not as the organiser. 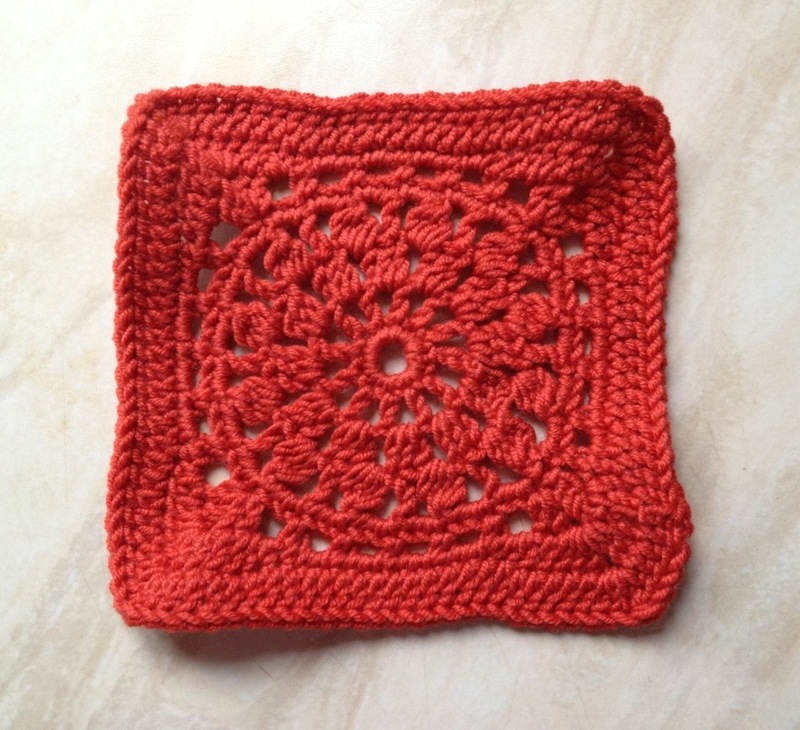 The pattern by Sandra of Cherry Heart blog is lovely. The fact the first pattern release is called part 2 has thrown some people; as they’re worried they’ve missed part 1. 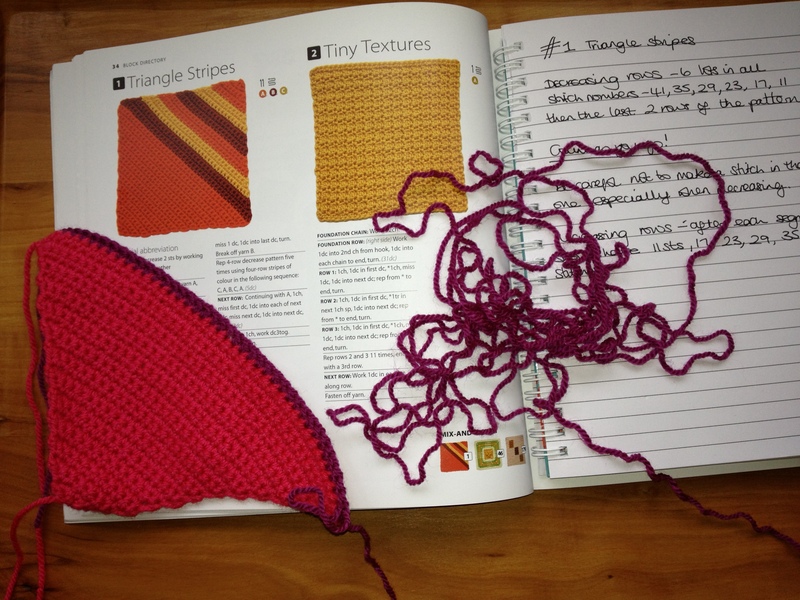 In fact part 1 was just yarn details, hook size, and some information about helpful resources. Really the CAL, in terms of crochet, is actually only 7 weeks long. The first week’s pattern is dead easy, so even if you’re reading this in a week or two it’s not too late to catch up. As usual I’m promising to myself to darn ends as I go and not doing it. The lime is going to have to be used another time. The funny thing is I never ever used to like green, especially lime, but for the last four years have been strangely drawn to many shades. I was keen to include it here, but it’s just not right alongside the other colours. I know the numbers are a little anachronistic, but I’ve kept to the way of the pattern. The first 10 are listed as ‘set up rows’ so part 3 (2!) should continue consecutively. Are you doing the Spice of Life CAL too? At the beginning of August Black Sheep Wools asked me if I’d like to take part in a crochet along (CAL) beginning in the middle of September, all yarn provided. How exciting! A CAL and a free bundle of yarn. I don’t find it easy to be all secret squirrel, but I’ve managed it. Phew. 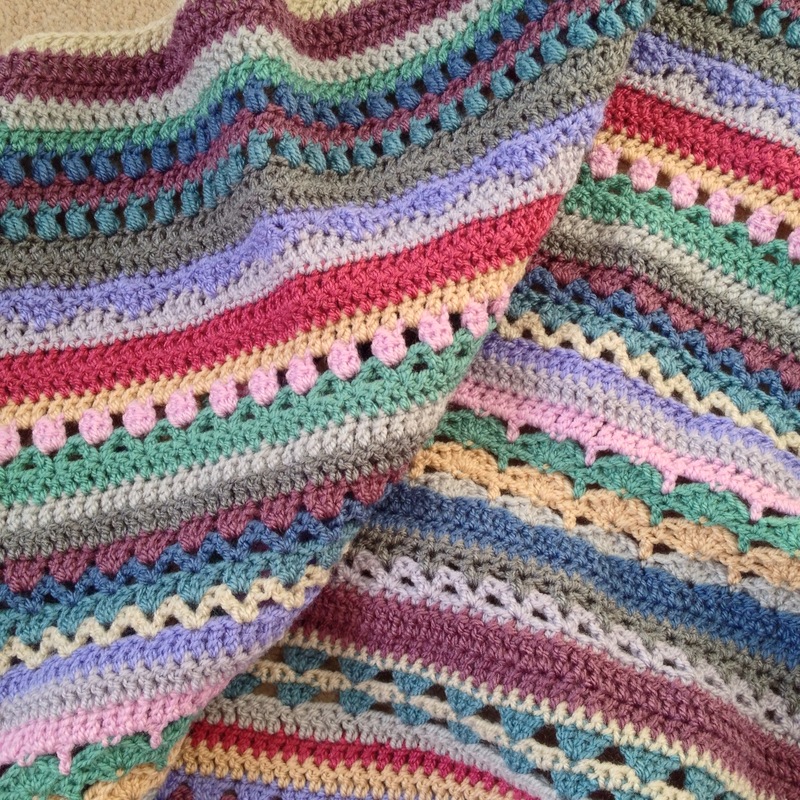 The blanket is designed by Sandra Paul of Cherry Heart blog. 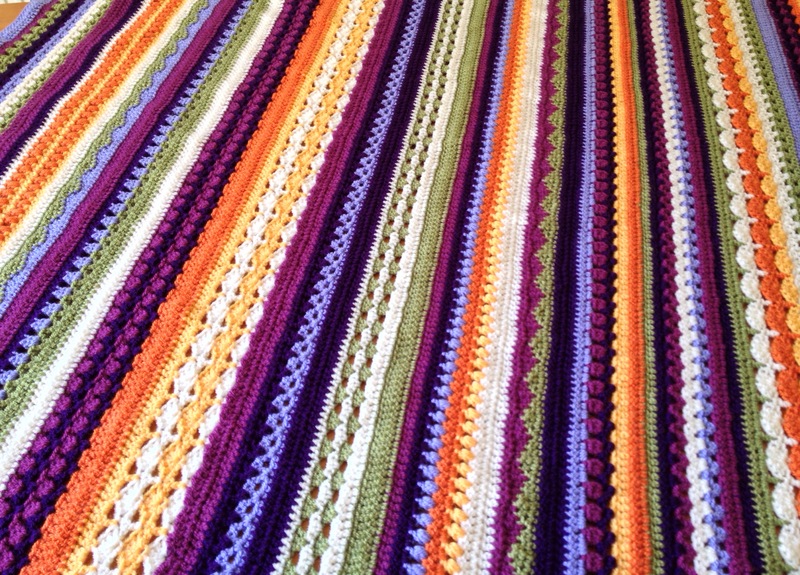 I’ve been thinking about doing a multi-stitch blanket for ages and this looks a goodie. Everyone seems to love a CAL and this is Black Sheep Wool’s first. It’s looking very promising; today I’ve seen the Facebook group members go from 5 of us to over 300, and counting, and this is only the first day it’s been publicised. It feels fun to be part of something from the beginning. 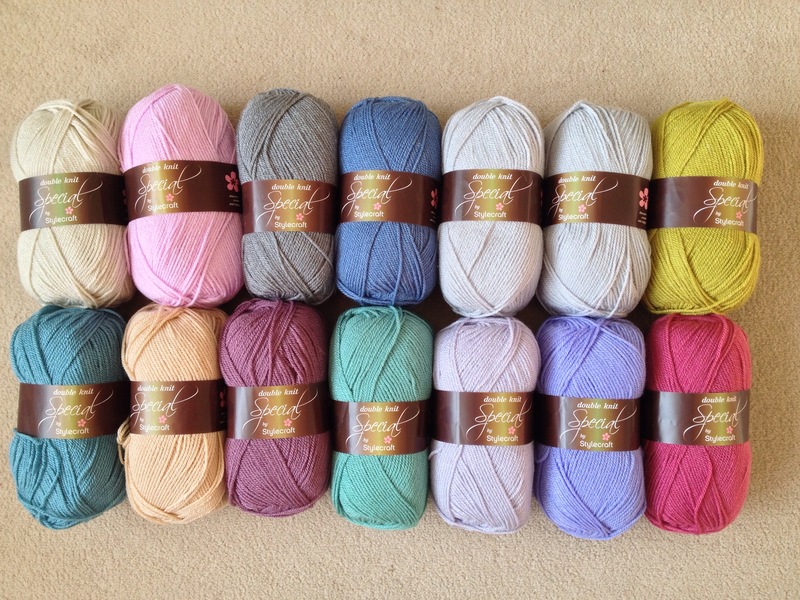 This seemed a good opportunity to try some of the new Stylecraft Special DK colours, pretty aren’t they? I think I’m going to use the lime and raspberry sparingly, just to add a little zing. Do you fancy joining the CAL too? You can order a choice of yarn packs from Black Sheep Wools, choose your own brand and colours, or use up yarn in your stash. 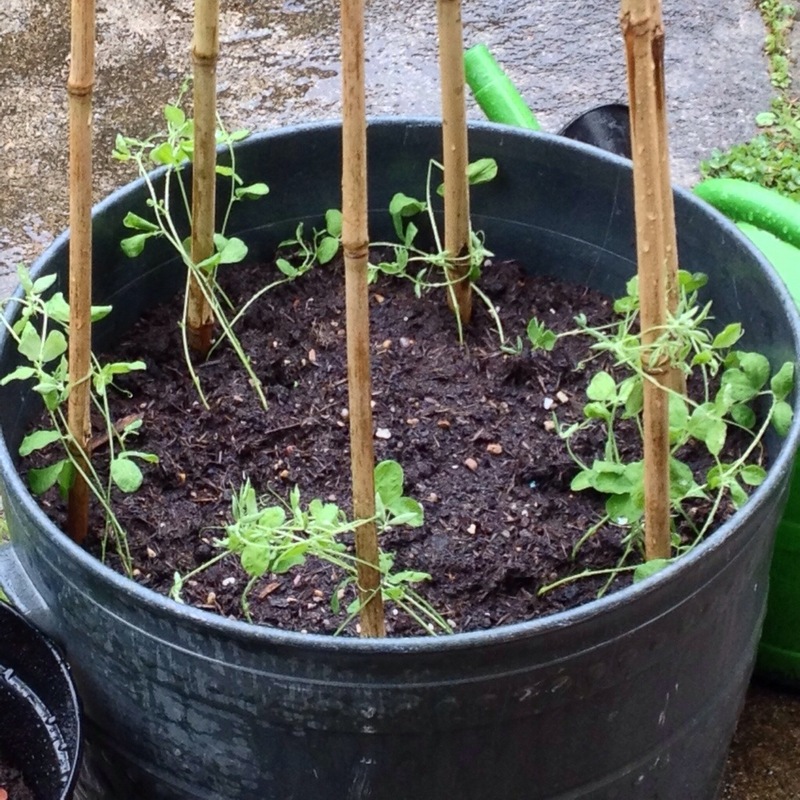 This might be an ideal project to use up leftovers. The first part of the pattern will be available on 22nd September, so there’s plenty of time to organise what you want to do. 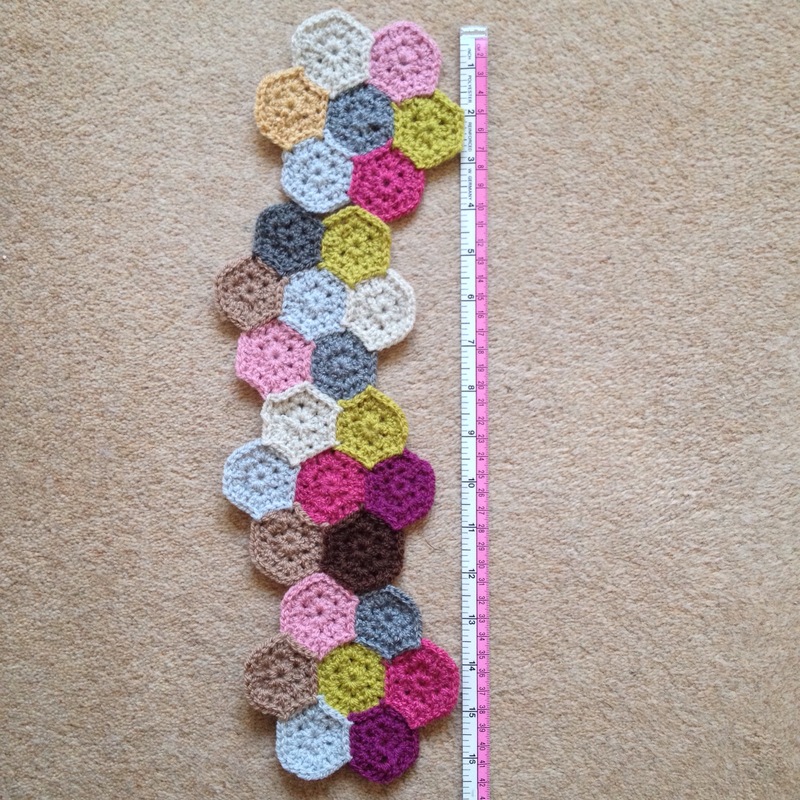 This is a progress photo from earlier in the week, it’s 28 days worth of a baby hexagons. Well, what can I say? They are addictive and so easy to make! 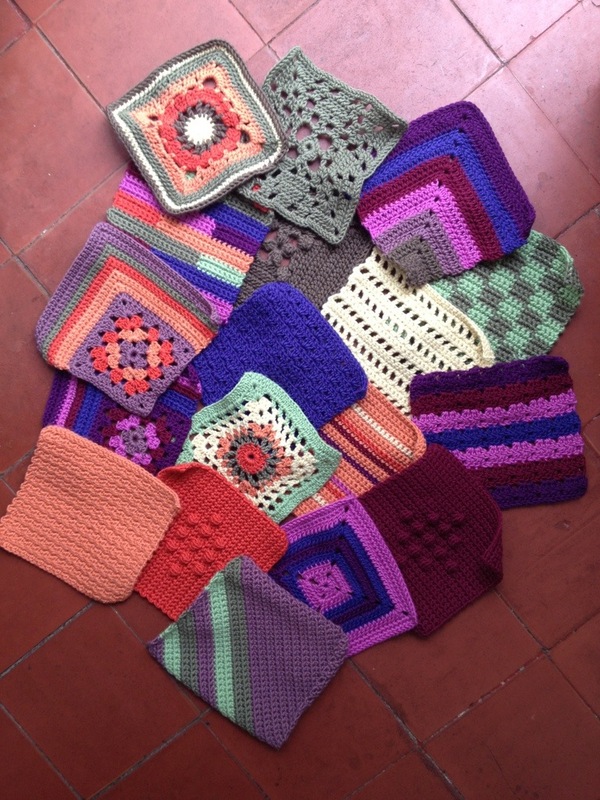 But LOOK – 28 only measure just over 16″, so for a decent sized blanket by 31st December we’re going to need to crochet one a day, plus lots more! So now I’ve kind of abandoned the whole baby hexagon a day concept. Although a one a day CAL is a lovely idea I don’t think this one was properly thought through measurement-wise. So now I’m just doing a batch when I feel like it, and I plan to continue this throughout the year. It’s impossible to just make one a day anyway, the one turns into five or sometimes (prepare yourself) I don’t feel like crocheting anything at all. Isn’t it turning out pretty though? 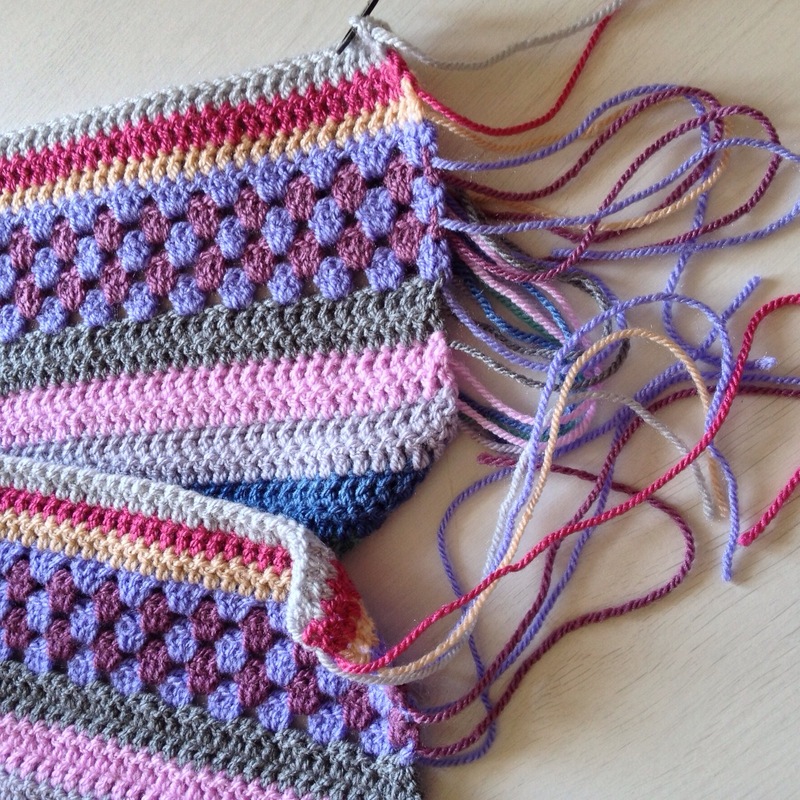 I’m using leftover yarn from my zesty raspberry ripple blanket and pinching colours that I’m using for my motifs. It will change though as the plan at the moment is to add new colours from whatever I’m making in Stylecraft as the year goes on. When I decided to redesign my William Morris colour inspired motifs I was slightly panicked by going from a blanket which was a third complete, with a basket of semi-finished motifs to absolutely zero. So I hooked new versions without pausing to darn any at all. Argh! I ended up with so many ends that I’ve had to stop and do nothing but darning. Argh! On Sunday I divvied the remainder into seven little piles to tackle like homework each night. I missed last night because I was out, but it’s a good idea to tackle the last of a tiresome job in small bits. For the next fifty motifs I will make one, darn it, then move onto the next. I really will. I saw my dentist last week “Ah you always have stunningly good teeth” he said before I even opened my mouth! Afterwards I bought a bone handled 1935 cake knife made to commemorate the silver jubilee of George V who was the Queen’s Grandfather. It was a bargain £4, after some Googling it seems most online sellers are asking £15 plus for one! I bought it because I really wanted a cake knife, rather than grabbing the first knife which comes to hand when we have guests, but what a lovely find. 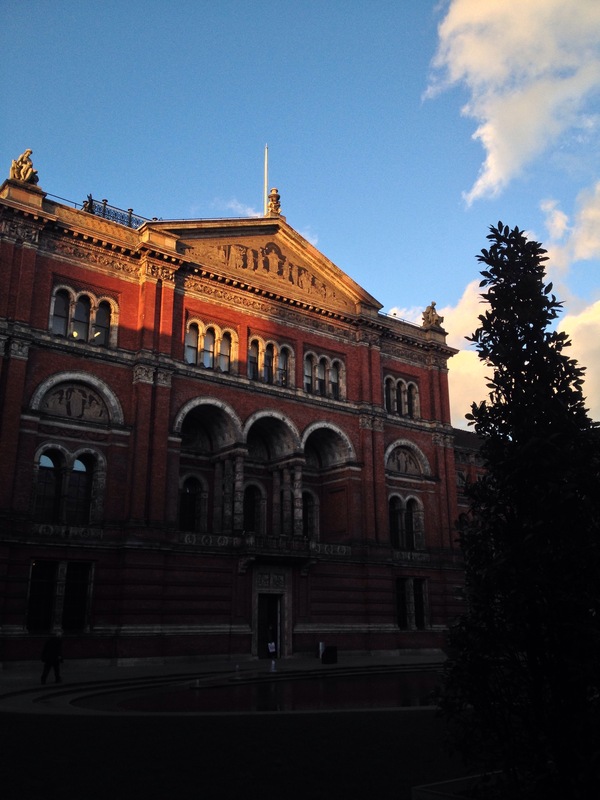 I’m so lucky to have been given membership to the V&A in London, officially known as The Victoria and Albert Museum. 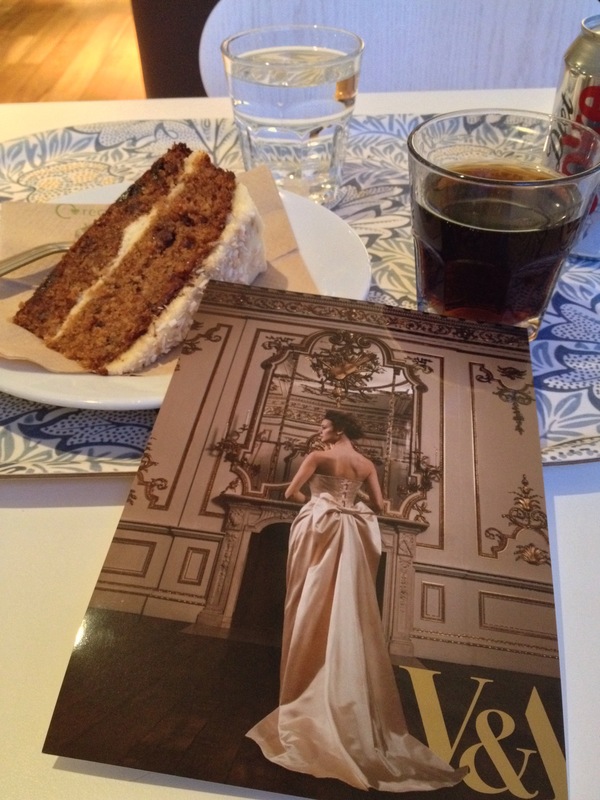 I’ve used my card for the first time and loved swooping into the Wedding Dresses exhibit with a simple flash of my card. Do go if you can before it ends. You “Wow!” your way around. I also visited the members’ room which was described to me by a room guide as ‘the inner sanctum’. It was certainly very peaceful and comfortable. The water jugs were donated by Waterford Crystal and even the tray is lovely! My membership includes a guest so I’m hoping to take friends and family to events over the year. Thank you Father Christmas. 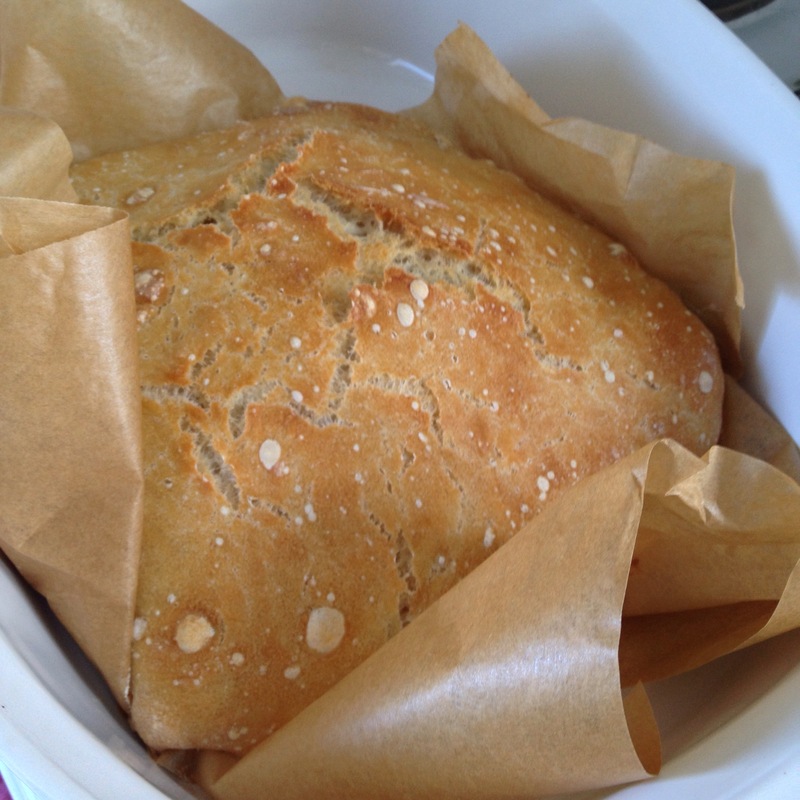 I’ve baked my first loaf of Artisan bread in my new cooker. I started to use silicon coated baking paper last Autumn because you can place it gently down into the heated pyrex while safely holding the strips of paper. I adjust the oven temp down to 220 oc from the recipe’s 230 oc to comply with the paper’s instructions, but this oven has a much better seal and there is a huge gust of steam as you open the door. I’d quite forgotten ovens do this and have had a hot facial a few times. The problem is this time the paper became melded to the bottom of the loaf. It might have been a wetter dough than usual, or the new oven. While I’m not fussy I don’t like the chewy texture of silicon. (Yes, I did try it.) So I might go back to gently plopping the loaf in sans silicone because it’s a tragedy to have to cut the crust off. How’s the third week of 2015 going for you? I’m ahead of my hexie a day plan but they’re so cute and easy to make! 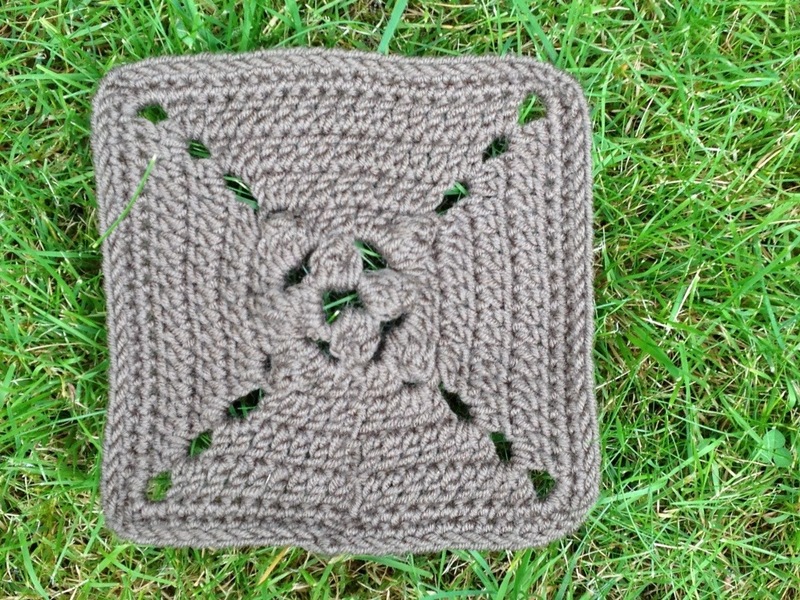 I’ve changed the pattern I’m using because I think the shape is better and it looks much more like a hexagon! I found this pattern posted by @cuteashook on IG. It’s in graphic form so if you prefer charts go there, or to my page. I’m not sure who to attribute it to, if you know please let me know. 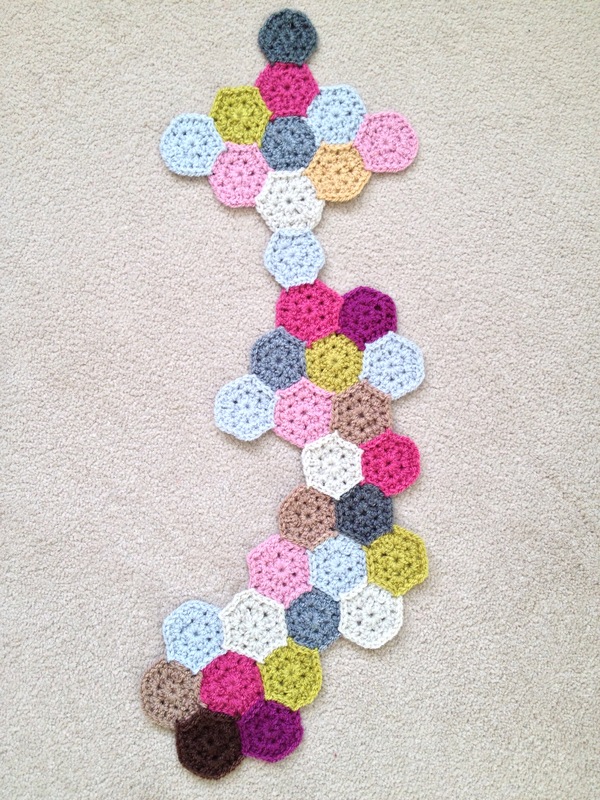 Do you want to join in with crocheting a baby hexagon a day too? All trebles in R1 are worked into the FR, then on R2 into the chain space of R1. R1: ch 3 (counts as a treble) tr 1, ch 1, *tr 2, ch 1* repeat 4 more times, SS to 3rd ch of beg ch3 (6 groups of 2 trebles) ss to 3rd st of beg ch. You’ll know you’re at the end because you’ll have a baby hexagon. If not a) start again b) let me know that there’s a mistake here! I’m joining as I go on the second round, replacing the chain in the middle of the trebles with a joining slip stitch. I have two joins per side. You might want to join three times along each side, its up to you. I tried it both ways. I’m going to use whatever DK yarn I’m using for other projects through the year and so it will turn into a kind of memory blanket. 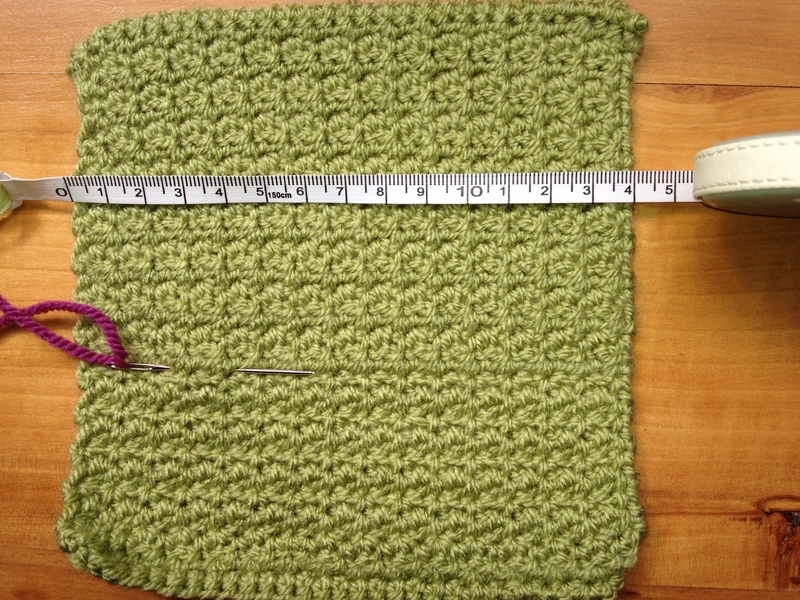 You can use finer or chunkier yarn as long as you stick to the same weight all year. I guess if you were feeling very keen you could make 3 hexagons a day in 3 different weight yarns, a blanket to keep and a few to give away for Christmas? My eggs need to go into the pan now – I hear the water boiling. I have a yen for an egg and watercress sandwich for lunch. 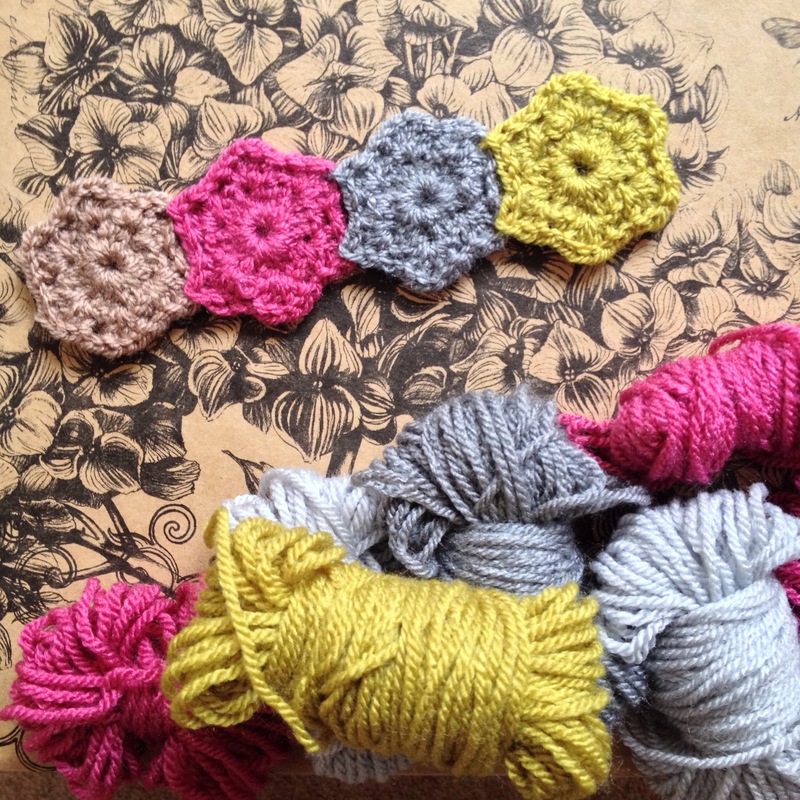 Are you joining the baby hexie a day gang? Happy New Year everyone! It’s all ahead of us, isn’t that a wonderful feeling? 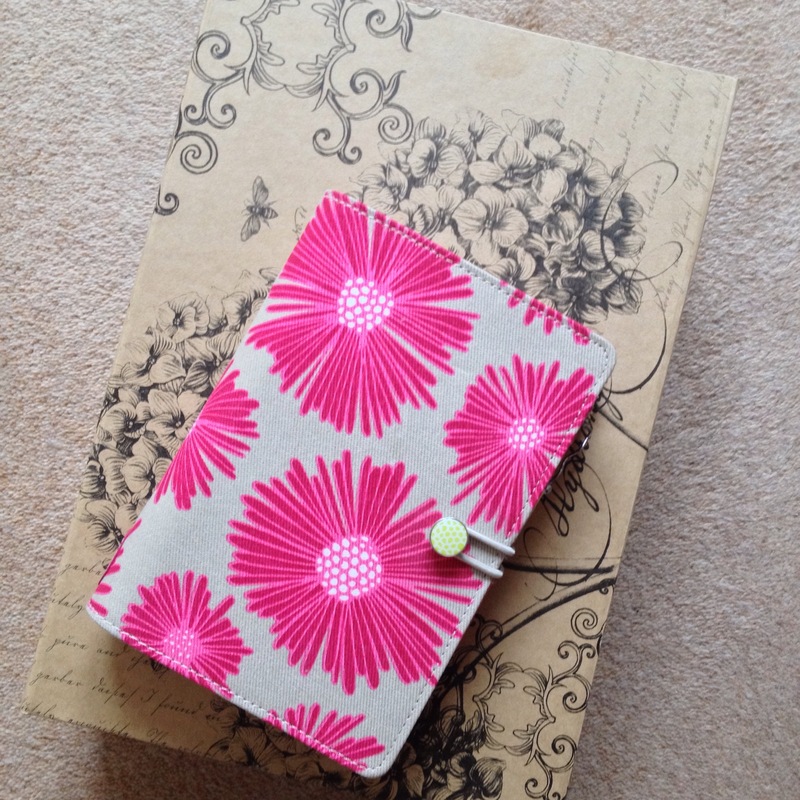 I bought a brand new Filofax in the sales with some of my Christmas money, no more black for me – oh no, it’s pink flowers all the way! This morning I’ve gone through my book list, seeing how many I read last year and writing down what I’m reading at the start of 2015. I always happily spend some time sorting my pages and new diary out this way at the beginning of each new year. I’m not giving up paper and pen for everything online. I’m a happy mix of the 20th and 21st centuries. We’ve been away and cozying up back at home, with the fairy lights still twinkling, is definitely the best thing today as it was a winter wonderland when I woke. The temperature was only 0 oc at 10:00, now it’s gone up to a balmy 1 oc at 1pm! I De-Christmassed yesterday evening to an extent, in that I took down the cards and decorative bits and bobs, but have left the lights around the fireplace. It’s twelfth night on 6th and so they will go then. On the last afternoon of 2014, New Year’s Eve, I decided to try something new that I’ve liked the look of for a long time. Catherine wheel stitch is fun. Treble 7 together is a new one. The hook is full of loops by the final yarn over! I was a bit apprehensive about it, the stitch looks tricky. Like everything it’s fine when you’ve completed a few rows. 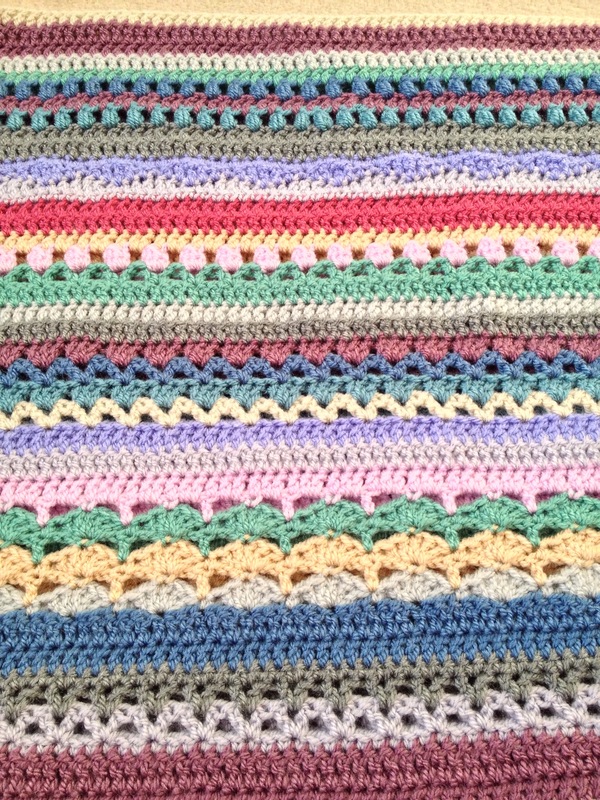 This is going to be a baby doll blanket for a friend’s toddler. I saw some gorgeous photos of the nearly two year old opening her baby doll on Christmas Day and decided she must have a bespoke blanket. 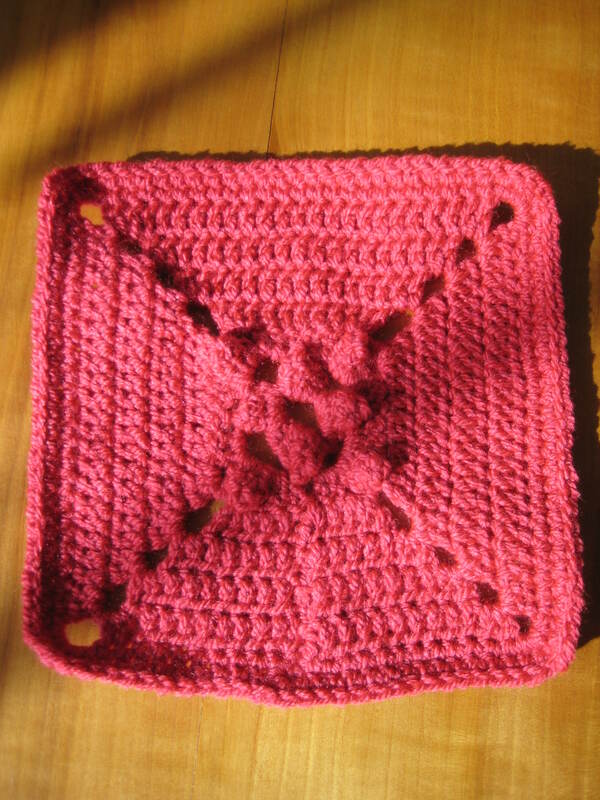 This toddler is the baby for whom I crocheted the baby jewel blanket. I gave it to her when she was a day old in hospital. Eeek! Where do the years go?! 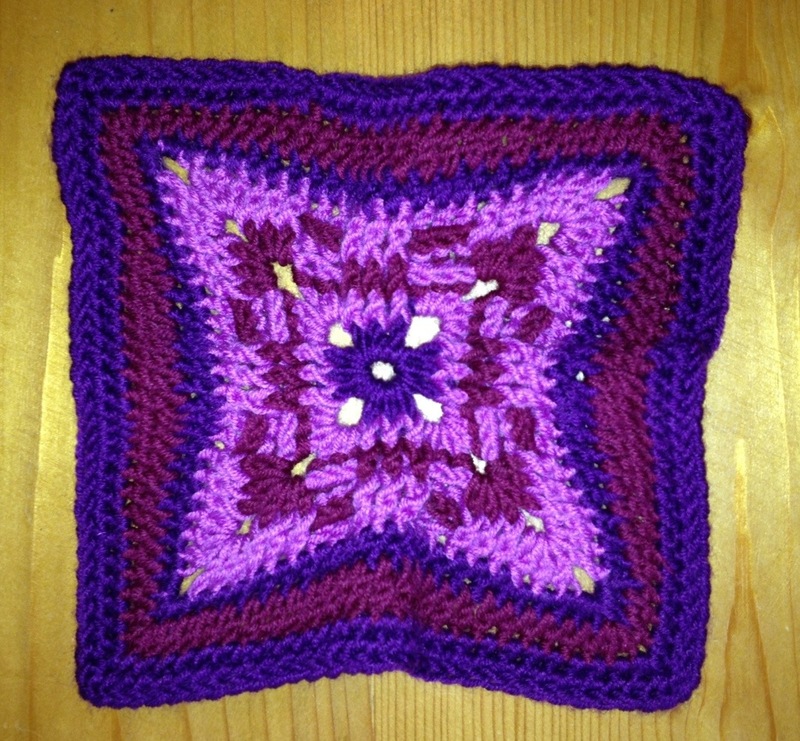 Last night I saw a great new CAL that Ali Campbell has started – a baby hexagon a day blanket. It took me ages to decide how I wanted to jaygo (join as you go! Why have I never seen this fantastic acronym before?) 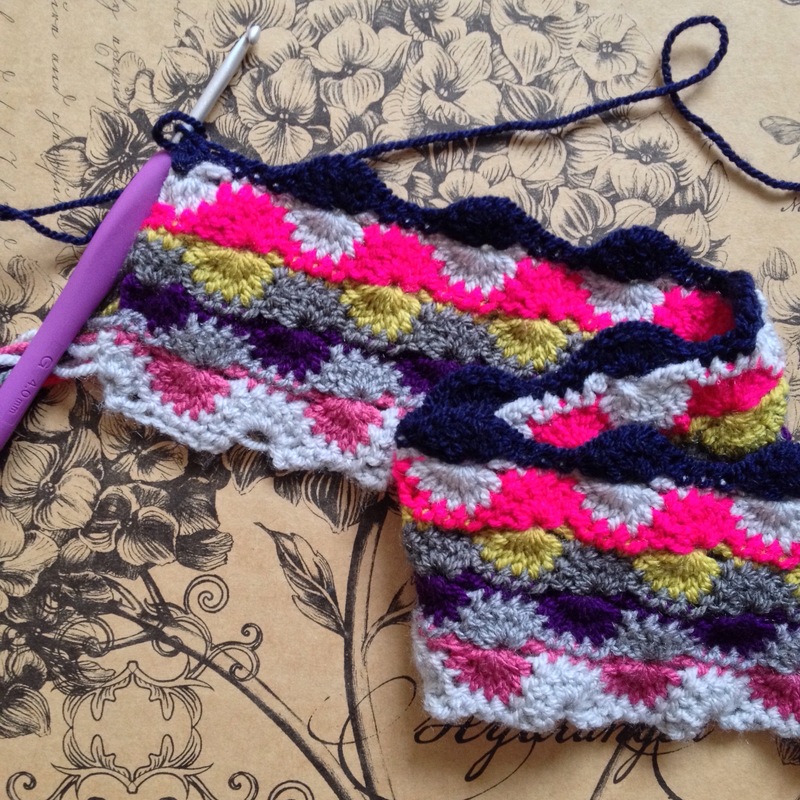 them together – should I do 2 joins or 3 along each side? I finally decided to stick with 2 as they retain their shape better. So, are you joining me? 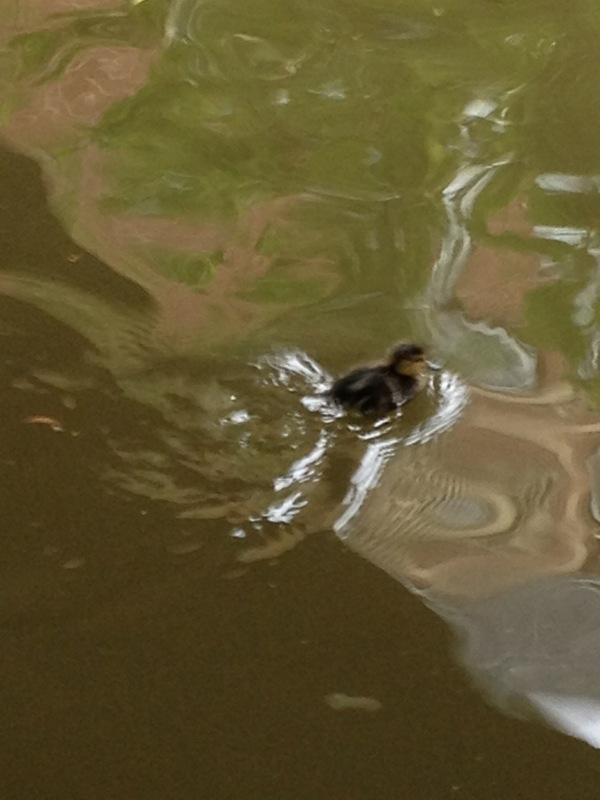 They are really small at 1 3/4″ point to point. Of course yours might might be tinier – it depends on the yarn and your tension. The pattern is on Ali’s first hexie photo in the comments. 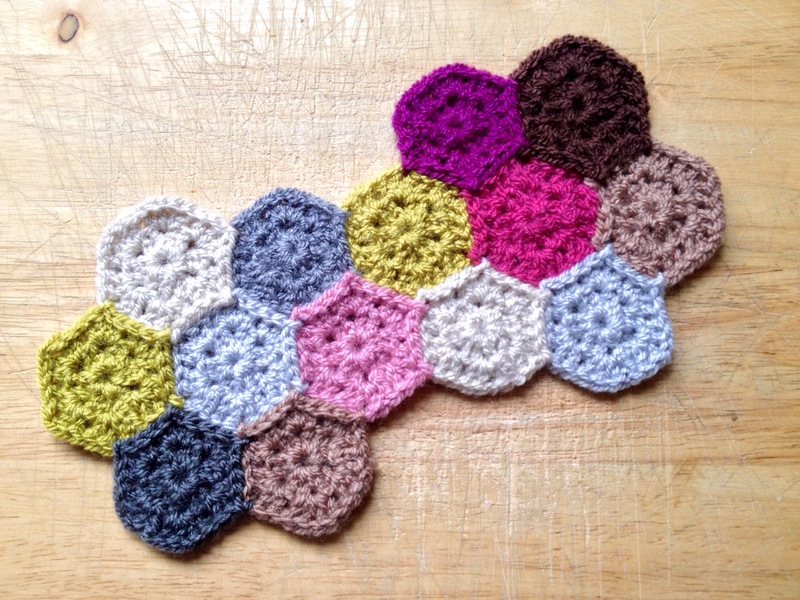 Search for #babyhexagons or #babyhexieaday on Instagram for others taking part. By the way join IG. Just do it. The crafty pics and micro blogging of it is superb. All the best bloggers are there and so many other talented makers. It’s a total inspiration machine. ::I didn’t like the magic ring of the motifs, so decided to chain 6 and make a foundation ring, but then that meant the blanket was a combination of both and likely to pull apart from some middles and not the others. I keep reading horror stories (ok, it’s only crochet, not life or death, but it’s a lot of time and energy in the making) about how magic rings can pull out gradually and work unravels from the middle, even with careful darning. ::Join as you go is great, but I was hating it for the old motifs because of the combination of stitches after the joining slip stitch. It was no fun and even the Mister noticed that I wasn’t enjoying the crochet. ::I disliked the way the chained parts of the motifs were lying rucked up against each other. I probably should have realised that they would look better being shorter but don’t usually change motif patterns, especially as they had looked great in the book. I woke several mornings in November thinking about the need to change the whole blanket. If there’s something you repeatedly think of first thing upon waking then that’s what you need to spend some time on. I’ve now designed my own motif, as you see it’s trebles into the initial ring, rounds of clusters and two rounds of groups of granny style trebles. I’m joining them as I go and it’s stress free. The blanket is a strip again but I have over 50 motifs ready to darn and join. It’s made lots more work with so many ends to darn in, but the texture of the motifs is pleasing and they’re going to make nice snugly weight blanket. I really like having these three very different projects to pick up and work on at the beginning of a new year. What are you making at the moment? 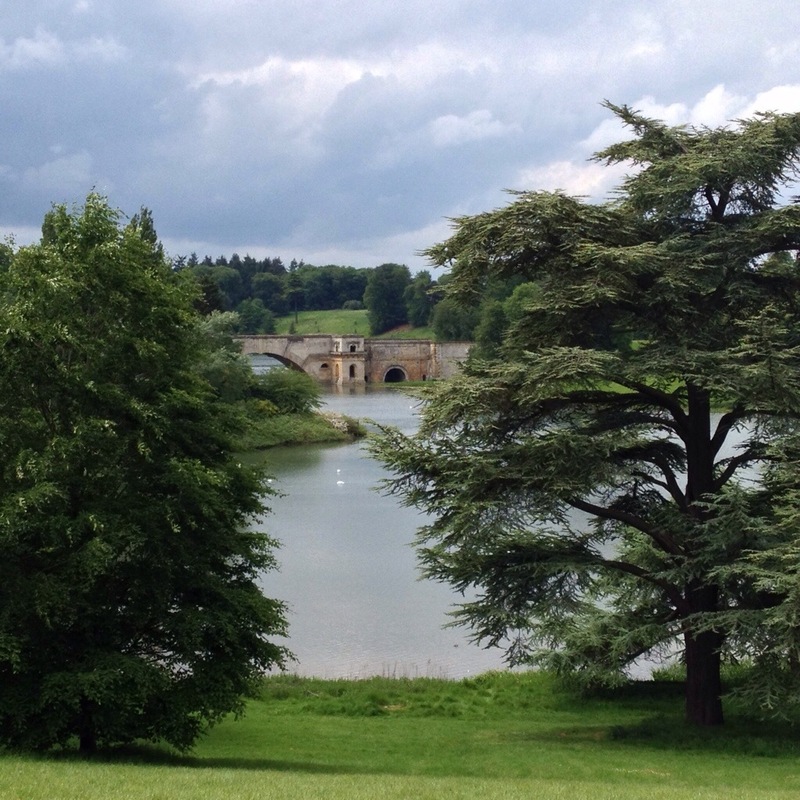 An impromptu picnic lunch at Blenheim Palace, sitting on a rain coat munching on salad and watching the swans paddle serenely along the lake. 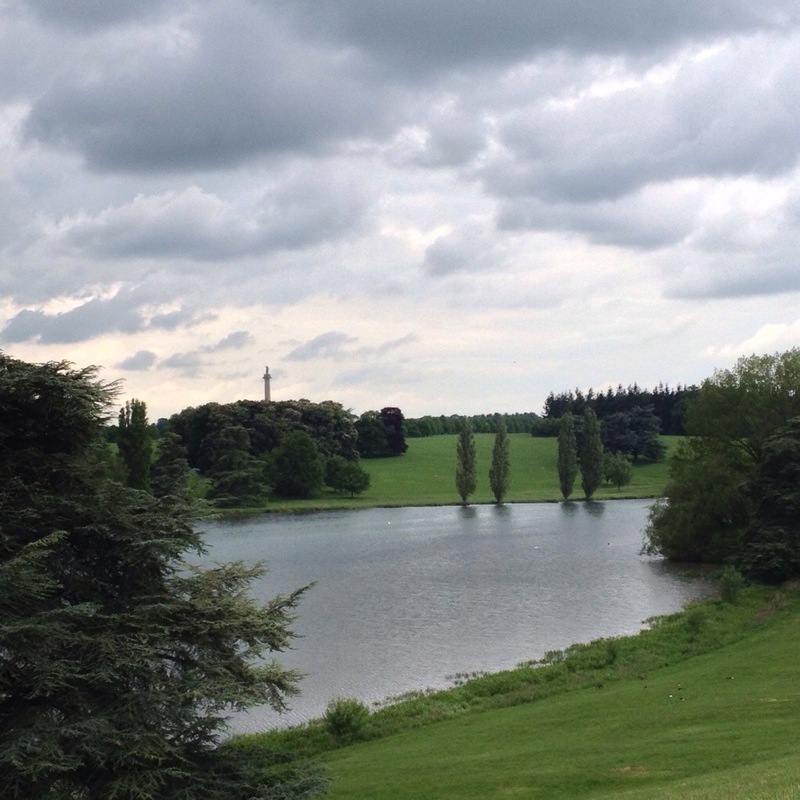 The weather is so April showerish still, even though it’s now May, the sky changed so fast from blue to grey. 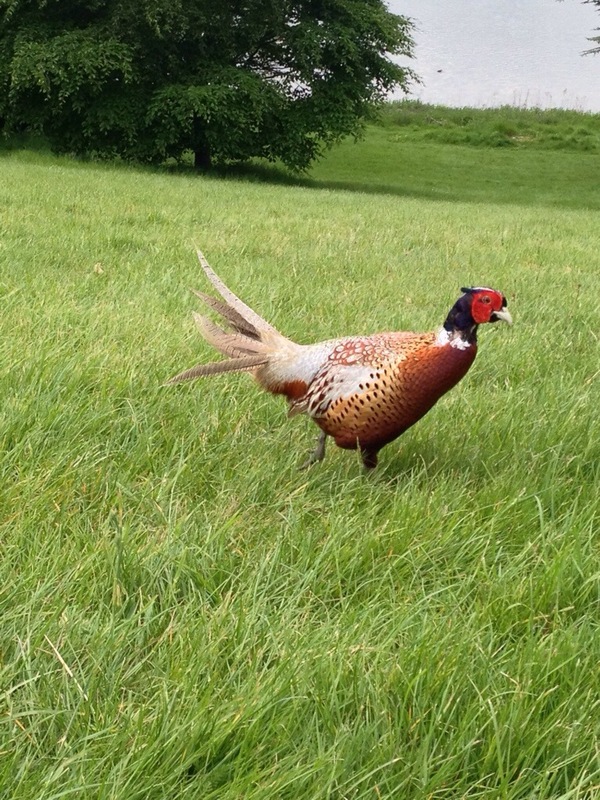 Even the pheasant ruffled his feathers and wandered off for cover, giving up all hope of sharing my lunch. 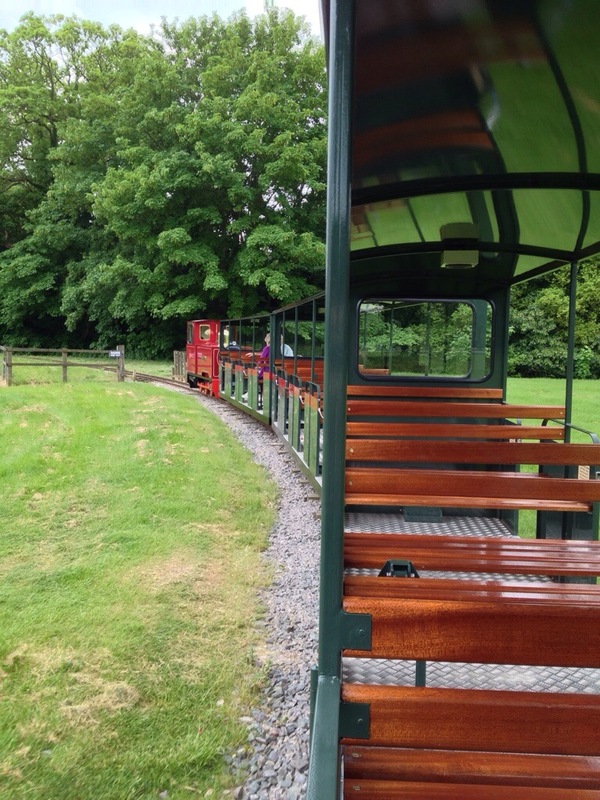 Time for a train ride? Ah, it’s oh so quiet. 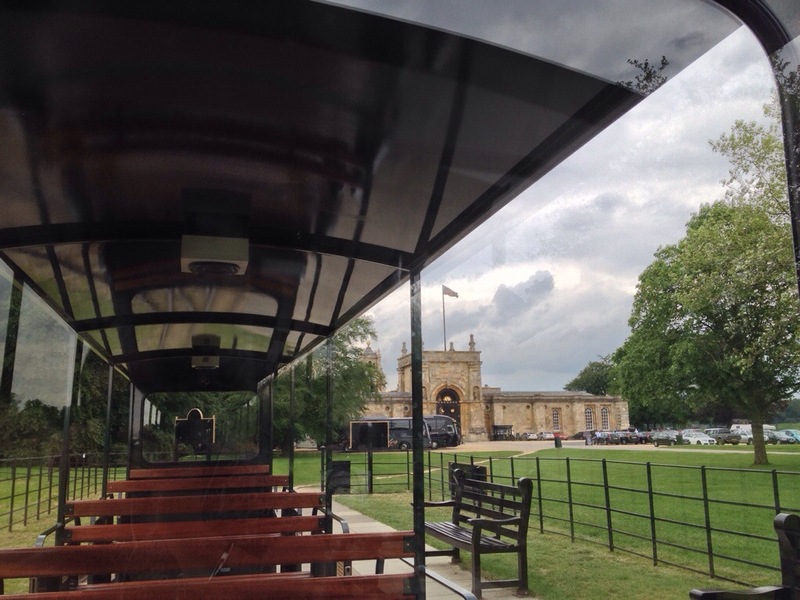 There’s a new train (‘Winston’ – Blenheim is the birthplace and family home of Winston Churchill so there’s lots about him and now a train too!) and tunnel which I was quite excited about, it will be good for children to go through a dark bit, but for adults it’s actually a long wooden structure (shed) which can be locked to house the new carriages. Oh well, the anticipation has been nice. Serves me right for being such a child! 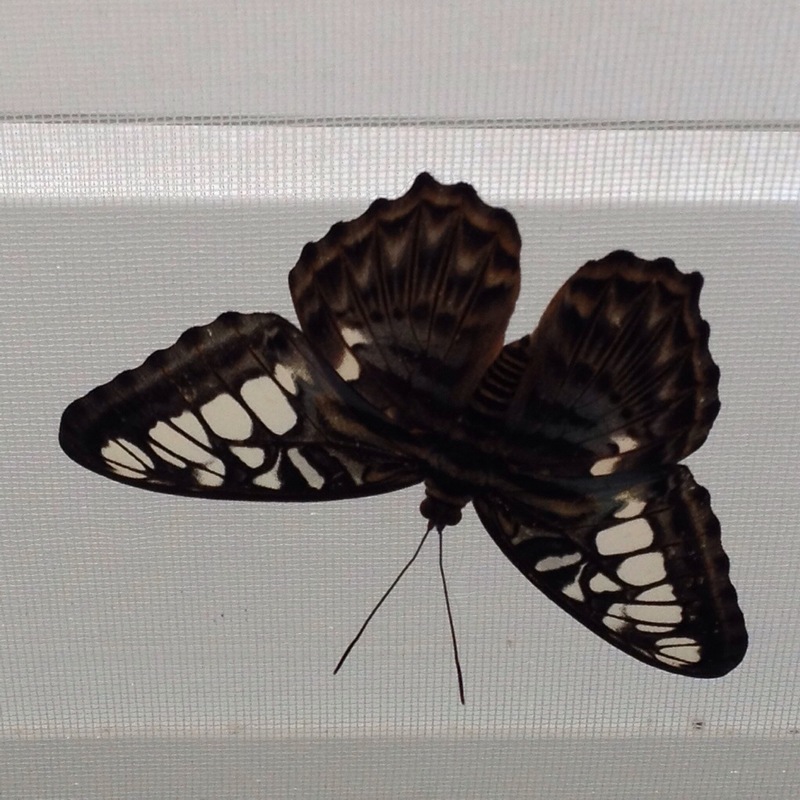 The overhauled butterfly house is different. 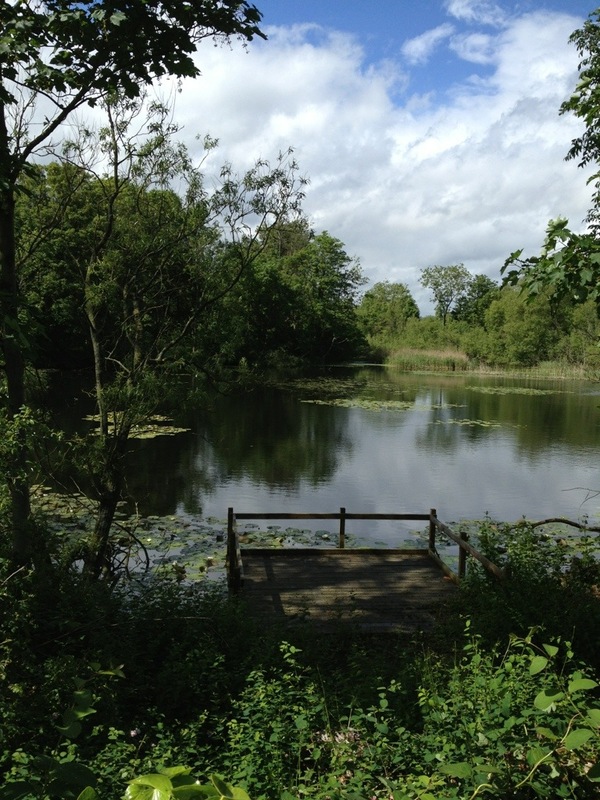 The bridge over the water has gone, lots of the green bushy plants have been removed and new brightly flowering shrubs are in place. 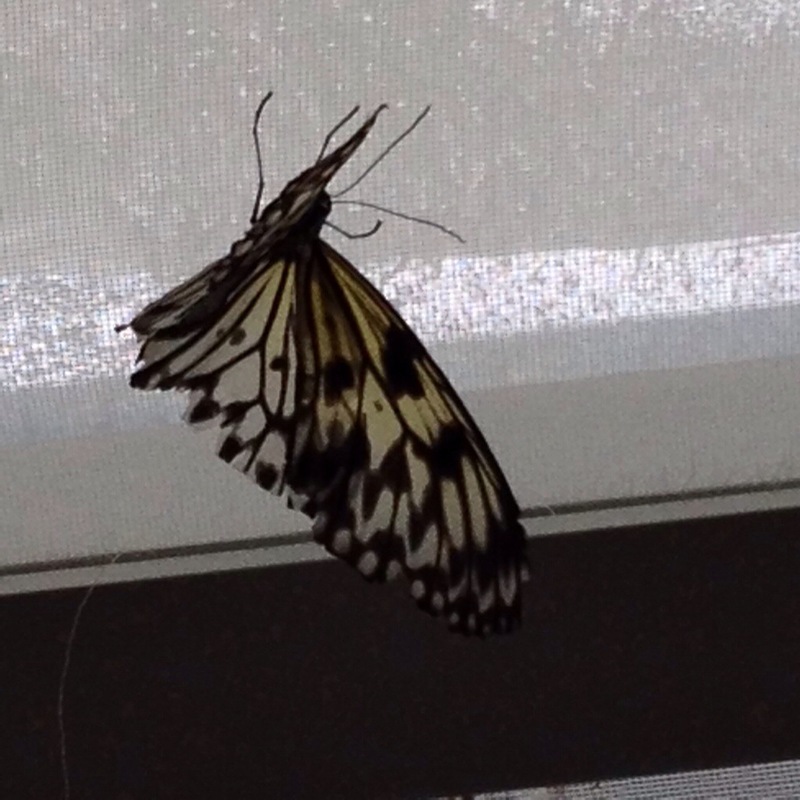 You can see the butterflies clearer against the new white screens, it will be worth making a special trip when more have hatched later in the season. 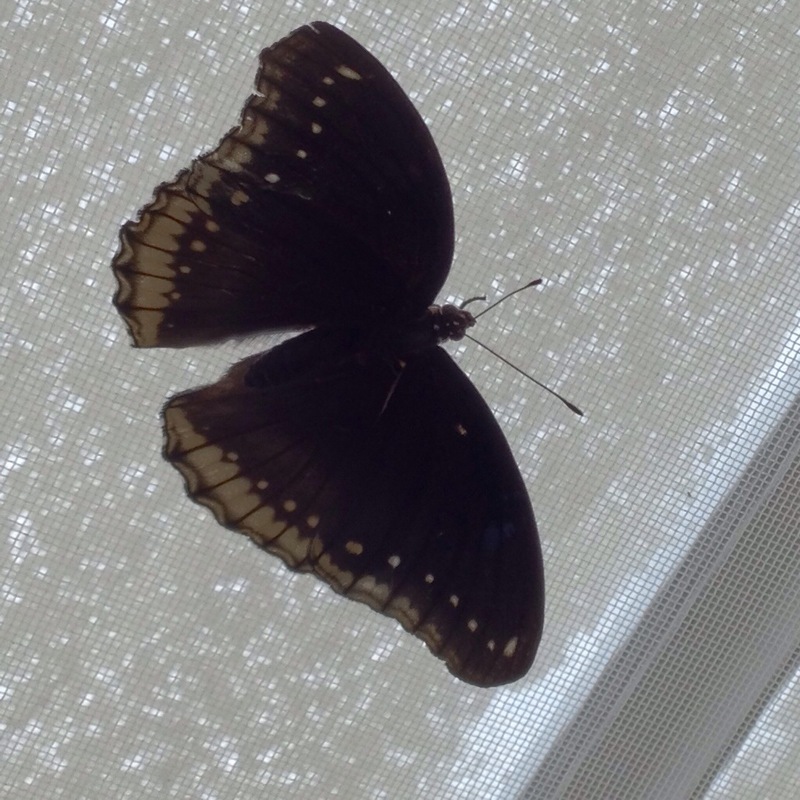 I virtually chased one up and down the length of the house to try to photograph it; a HUGE bright beautiful blue one, but he was obviously camera-shy. We’ve cancelled the hotel tonight and will see if it’s worth going for the next two days. At least I won’t have to water any plants! My elbow is getting much better, though I am going to organise some acupuncture as I’ve found a way to get some free again, after a break of 10 years of needing it. Hurrah! Here’s to another ten years without the need?! I’ve had a few days without painkillers and am using my left hand much more to lift heavier things without aggravating it, I’ve noticed, so as it’s such a rainy day I’ve decided to try a bit of crochet. I haven’t done any craft since before Easter when I made the chicken bags. It’s been odd having still hands in the evenings. This is not exactly a thing of beauty, it’s just six blocks I rooted out when I was looking through my stash sometime ago, but haven’t been able to join them. 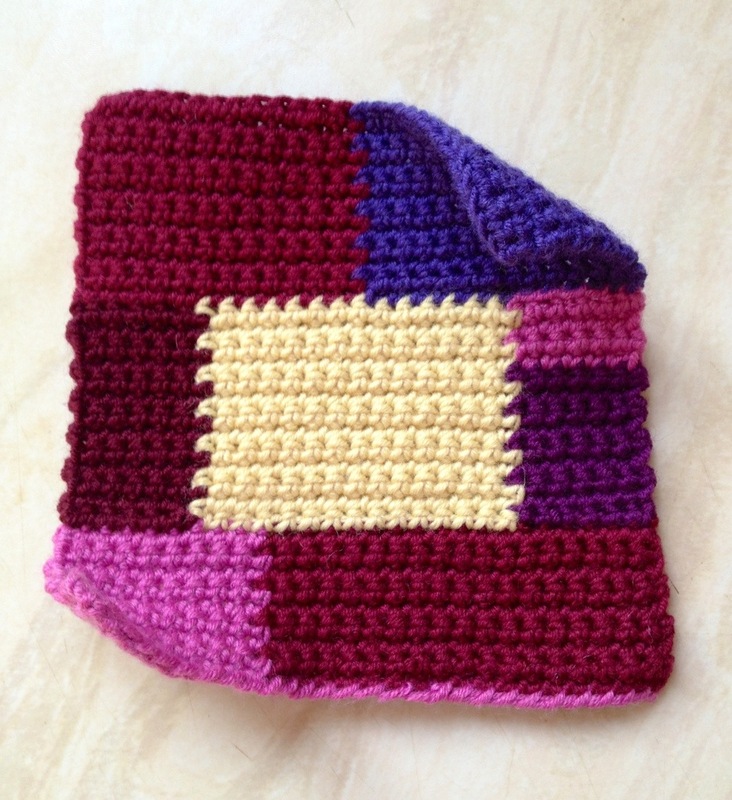 When I began crocheting the CAL blocks I made some test ones with Stylecraft Special DK before the posh yarn. I don’t like wasting things so I’ve decided to crochet them into a ‘thing’. 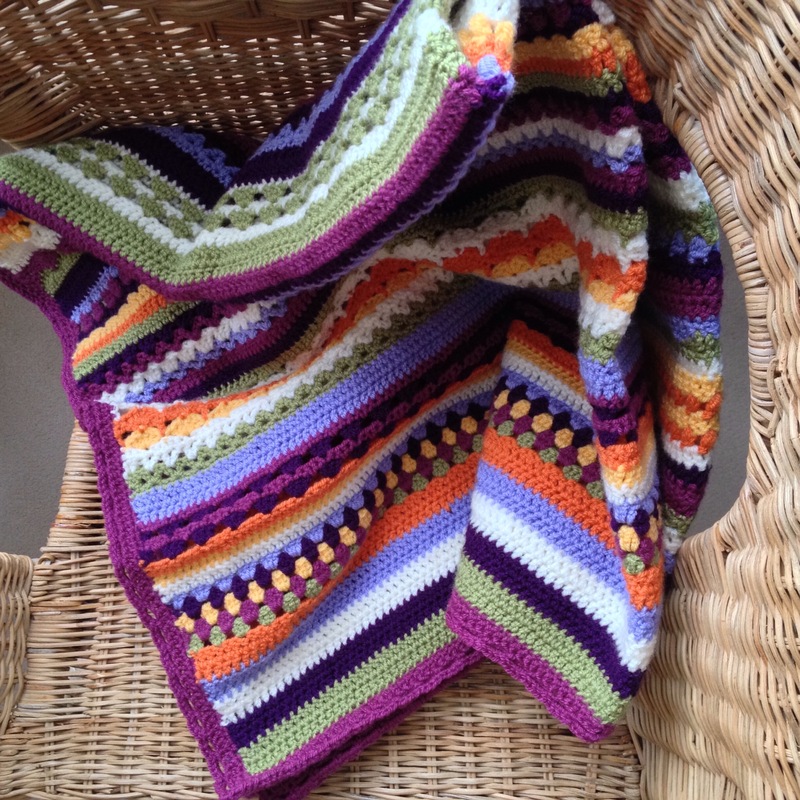 Maybe a dolly blanket to give away to children I know or donate to a Foundation Stage class. I don’t know where it will end up, but I know it’s been so lovely to sit on a rainy day and crochet a little bit just for the sheer pleasure of it. 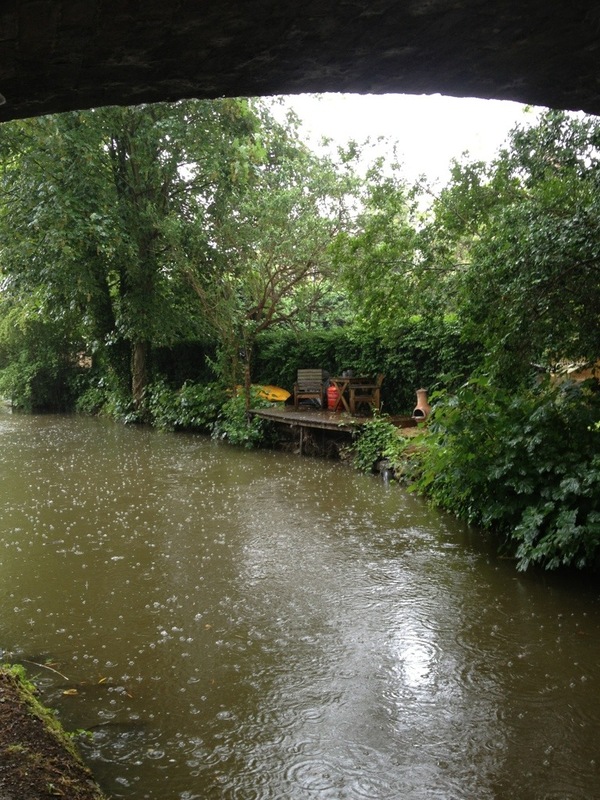 As I’ve been typing Someone’s decided to go fishing because trout don’t really mind the rain apparently, and when you’ve got good waterproofs it’s not an issue for humans either. 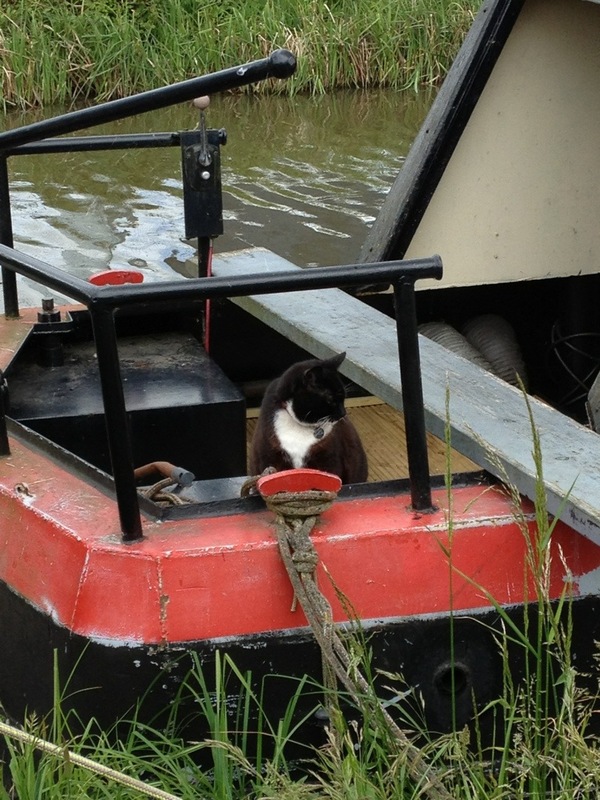 As for me I’ve declared I am doing “Bugger all” I’m so good at it too, it seems a shame not to try. 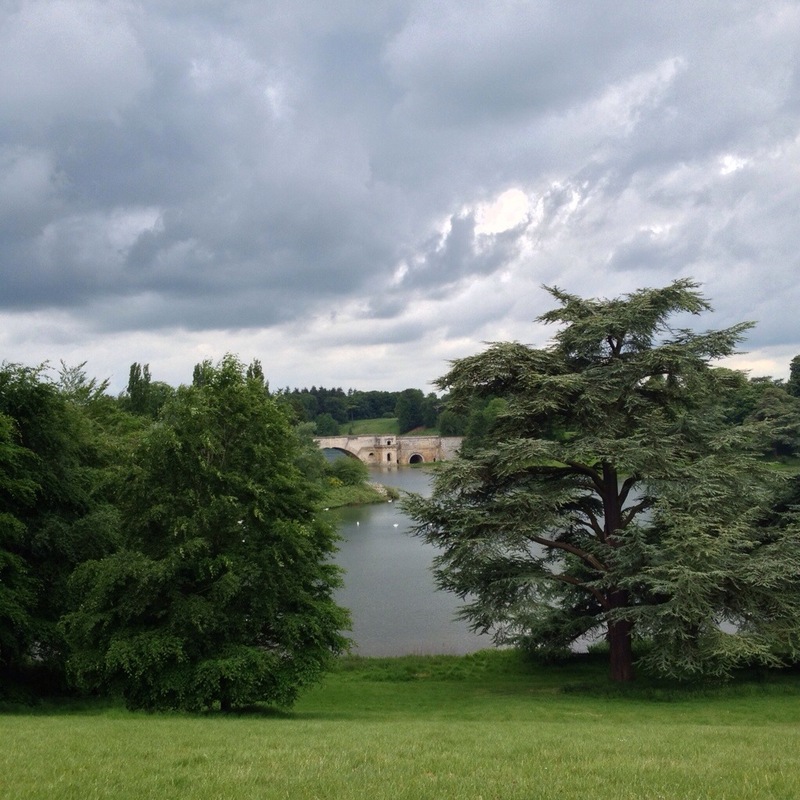 What’s the weather like where you are? Are you also curled up and making something today? 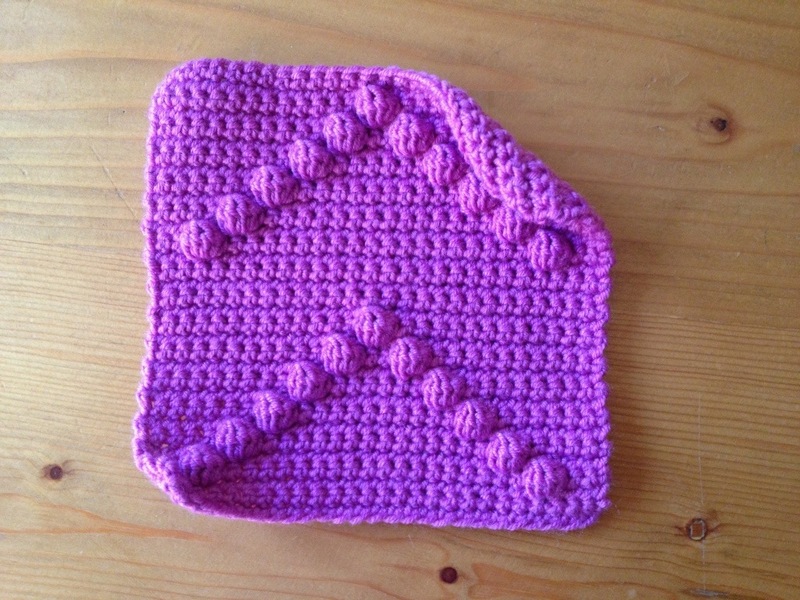 Week 43: CAL Blocks #205 #209 – THE END! What a lovely one to end on! So, 43 consecutive weeks of crocheting blocks and we’ve reached the end. :-D Well done everyone, it’s been fun. 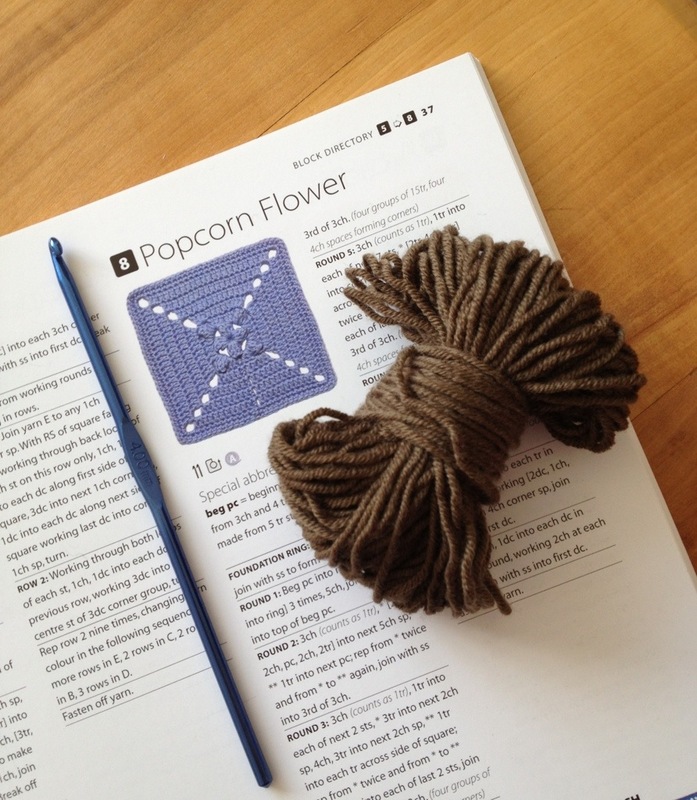 I’ve enjoyed being introduced to new blogs and seeing all the photos on the Ravelry CAL group project pages. Now we’re on Summer hols (ya hoo!) until September when we can post about blocking, joining, what we’re planning to do with our 128 blocks (!!!!) and share any issues or concerns etc etc. Here are my unruly blocks in the penulitimate post of the CAL for the September starters. It feels good! It’s been great fun, and good for my crochet skills in lots of ways, but I’m really enjoying the freedom from the schedule of making 3 blocks every week. 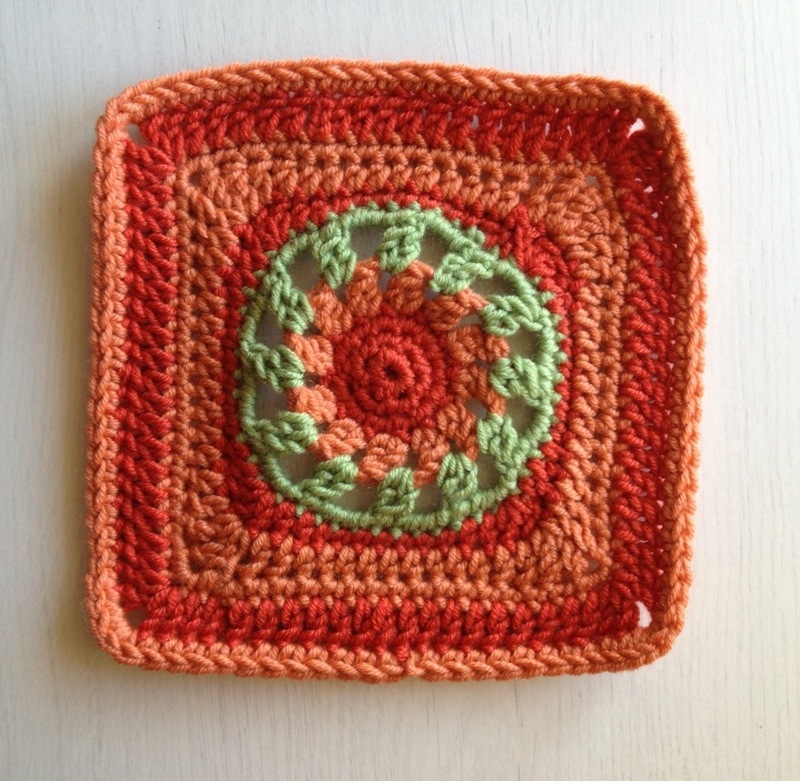 5 1/2″ sq-ish. with a bit of tugging out at the sides. You already know that I’m going to say how much improved all three will be after blocking, right? I like the texture of this stitch. 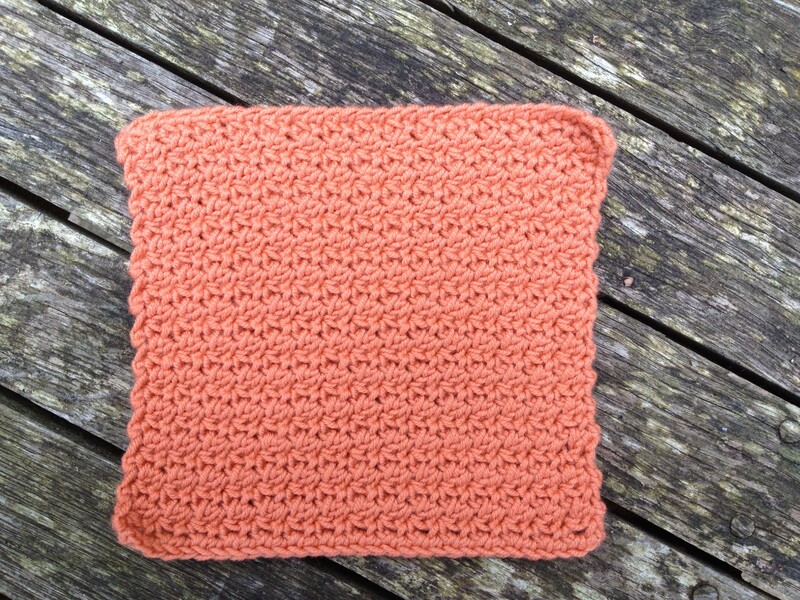 It might be a a good one for a dishcloth. 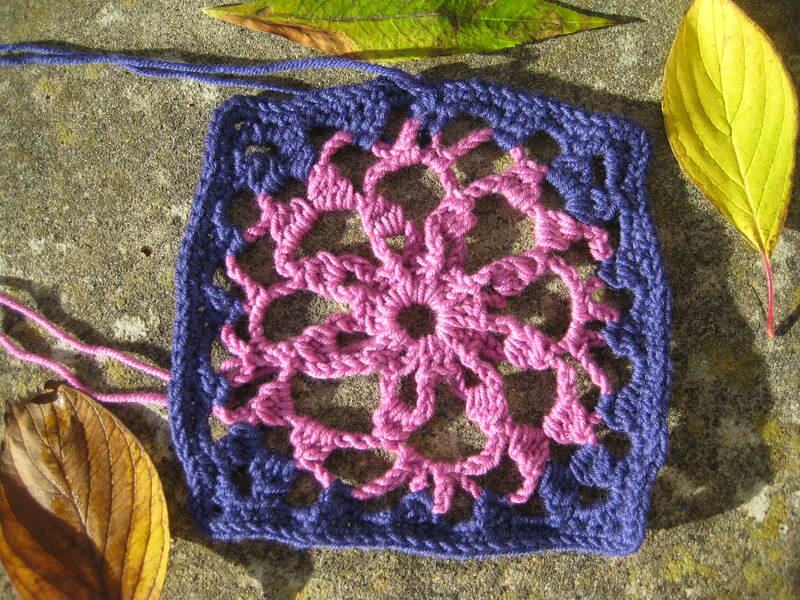 I like this, there’s a good contrast between solid and openwork crochet. R4&6 have a missing *. I just made a dc into 7 st then MB again. I didn’t read the pattern in reverse so my bobbles are more Zag-Zig, but I don’t think it matters for the sake of avoiding the aggravation of reversing everything. I increasingly feel that designers should include pattern details for lefties too. Why not? I’m amused, and a bit pleased, to see that new joiners are still coming to the Ravelry CAL group, despite the threads being silent for a long time. 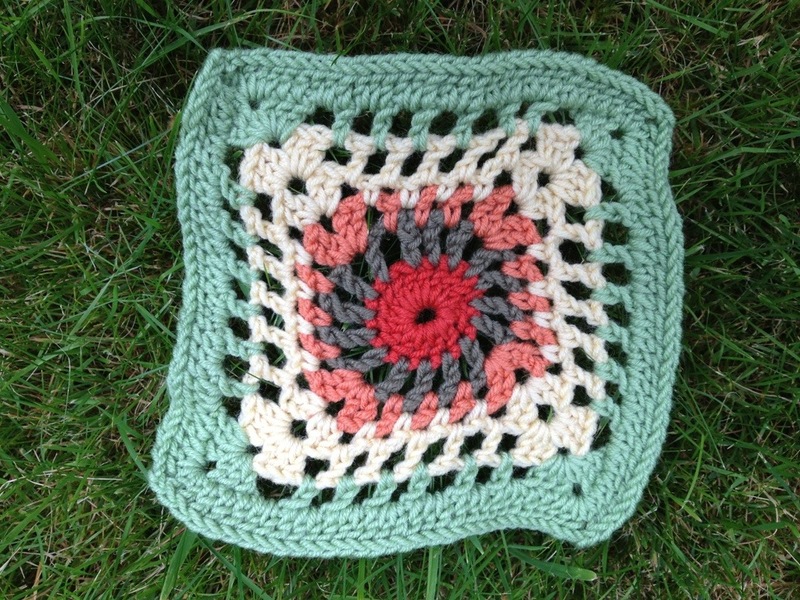 Check out the projects page to see lots and lots of blocks, people have posted some beauties. I’d cut down on the chains on R1 next time. Maybe 3 rather than 4 with my tension. OR: In the pink & blue! 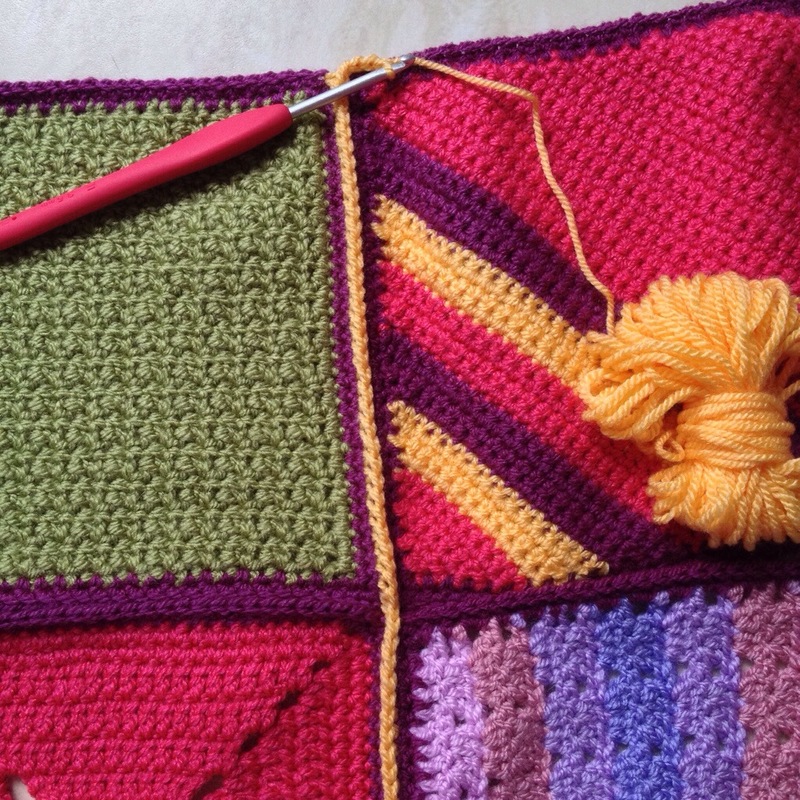 5 1/4″ – 5 1/2″ – will be when blocked. I’m glad this is the last corner squiffy sized block now. Such a nice design. 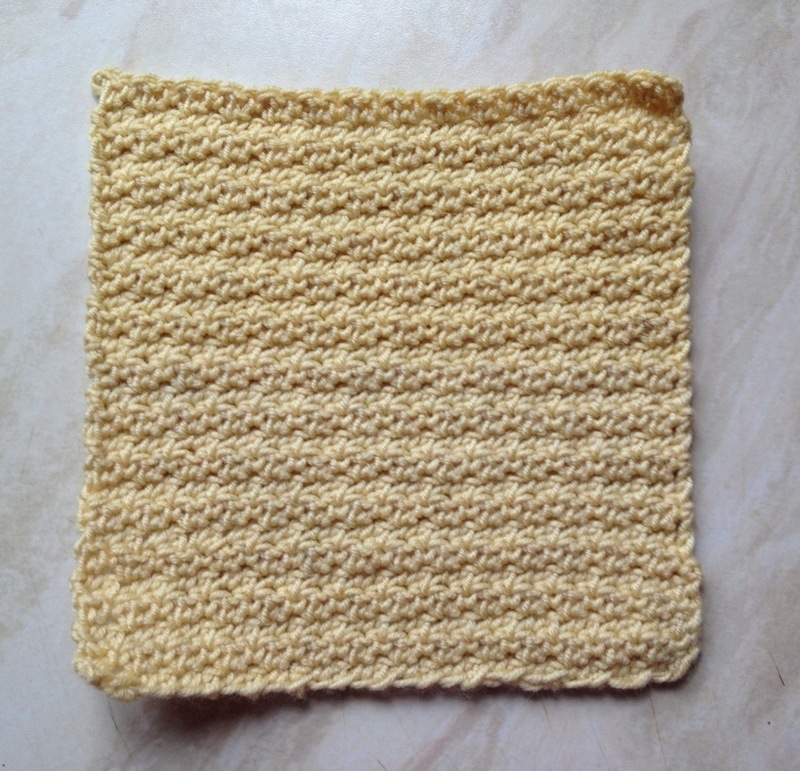 I’d like to experiment with this block using chunky, super chunky and very fine sparkly yarns. 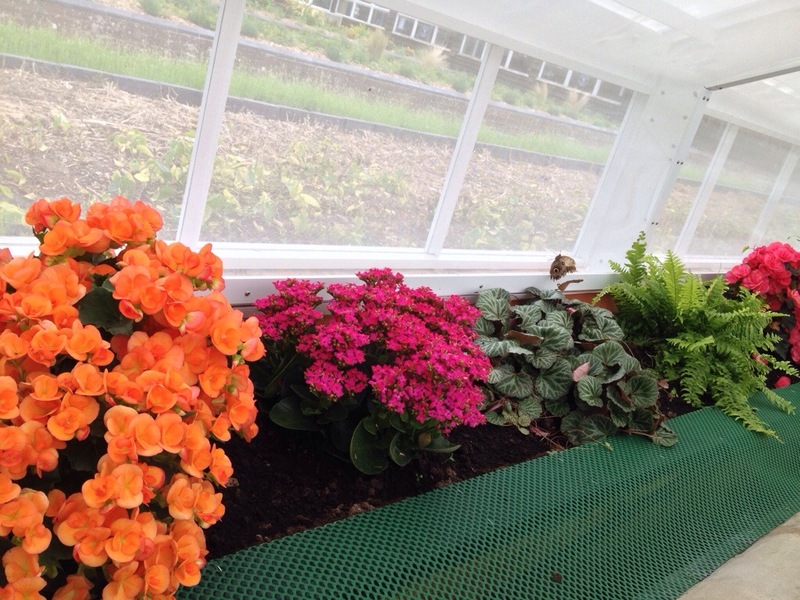 These are nice sort-of relaxing colours this week in contrast to the sometimes chaotic colours of other trios. I predict that come September when we all begin to join and border our CAL blocks I’ll wailing into the ether “Why WHY didn’t I block these each week as I went along?! !” It’s been dawning on me gradually that this would have been the sensible thing. Ouch. I’m pretty sure I can’t do the facial steam method which I used for the Yarndale Bunting, can I? It’s got to be pin and spray then leave to dry for woollen yarns? I really thought someone had thrown a gherkin over the fence when I saw this yesterday! I crocheted this one in September! 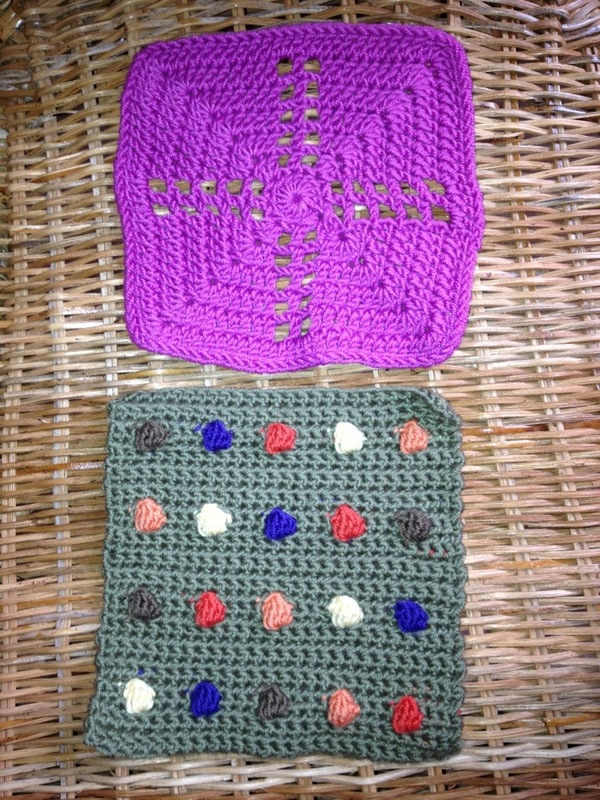 It was week 2 of the CAL (crochet along) and I wanted to check my colours and see how they looked. I decided there and then, at the end of the block, that I was missing an element and bought the yellow. Since then I’ve had serious doubts about my colour combination, but have yet to dig all my blocks out and place them together. 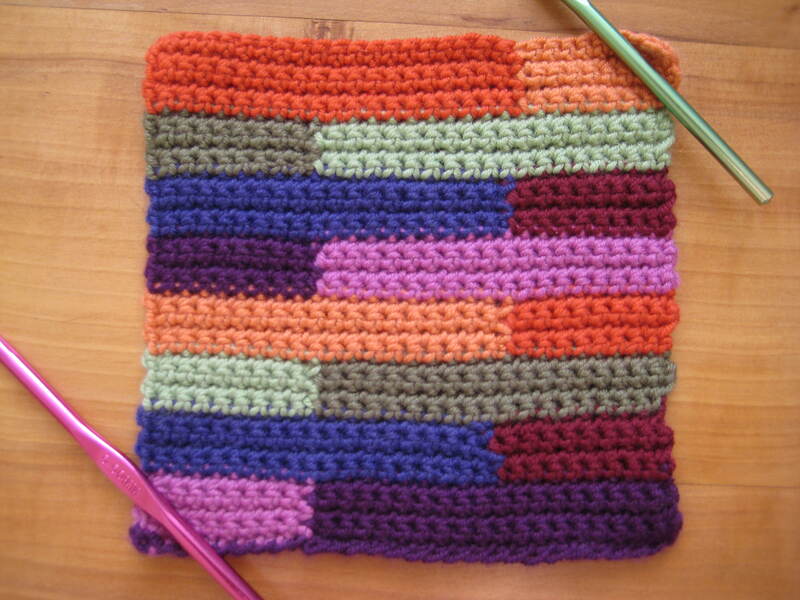 My plan is to do this at the end of the crochet part of the CAL. They’ll probably go together far better than I expect, but there’s still always the option to separate them and make a couple of smaller items if my teeth start tingling. I like the middle lots! After using the box colour I let the wool hang down behind the block as I worked with it facing me, I found this was a neater finish than my usual method of bringing it to the front ready for the return row with jacquard crochet, like I used for the Union Jack cushion front (still waiting to be crocheted together with buttons sewn on…oops.) I worked over the main colour as I double crocheted the boxes and you can see the strands a bit on the yellow boxes because of the colour difference. I know if I stranded them across the back of the block I’d fiddle with them all the time and eventually break them off if it was in a blanket I was snuggled beneath. I have to be honest and say that I’m a bit fed up about this one. It’s not just not neatly straight at the side of the trio like the book’s and like Rainbow Junkie’s perfecto block. I’m not altogether sure where I’ve gone askew. Is it the yarn do you think? Being baby cashmerino it’s thinner than the DK that most others are using for the CAL. Shall we blame the yarn?!!?!! I finished the last stitch before the first of the box with the new colour, and my Union Jack is pretty neat using Styelcraft special DK in this way. So really, it IS the YARN!?*?!!! Week 40! Wooo! 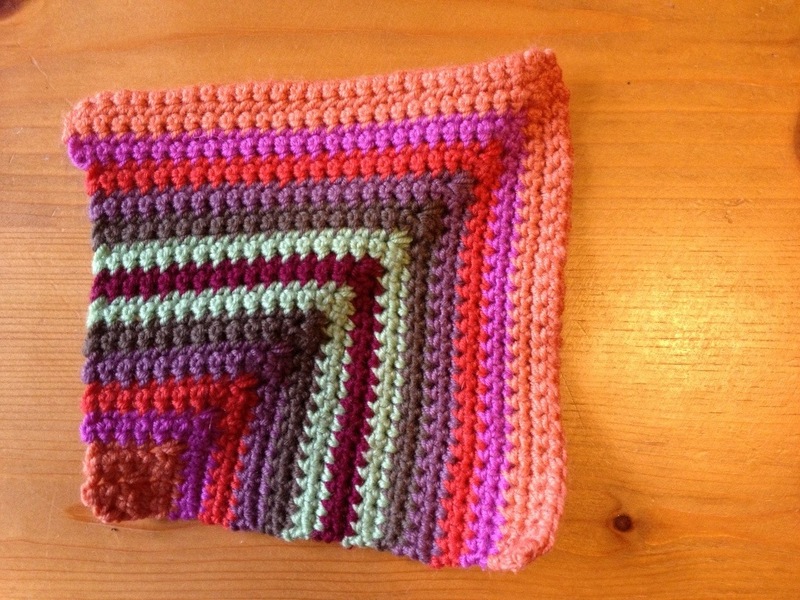 I’ve been on a bit of a crochet bent lately and SO…….drum roll please: I only have 3 more blocks to crochet. Yes! 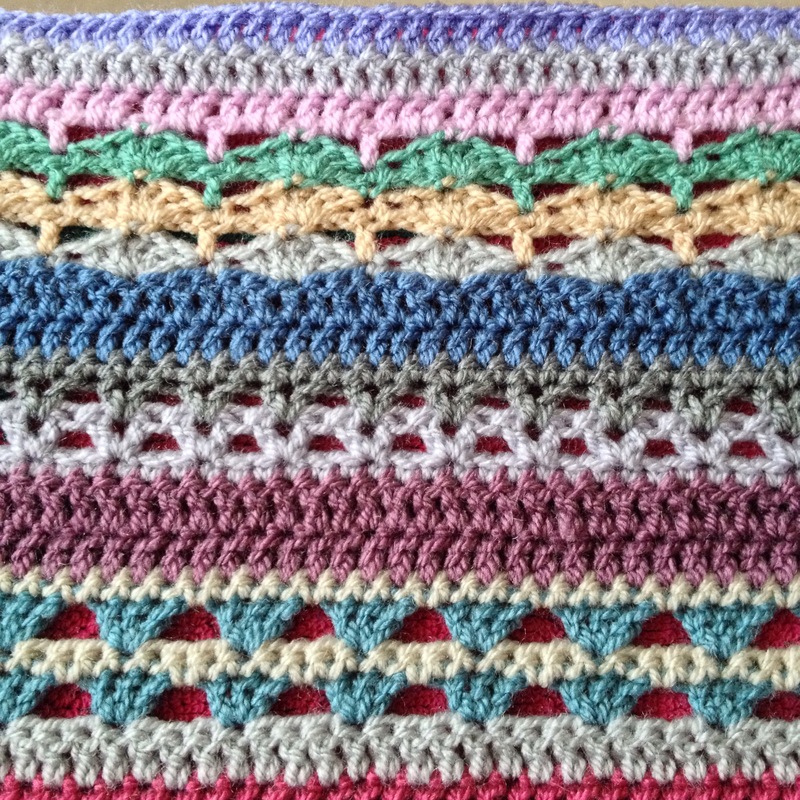 Thanks for your feedback, it seems that my suggestion to pause at the end of the crochet part of the CAL for a long summer break is a good one. I’m glad you agree. We can begin sharing blocking and joining methods, maybe asking for placement advice and generally talking borders and blankets etc from September. I’m looking forward to thinking about other things in the meantime and know that I’ll be feeling refreshed and ready to take on the mammoth blocking and joining part. Also as Manty from A Little Patch of Heaven says it will give her, and the others who came to the CAL later. a chance to catch up. Have a very happy weekend all. Here it is in all its wibbly mid-joins ‘glory’! I did seriously consider redoing this but decided it’s going to be the ‘eccentric looking’ block in whatever it becomes. It can stand as a testament to an afternoon of good conversation, and no crochet stitch counting (! 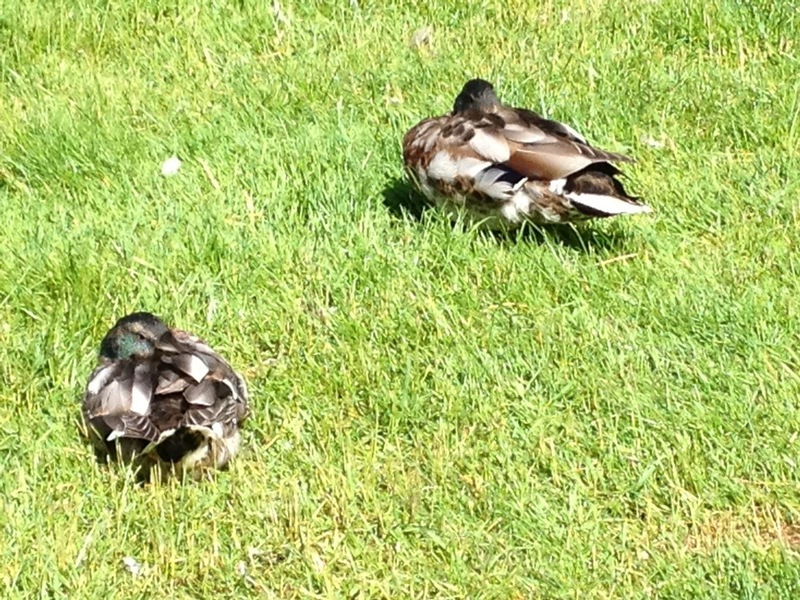 ), with a friend. R8: I trebled into the chain spaces as I prefer the way it looks, and let’s face it – it’s far less fiddly! It looks fine to me. R4: Ignore the instruction to treble into 2 stitches, I’m sure this is another typo and should be dcs as for the rest of the round. 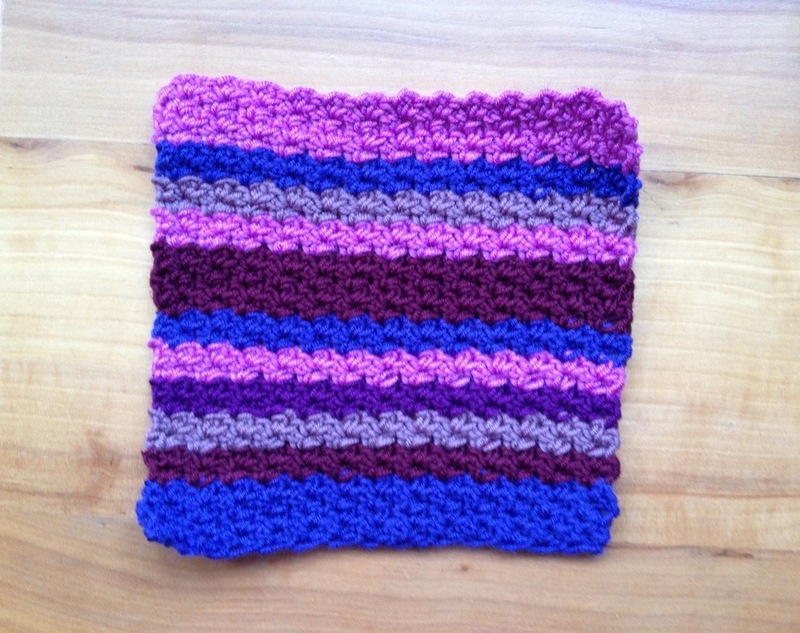 All three are 5 1/2″ square. Are you a bit fed up with these CAL posts? 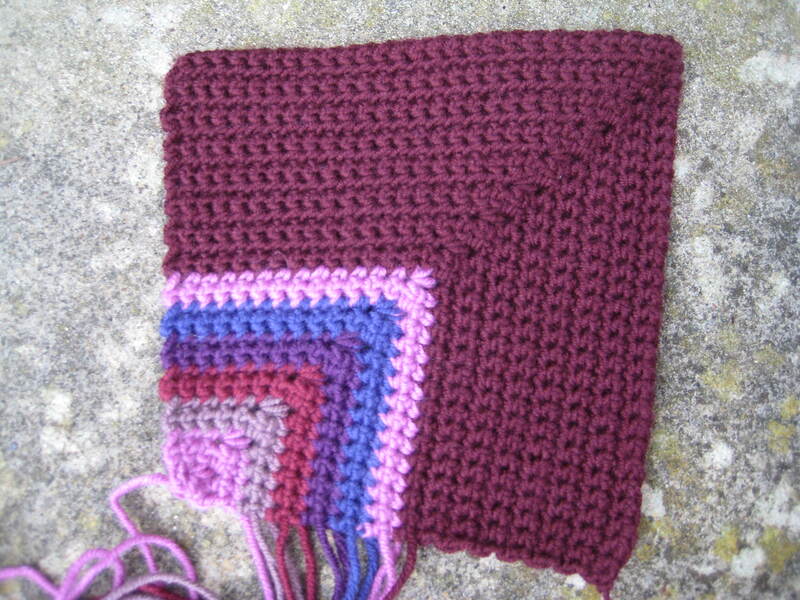 I’m over it really, or feel so this week, BUT I’ve only got ten more blocks to crochet and that’s it….HuRraY! 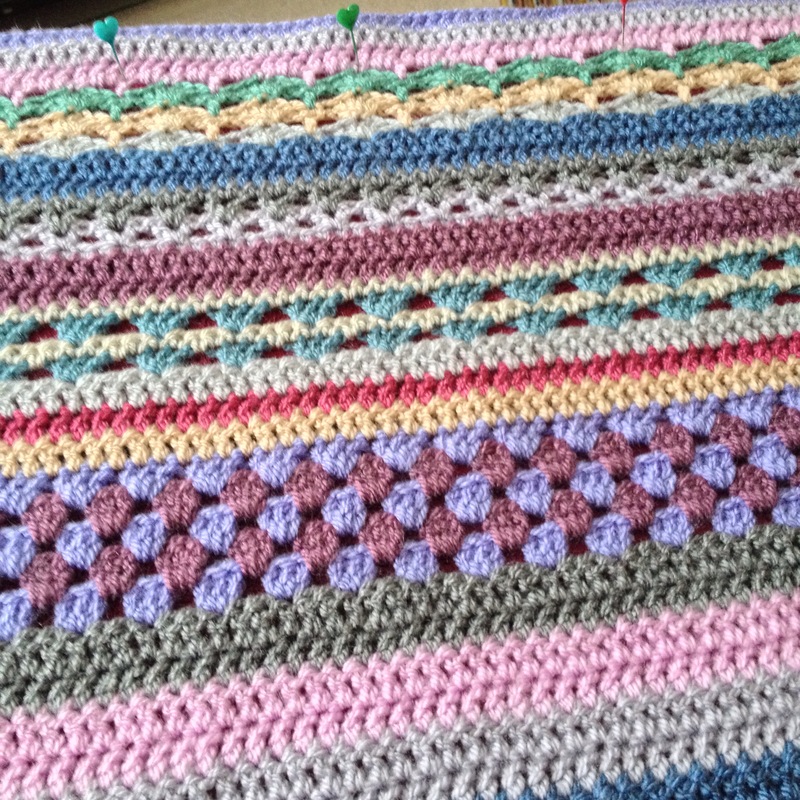 JOINING MATTERS…….I was wondering if it’s better to continue on after the last CAL post and set about joining blocks, or shall we have a bit of a CAL holiday and save the joining for the autumn evenings? 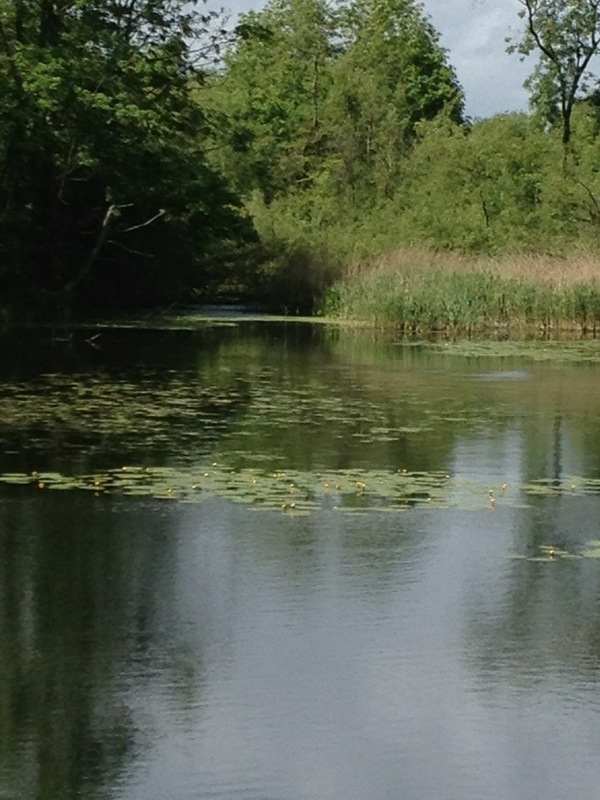 We could aim for a September start (ie a year after the CAL began…..!!!!!) Let me know what you reckon here or on the Ravelry CAL group thread. Here’s Lynne’s Knits giveaway prize which arrived when I was here in the Little Room waffling at the end of last week’s CAL post. I was delighted to win this book because it’s by THE Debbie Bliss, but also because I won it from Lynne. It was her patterns I found I kept gravitating to in Let’s Get Crafting Knitting & Crochet magazines as a newbie crocheter in 2011. Come and say hi on my Facebook page! As I find for some of my middles this is a bit skew-whiff (as I type this it occurs to me that it’s probably one of our very eccentric English expressions?! ), but the blocking should adjust this issue. Fast to make though I’m not keen on the mid-round joins as usual – they show in the book’s block too. More bobbles! I think for many of us bobbles have turned out to be the star stitch of the CAL. They’re so cute and give a nice texture to the crocheted fabric. As you might have guessed this is the last of the batch of blocks I made ahead and photographed when England still knew what the word sun meant, when we weren’t velcroed into our raincoats, clutching mugs of hot chocolate. I’d also already made #157 Boxed Square, part of next week’s batch of three, but might redo it as the mid-round joins are so wobbly. We’ll blame my very chatty friend for the wobbliness, honestly she gives me a run for money, which is saying something. Then I’m back to crocheting the blocks as I go, week by week. It’s been about a week and a half since I last crocheted anything. After I’d made the two striped backs for the Union Jack cushion (which needs buttons, I’ll buy some at a craft sale I’m going to tomorrow) I moved onto a bit of a sewing jag with the Puffy Dog bag as I can’t help calling it. Now I’m doing a bit of X stitch, but after seeing that Lucy off Attic 24 and the planned autumn craft event Yarndale are requesting Granny Square bunting and feeling that I should get on and make some mice for the Mile of Mice KAL/CAL I’m getting itchy fingers to take out my hook again over the bank holiday weekend. I’ve won this Jane Mean’s ribbon from a giveaway hosted by the shop All the Fun of the Fair. Isn’t it preeetty? I’ve gone from never winning anything, ever, to a few things in the last year. This week I won another giveaway! According to Jill of Nice Piece of Work I am a “lucky flipping fish.” Well, ok then. I hope it carries on! 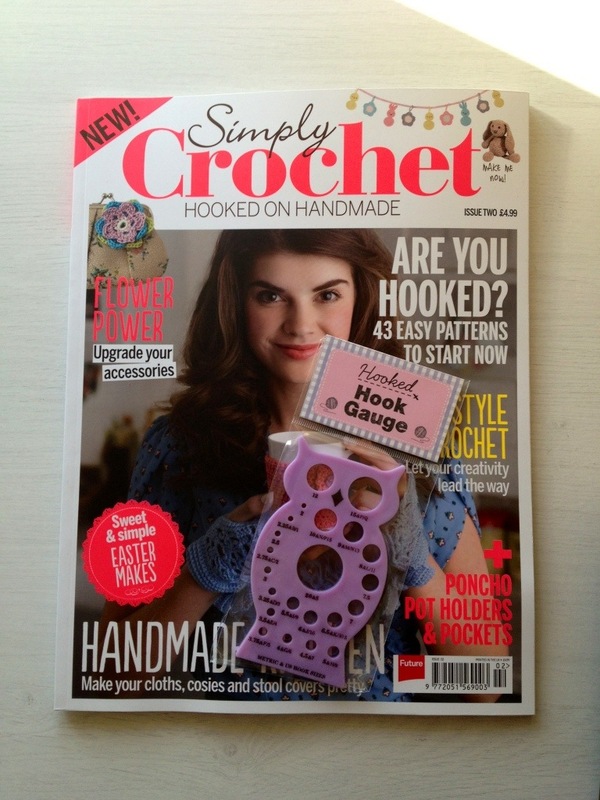 And, I think my latest win just landed on the doormat, along with the new Simply Crochet magazine. Ooooooooh! I’ll show you next time I pop into The Little Room. 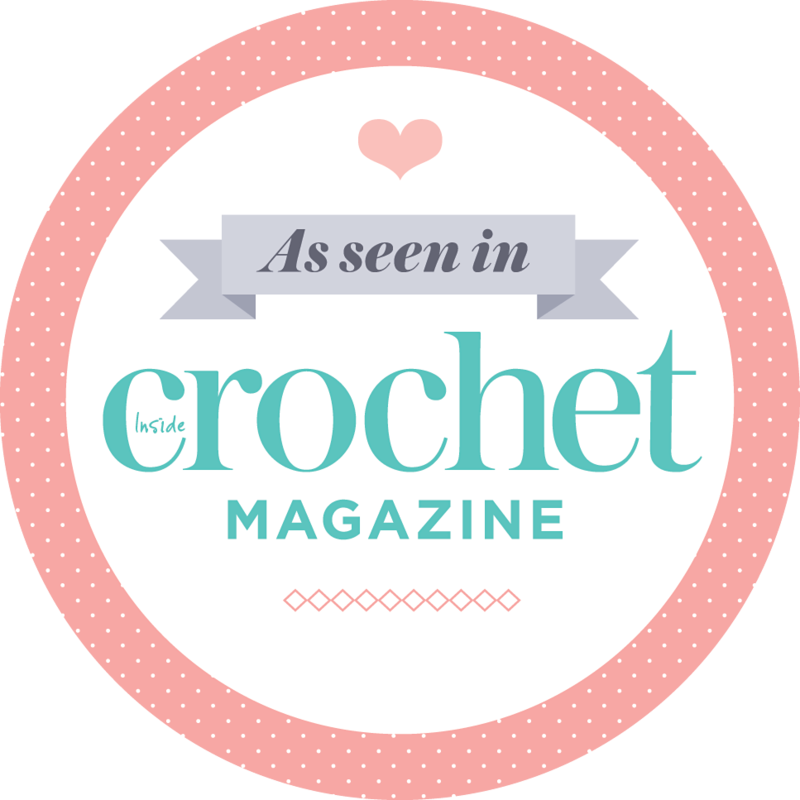 Are you planning on crocheting, sewing or …. this weekend? Whatever you do have a relaxing one. 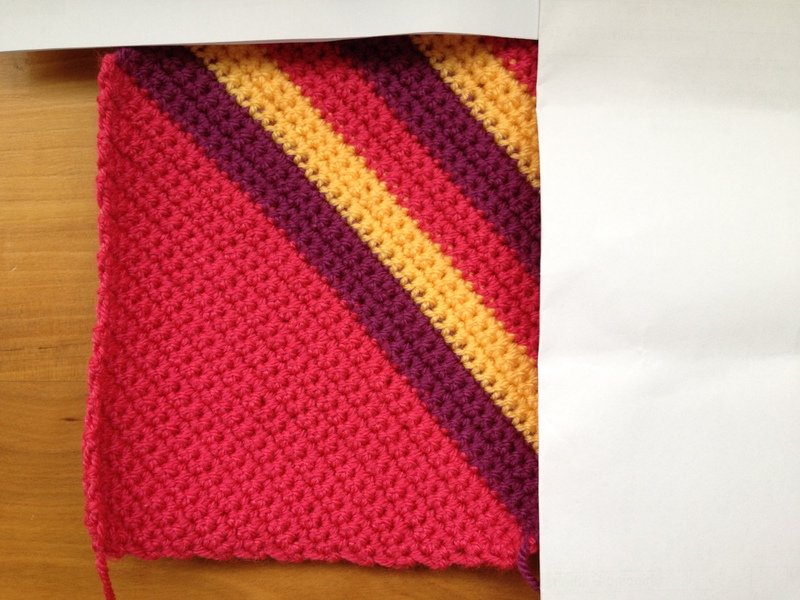 This turned out to be the week of some very dodgy colour combinations…. It’s beginning to dawn on me that I’ve referred to future block-blocking so many times that now I have 37+ weeks of it ahead of me. How about we have a BAL next? 3 blocks a week and we post about how successful we are finding it, plus share any tips and techniques? No? Ok.
5 1/2″ W, 5 1/4″ H. Can be stretched out pretty easily as there’s lot of give. I took these photos a few weeks ago, but actually the sun is shining today and all feels well with the world. It is funny how so many bloggers refer to the weather; I suppose it’s inevitable because of how it affects our activities and moods. I’ve been longingly looking at Aussie and Kiwi bloggers’ pics all winter: sunshine, beach picnics and cooling drinks. But now it’s all hot chocolate and hot water bottle covers! Speaking of which, have you seen Kate’s HWBC of Greedy for Colour? And this one. I’ve been checking out the other block maker’s blogs this week, after getting a bit behind on my reading (BlogLovin said I had 95 unread posts the other day!) There are a band of us still plodding onwards. I can’t believe we’ve been going since September. Well done everyone! 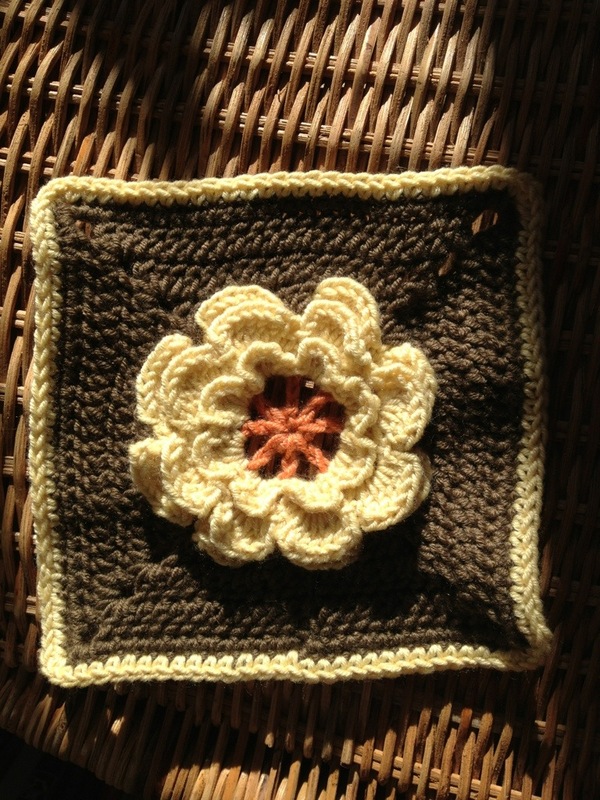 Yesterday a bloggy good friend sent me a link to crochet workshops at Loop, London. 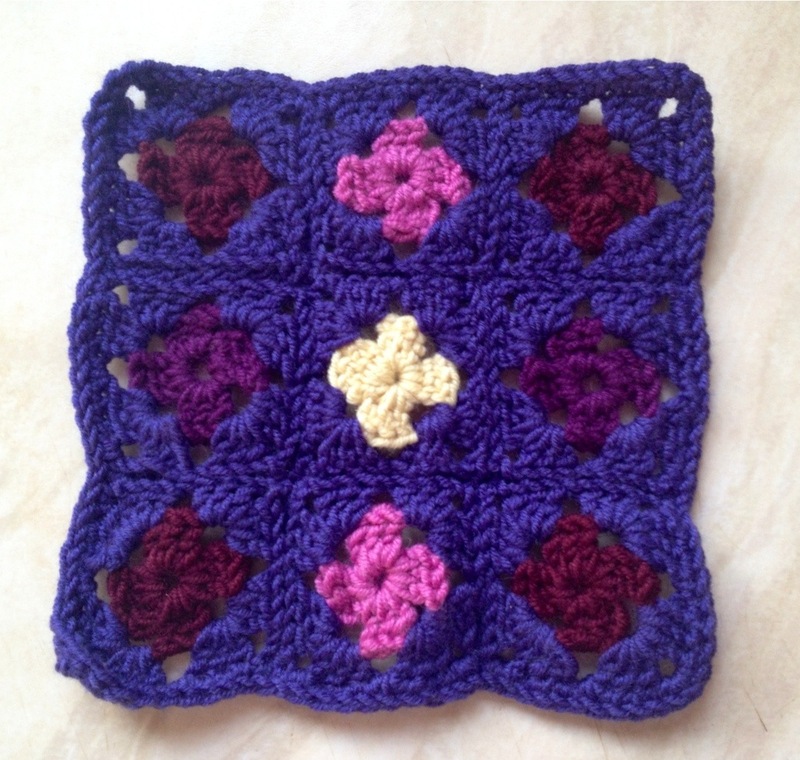 Looking at the skills they teach I realised how much I’ve learnt and practiced things like changing colours, following patterns, trying new stitches and just gaining confidence with crochet through doing the CAL with you guys. If little and often is a good way to learn and hone something new then a CAL is definitely a good, sociable, way to do so. 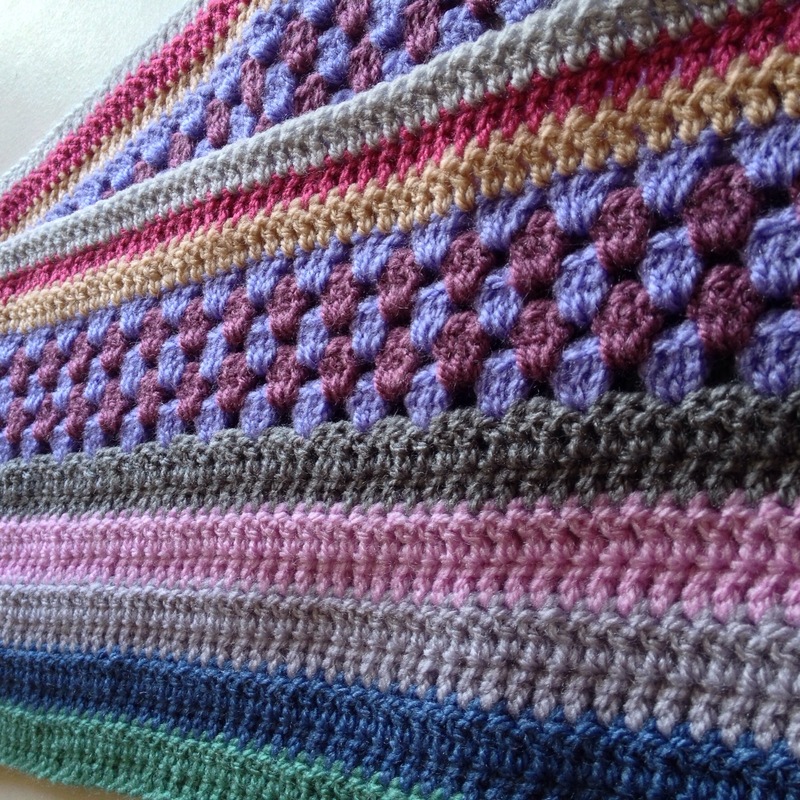 If you’re newish to crochet then I’d consider starting a CAL (or joining an existing one on the Ravelry website.) 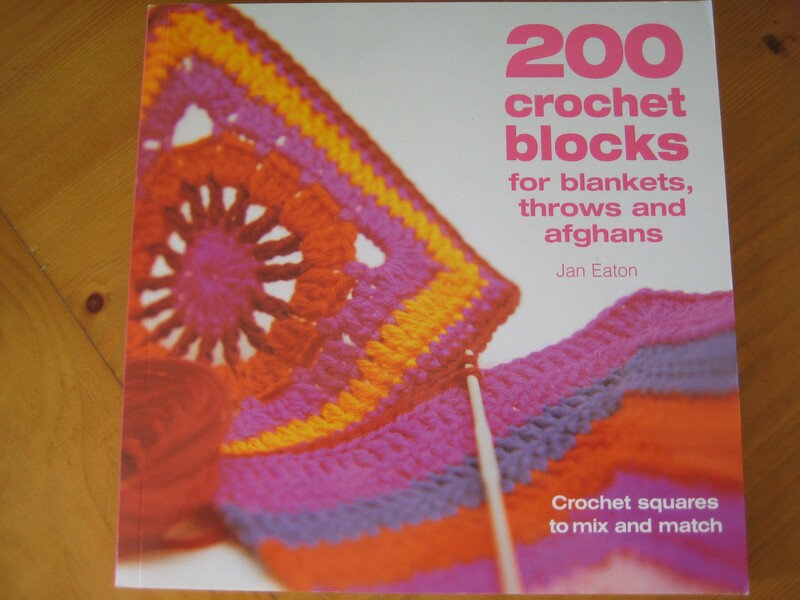 You could always buy the Jan Eaton 200 Crochet Blocks book and start another round of this CAL. 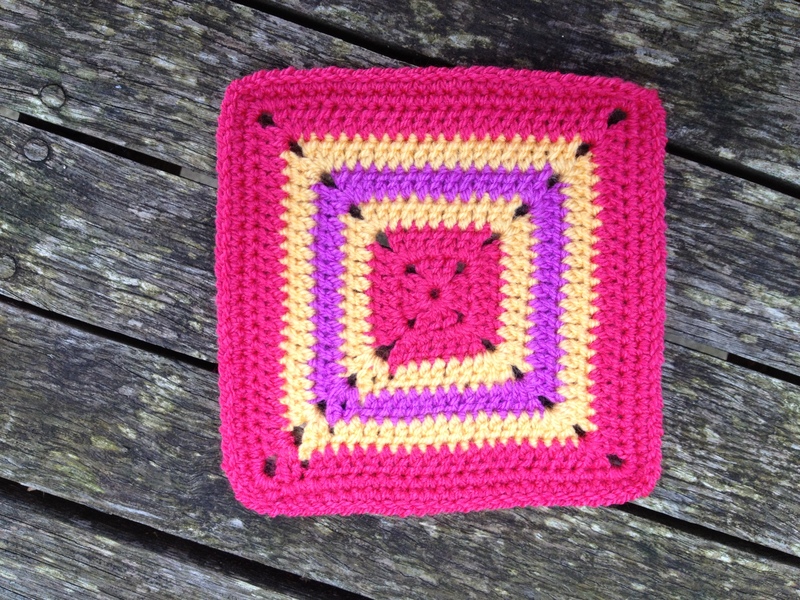 Talking of sociable I crocheted #157 Boxed Square with a friend last Friday afternoon. She knitted a sock while I hooked away. It was a really nice time but when I’d darned in the ends, still chatting merrily away, I looked at my mid-block joins and honestly, they are like a wave. Lack of counting, lots of chatting!!!!! I should probably redo it, but it’s one of those dc dc dc dc dc dc blocks. Argh! What have you learnt doing the CAL? If you’re not CALing with us, has it inspired you in any way? 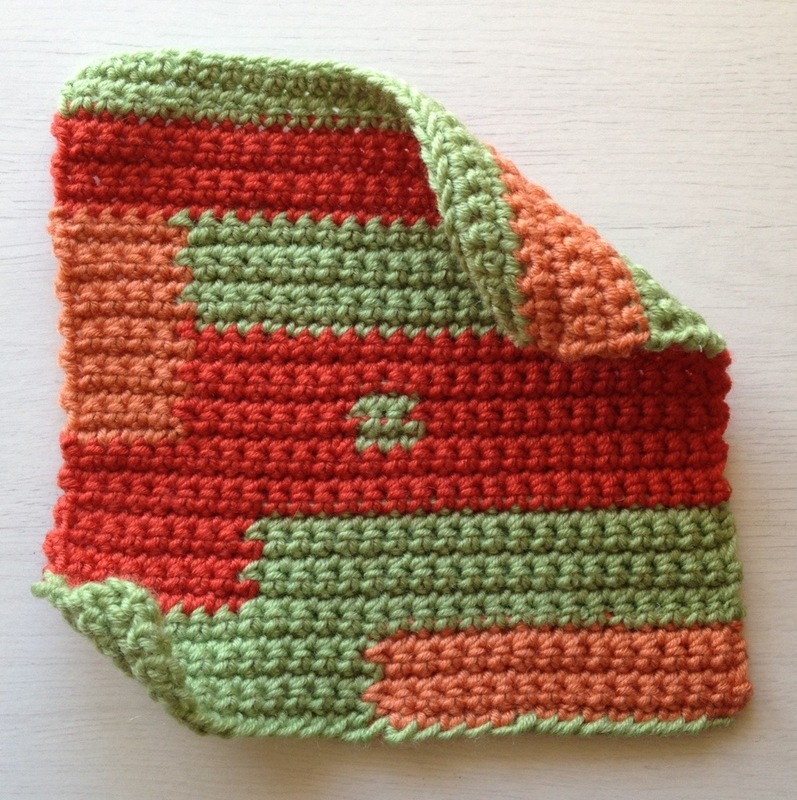 5 1/4″ -5 1/2″ but should even to 5 1/2″ with a good blocking. 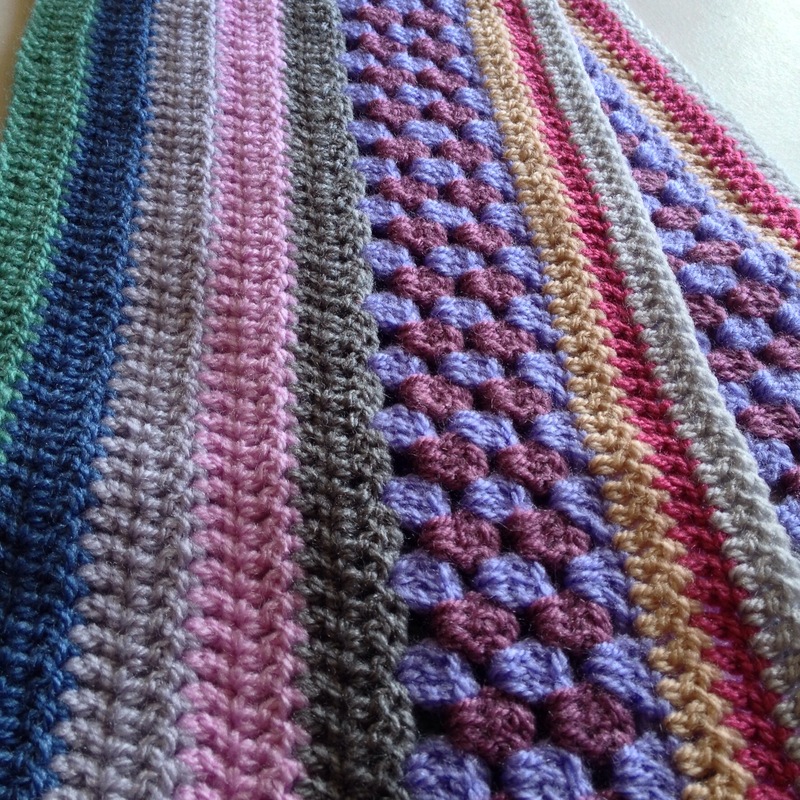 I crocheted the first 3 rows then started again with 4 ch as couldn’t see the point of the 2 extra ch hanging down. Is this a pattern error or did I miss a point? My notebook bluntly says ‘Dislike. Floppy. Should try with a 3,5mm hook.’ ! 5 1/4″ sq but am sure can be eased to 5 1/2″ under steam or water torture! 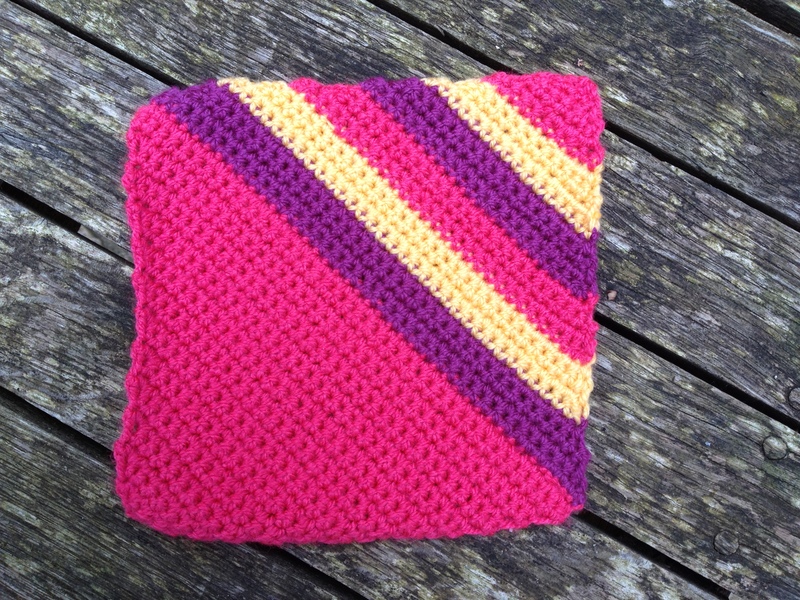 Another one of those ‘bit of a swizz to increase the block count’ stripey dc one IMHO. Pretty isn’t it? 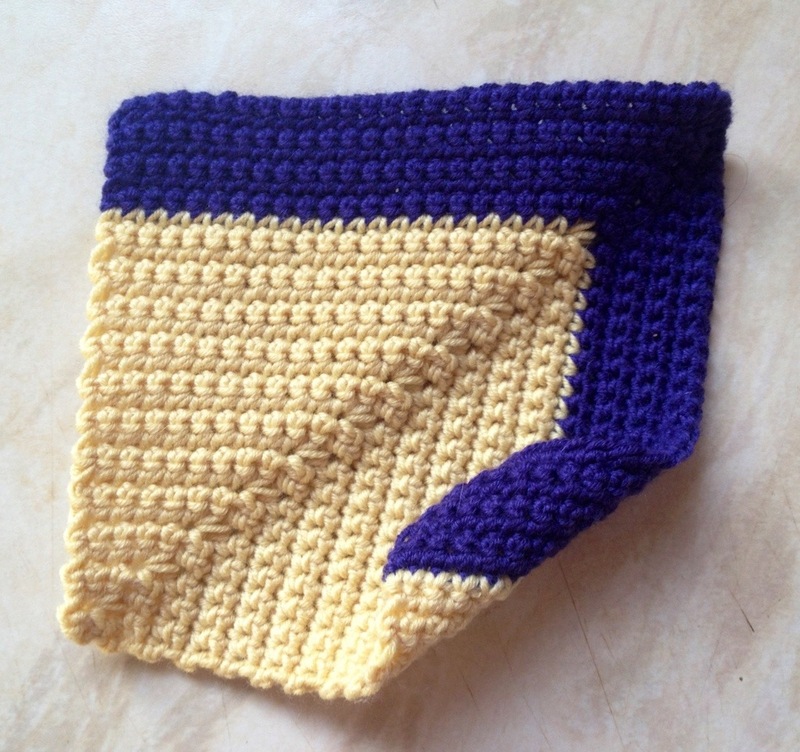 But a bit scrunched up at the moment, so to complete the triple – will be improved with blocking! 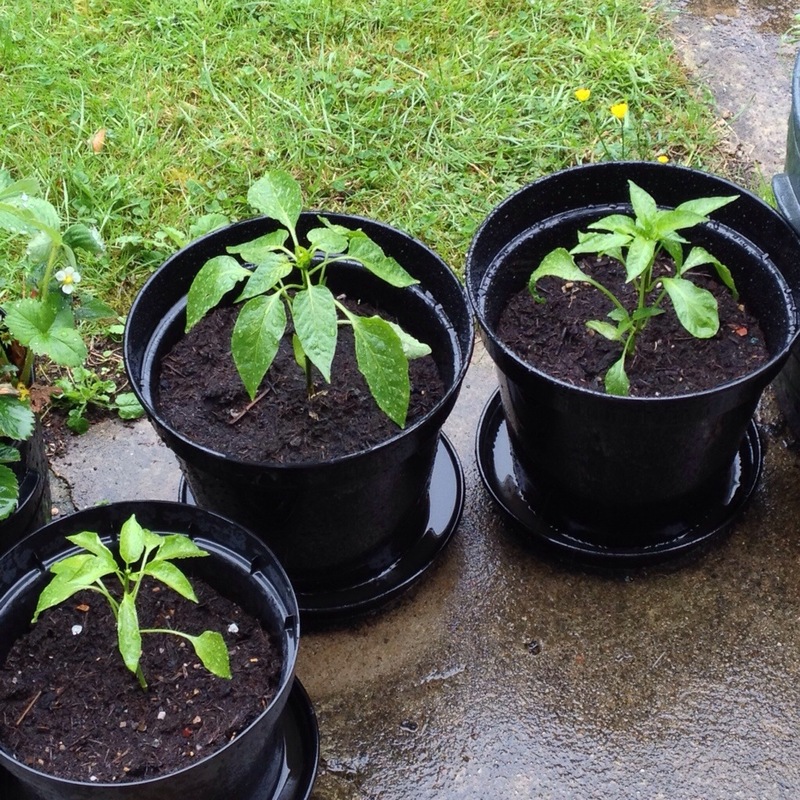 They all look a bit unruly this week, don’t they?! If you’re in the UK you’ll realise that this photo was not taken in the last few days. After all the sunshine of the past weekend (Britons were in full force wearing their sandals and freshly ironed t-shirts) we now have news of ferries not running due to windy conditions and trampolines blowing away! I admit that I am actually quite a few weeks ahead with the CAL and this is one of a batch of photos of blocks. I decided to forge ahead and then concentrate on other things for a while. This week I’ve started a project from the Hip Crochet book I won. I’ve also been doing some embroidery. I’m now very dubious about the design, or placement of what I’ve chosen, but I’m assured that it’s fine. Ho hum. I’ll complete and then show you. Hello to all my new followers by the way! I’ve noticed a steady increase lately. It’s a nice way to check out new-to-me blogs and look around. There are so many of us sending photos into the void and chatting away, it’s amazing what jewels you can find. Anyway, it’s your turn to talk. How are you? Are you busy with craft or have other aspects of life taken over at the moment? 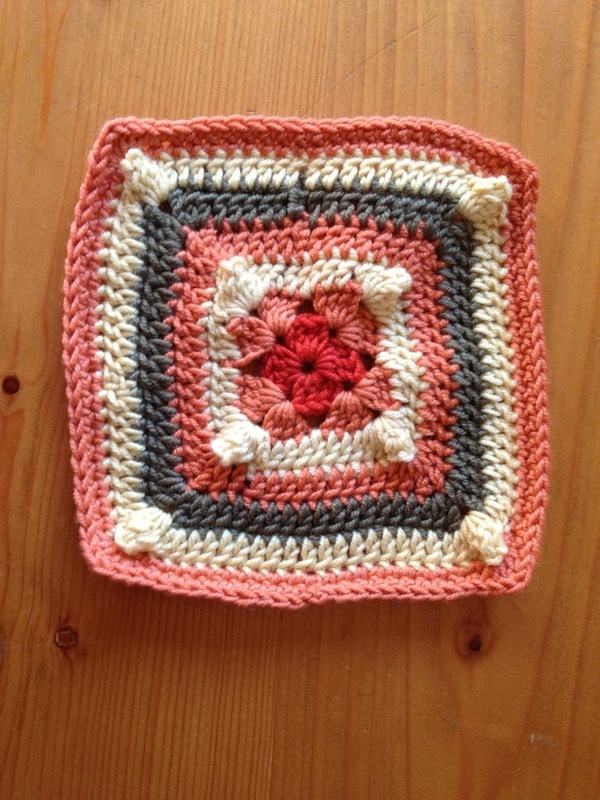 It’s big one – 6″ sq. There is something about the different way that this pattern is written which makes me wonder if it’s by Jan Eaton. All in all it’s tedious to crochet and I don’t like the feel of the fabric; it’s too dense. My mid block joins are a bit messy. I prefer them on the corners generally. On a more positive note I like my colour combination! Pretty, I like the cross effect that the chain spaces create. #100 Pastel Delight / Block 100 delight! 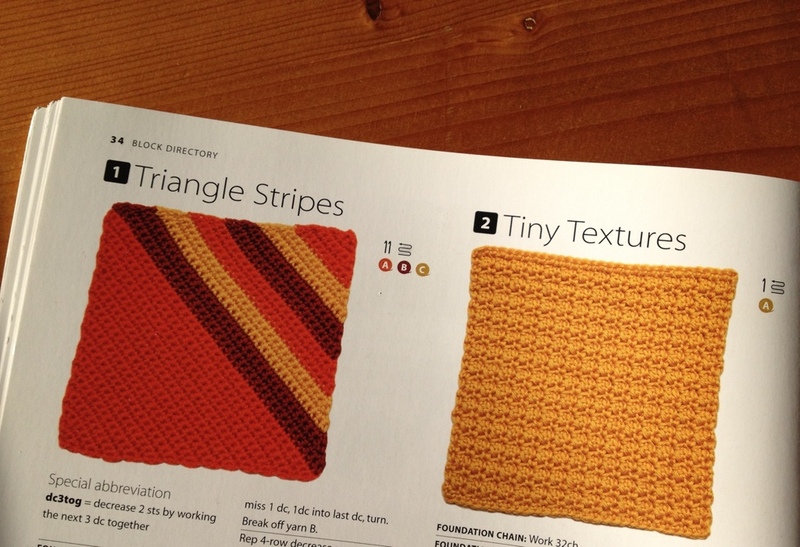 Bit boring to crochet if you made a whole blanket from these blocks – according to my CAL notebook. 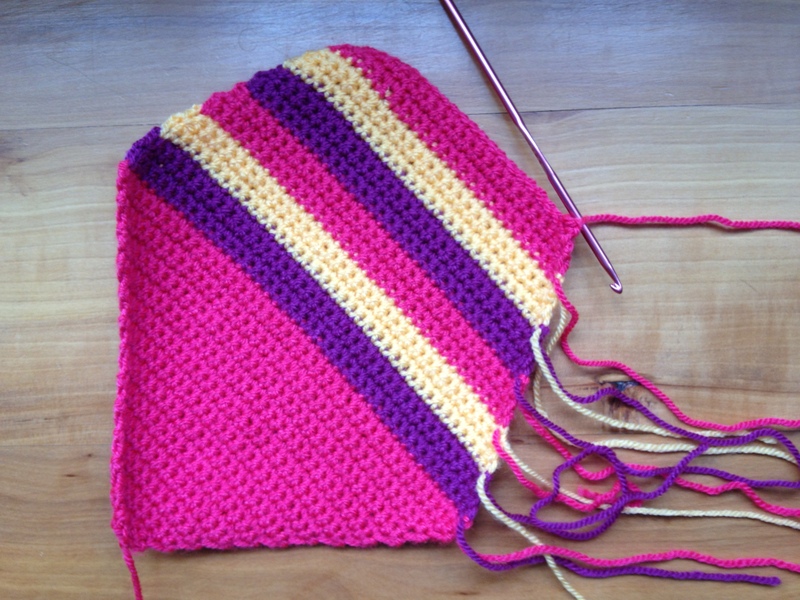 These dc stripey blocks are a bit of a swizz – a filler for the book’s block count. I’ve photographed this upside down! If I rotate the pic the angle makes me feel vertigo-ish so I’ve left it. 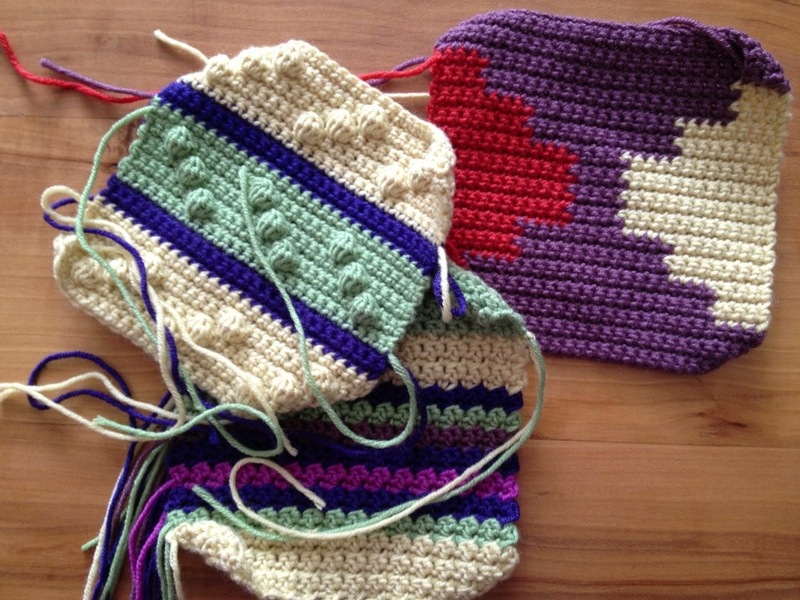 Confession: I’ve also crocheted next week’s blocks this week because I haven’t got anything else in progress at the moment. I fancy doing some hand sewing so will do a bit next week as I’m ahead with the blocklets. I won’t post them early though, I don’t want people to feel they’re behind when they’re not. 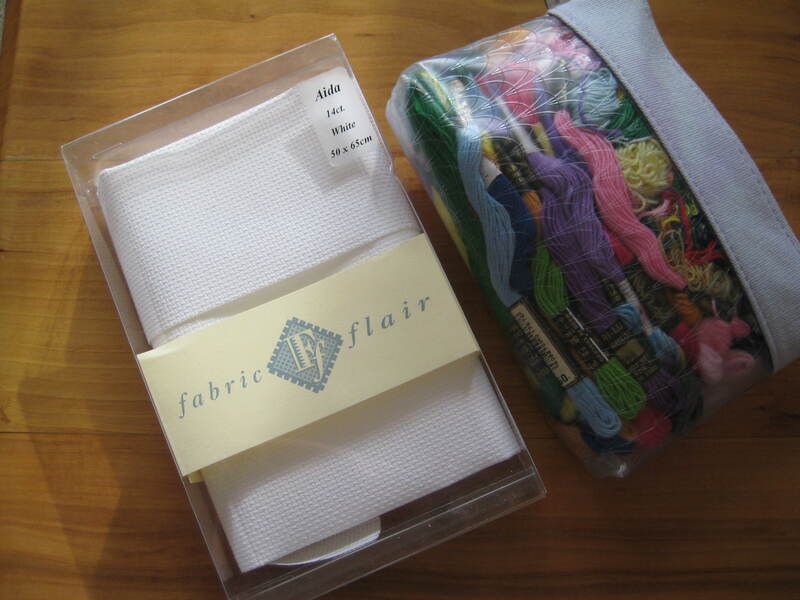 I’ve got a pack of felt, some threads and ribbons so will see what I can come up with. 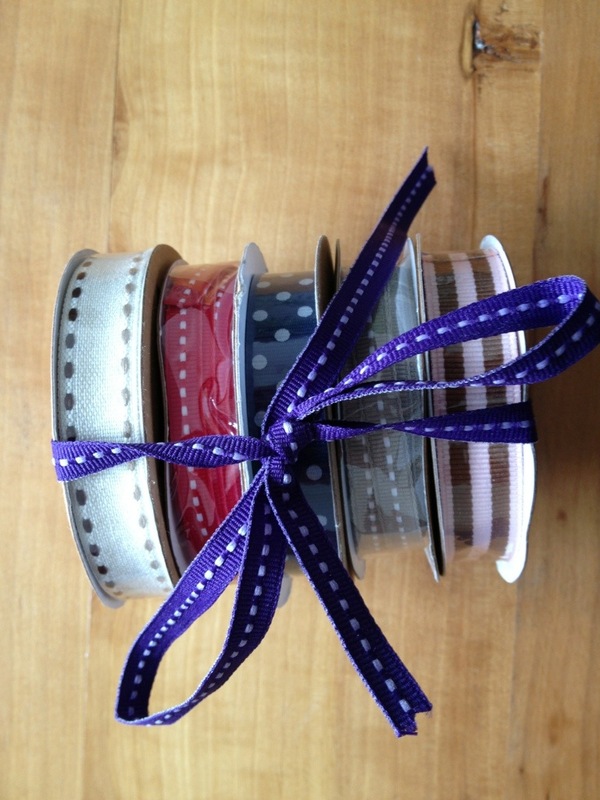 Oooh speaking of ribbons – guess what? I WON five rolls of three metre ribbons this week. :-D I’ll post a pic when they arrive. I’m in declutter and scrape the dust off the surfaces mode at the moment. It must be bad because at one stage I stopped singing along to Louis Armstrong and found myself doing an “Oh myyyyyy god” at the billowing clouds of dust that were between some of my folders. Shameful. Have a creative weekend, if you can, everyone! I ran out of apricot (I’m using every last scrap of my baby cashmerino) so there are 3 rows of sienna to finish at the top. R4: ‘Break off yarn A’ ?! R5: Repeat row 1 but note that you’re going to ch3 then 1 tr into the next 2 ch, not 2 tr. R8: At the end of this row I was confused dot com, why did I only have 1 tr? 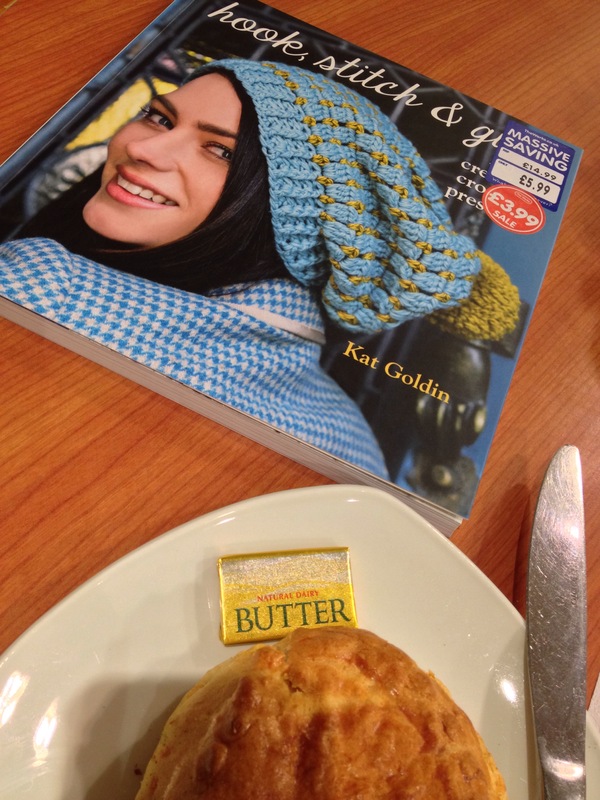 I looked at the book’s photo – it’s all back to front compared to mine! I guess if a leftie wanted to create something identical then you’d need to reverse the pattern, starting from R4 > 1. Are you wondering what I’m waffling about? 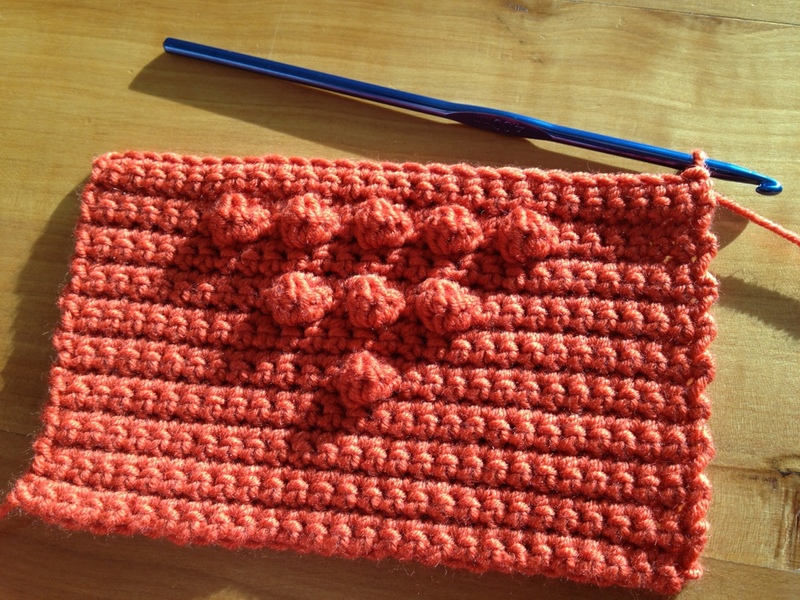 Well, basically left handers crochet rows from left to right, rather than righties who go right to left. This is why my holes go up to the left and yours will go to up to the right as in the book. I quite like being different to most, it suites my sometimes contrary character. At school once out of a huge group of sixty, during lacrosse training, there were only two of us left-handers who needed to learn a different technique. This resulted in one very grumpy teacher. 5 3/4″ I turned R6 into a ‘tr into every tr of the previous round and ch sp as my block was a measly 5″. R3 & 4: Crochet 1 tr not 1 dc mid round! You’ll always use the book’s photos to check if you’re switched on and thinking about what you’re doing. I wasn’t, so ended up with a funny scrunched up triangle. Bah! This reminds me of #10 Openwork Square, which is not a good thing. I see I squashed some of the bobbles down a little trying to stop the curling for this photo, but gave up for the group photo below and used pens to anchor the corners, though some bobbles still look rather subdued. They’ve perked up and are all nippley looking again now. 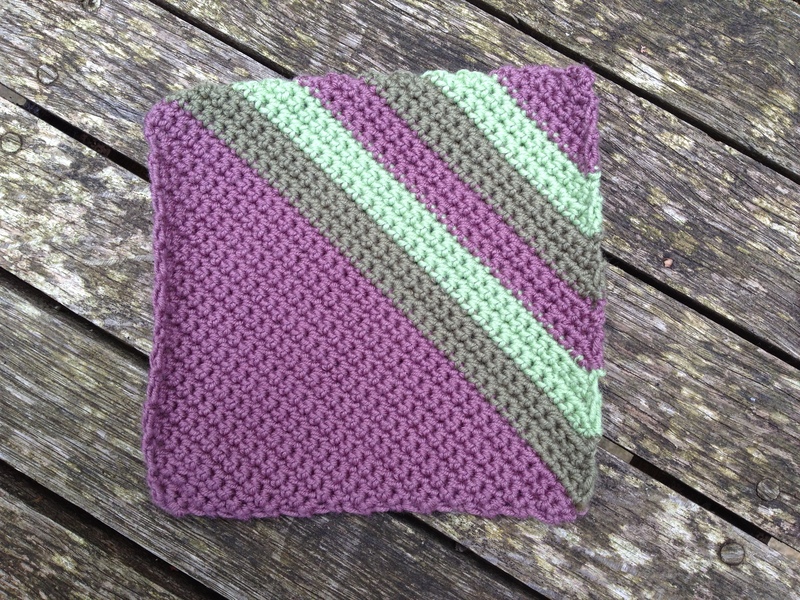 It was very apt crocheting this block today, as the baby for whom the Baby Jewel blanket was crocheted was born this morning! I can’t wait to see her in hospital and pass on the blanket tomorrow. I added 4 more rows at the top to bring the dimensions a little more into line, but stopped at completely squaring it; I might make this into something else. It’s not going to fit with the squarer blocks. Maybe it would be good doubled in width for a scarf? I reckon small fingers might pick at the loops of the dtr if it was a blanket. Definitely needs blocking to see the detail and straighten it out! At the moment the middle is slightly bunched up. 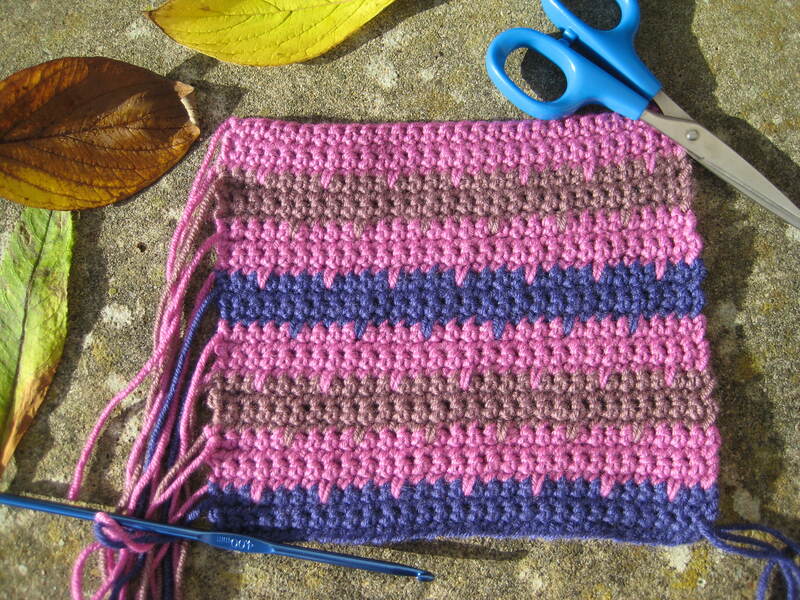 I’m really glad to have more of this mauve wool, it’s such an earthy colour for the garden theme. It should tone down some of the brighter blocks if I make a huge blanket at the end. “Row 6: 1 ch into each of the next 2dc, turn.” ?!?! Not so much a gothic square in these colours as a full-on summer cottage garden. I’m picturing a flower growing against a blue trellis. This has a really pretty middle. It also needs blocking to straighten out, but it’s sweet. 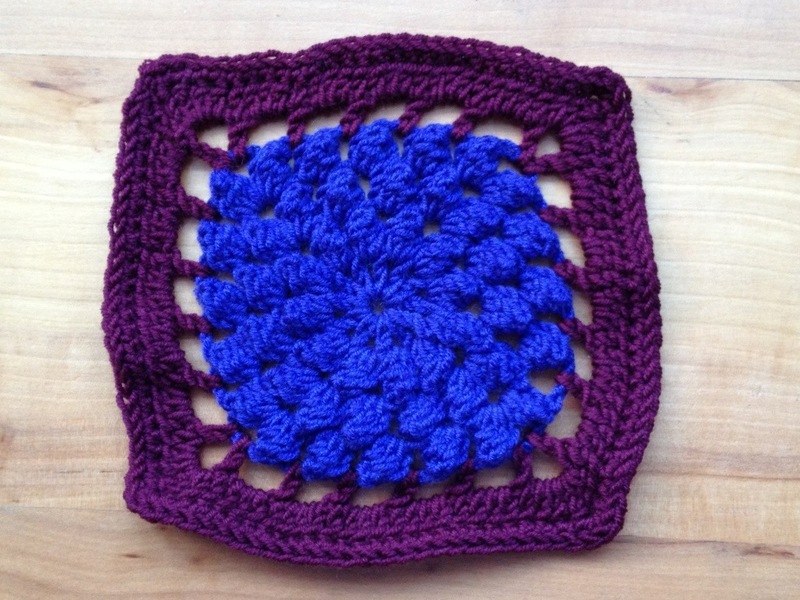 Kingcup has a 3 hook – challenging – level of crochet rating, but I found it easy. This was very pleasing! My overall favourite of the Easter fortnight’s blocks. This was a block where I wished there was also a symbol pattern to go with the written version. I used the book’s photograph to check mine was on track. 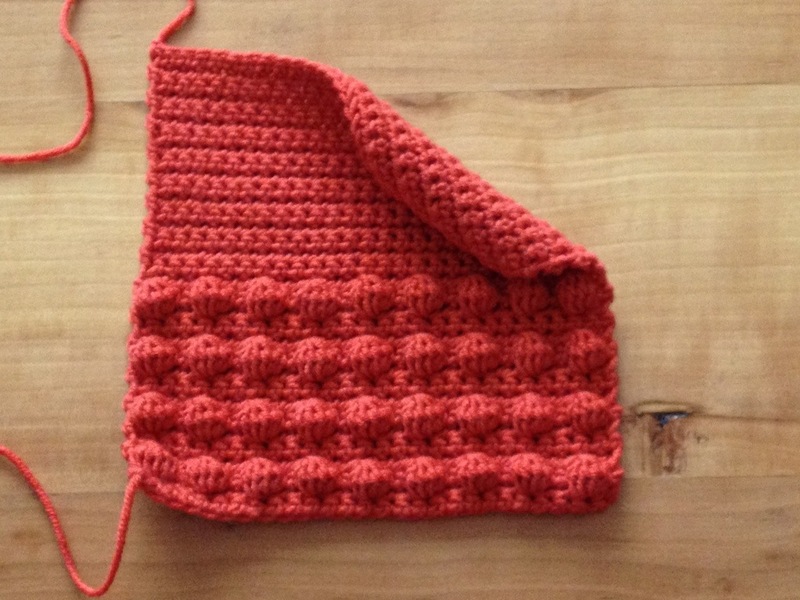 I notice there are many blocks with a 1 hook – easy – level of crochet coming up, which is good since I feel I want to zip through the next few weeks worth of blocks. I’ve got my Mile of Mice bodies to sew up, tails to attach and features to stitch (rude comments about the linked post will not be approved Jill & Trish.) Also, I’ve knitted another cable piece for my first-time-I’ve-ever-cabled bag. I need to sew them up and attach the handles. My cousin’s going to help me sew a lining for it over the next few weeks. 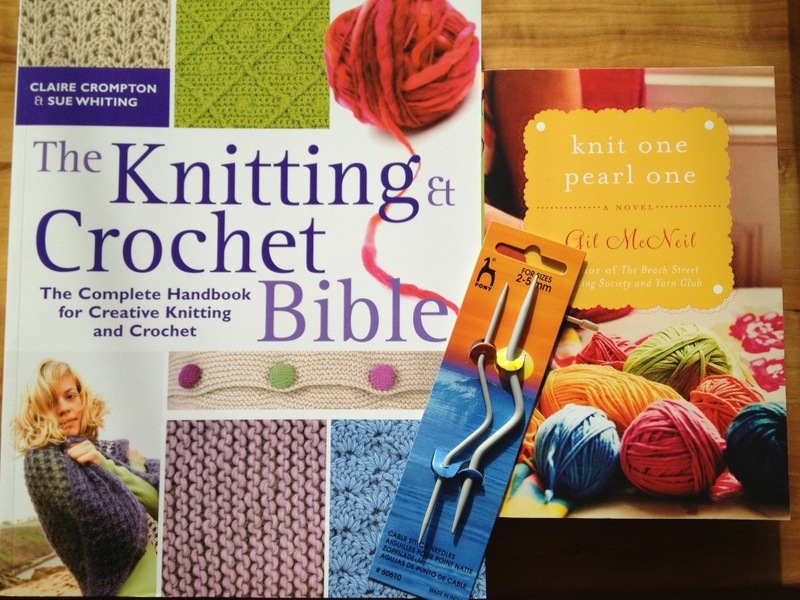 I had reluctantly taken the Knitting & Crochet Bible back to the library, so it seemed sensible to buy my own copy. I found a brand new one for a little over £11 on Amazon, which compared to the RRP of £26.99 is an absolute bargain. 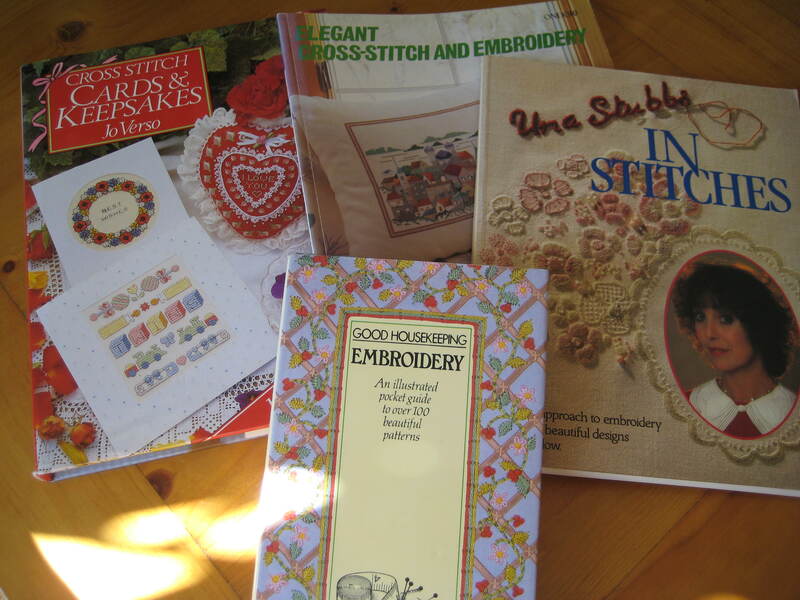 I can imagine using it as a reference guide, particularly for knitting stitches, for years. What are you making at the moment? Do you also have a list of items to complete before you start any more projects? There are those who are completely anti-gambling, others who’d never place a bet because they wouldn’t know the first way to go about it, and many who wouldn’t bother because they never win anything; even a church raffle. And then there are two who tend to place a small bet on the same sporting event once a year, namely The Grand National last Saturday. One of these picks horses based purely on their names (food & drink themed this time.) The other chose their two horses partly for their name, but also checking details such as odds and track record. 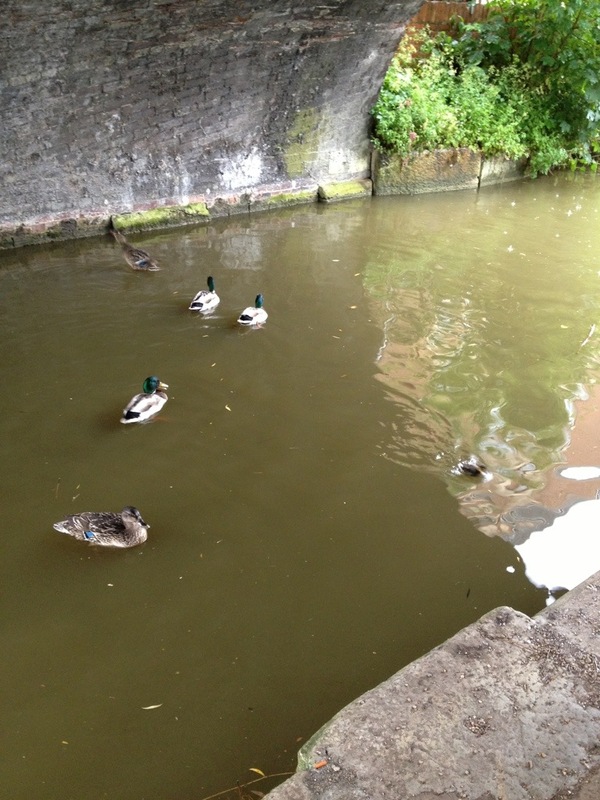 One of the four lost its rider quite early on and the others came FIRST, SECOND & THIRD…..! 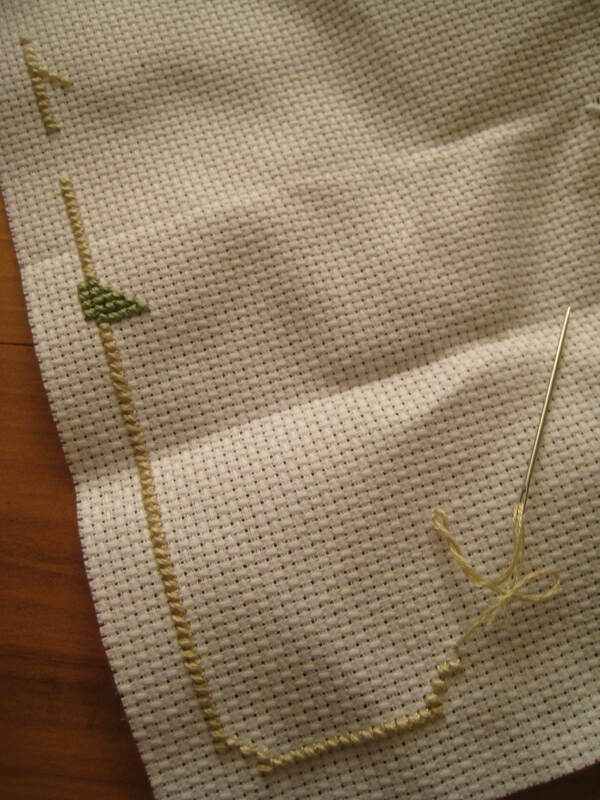 R9: I did 2 tr, 2ch, 2 tr corners into 2 stitches as I had too many stitches left otherwise. Did you find this too, or was this my mistake? 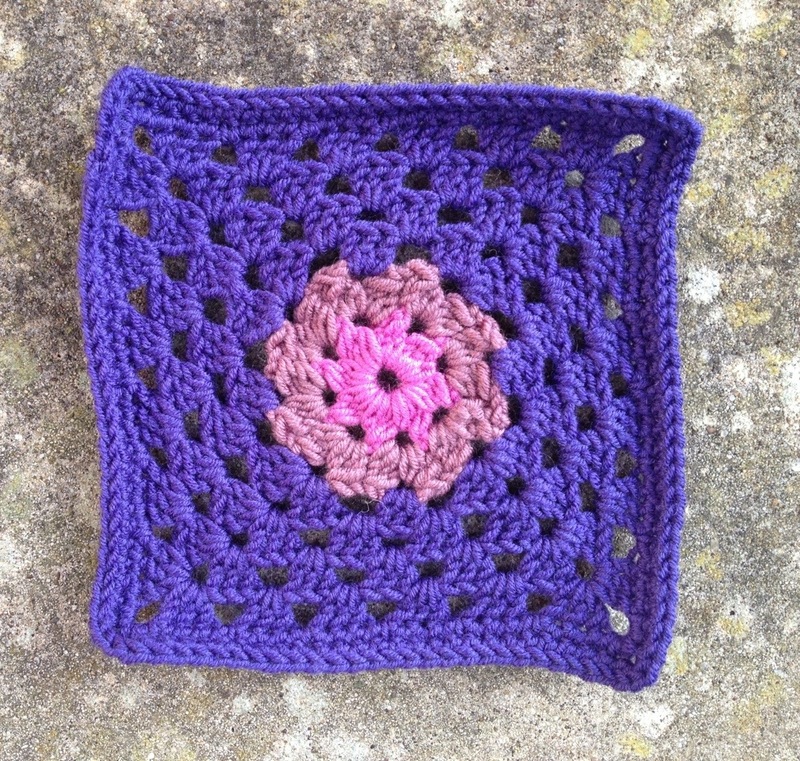 A very pretty block, it would look lovely in pinks and blues. 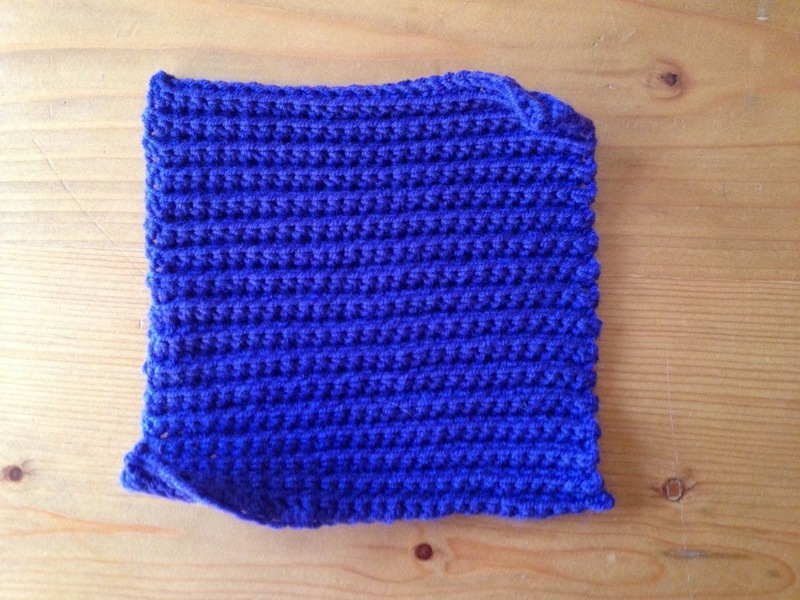 A dense block, it would make a warm throw or blanket. I maybe wouldn’t give it to a very young child; you can imagine them wrecking it by poking fingers into the middle hole! This block felt a bit like groundhog day as it’s so similar to the first block of the CAL. 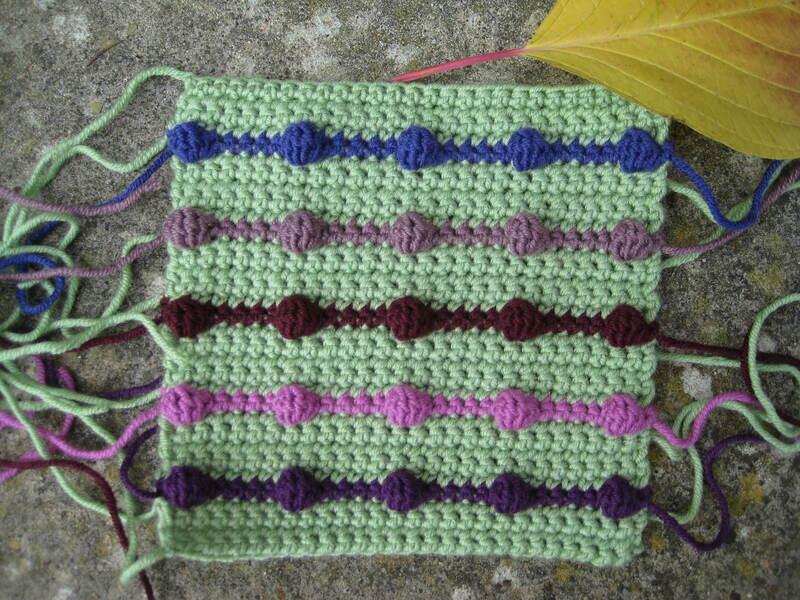 I used the same strategy of working out and writing down the stitch count for each row before the sets of 5 rows. Then I checked my stitches tallied at the end of the rows as it’s so easy to crochet into the starting chain otherwise without realising. I took these photos in a rush before a last tidy up before family arrived for Easter Sunday lunch yesterday, that’s why they’re even more unruly than usual. I hope you’re having a lovely Easter weekend. There was some talk amongst some of the CAL block makers that the pattern was wrong and should say to make 4ch in the corners of R5&6, not 3, but I stuck to the pattern and mine’s fine. But then my tension’s not tight at the best of times, you can try it both ways and see what works best for you. This is not an attractive looking block, in any combination of colours in my opinion. In fact if the BBC Dr Who production team are looking for a fabric covering for aliens then I suggest they look no further. Nope, still not a fan of the ole popcorns! 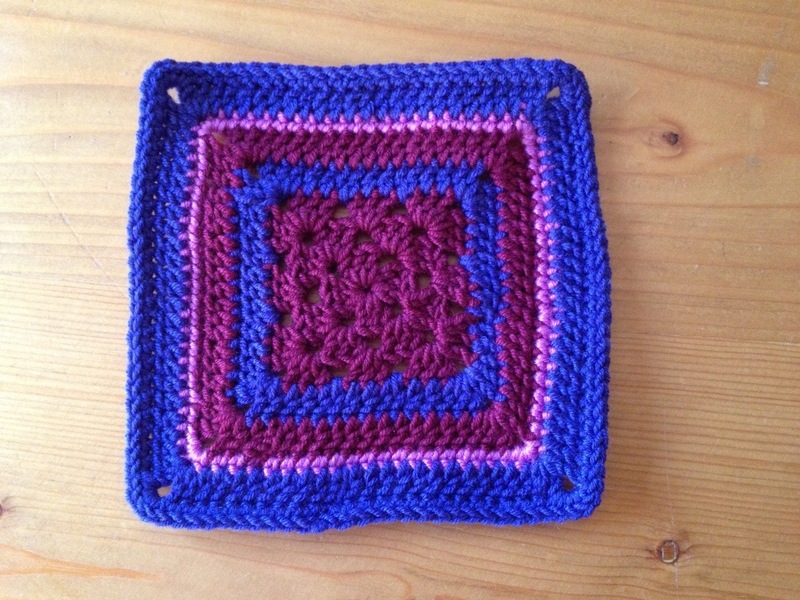 I crocheted this a few weeks ago, along with the other blocks of week 28, as it looked straightforward to make while watching something good on telly. I just can’t remember what it was now. After trying once with my usual 4mm hook I used a 5mm for the 2ch foundation chain, then carried on with the 4mm. It was much easier, far far less fiddly and as you’re going to darn in the end nice and neatly, which always tightens up the initial ring, it doesn’t really matter if it’s a bit loose to begin. There are a few ‘ss into the first of the 3ch’ instructions at the end of some rounds – but you haven’t begun with 3chains. Oops yet again. None of these blocks make my heart go pitter patter, but the top Sunray block is probably my favourite. 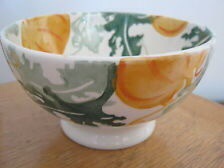 Lots of these in nice colour combinations would be a fun throw; I’m thinking rusts, browns and autumnal colours. Mile of Mice News: There are now 40 mice knitters in my KAL group on Ravelry. Just look for the Mile of Mice KAL group and come knit a mouse or two along with us. It’s for a very good cause to raise money for The Alzheimer’s Society, and the project will also attempt to set a Guinness World Record in October here in the UK. The organiser Libby is sorting out a crochet pattern at the moment. 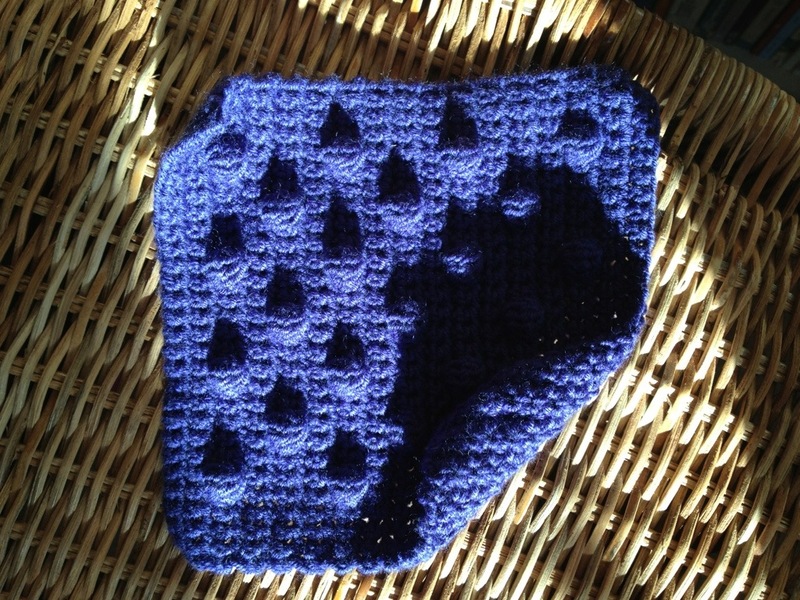 If you’re on Facebook and have a mouse crochet pattern, which will make an approximate 9″ mouse from nose to tail, please get in touch with her via the Mile of Mice group. I’m so embarrassed about my mice bodies pictures (thanks for pointing out why I should be Patch) I’m not even going to link to the post, and you know how much I love linking things. I’ve knitted 7 bodies now. I must knit some ears soon as I already need 14 of the fiddly little things! The other day I was watching The Gilmore Girls season 7 and there’s an episode about Stars Hollow holding a knitathon to raise money for local bridge repairs. Just try to see that episode and tell me how many of the actors can actually knit, or look as if they’ve ever held a pair of needles and yarn in their lives?! I’m new to the lovely Gilmores, it crept up on me slowly from the 5th series or so. At first I thought they gabbled on all the time talking soo fast and were a bit too slick but I’m now watching to the end of the series. I record episodes shown on the Freeview 5* channel which shows one a day at 4pm on weekdays; if you’re also in the UK and want to see what I’m talking about. I then plan to rent the series from 1-4 and see Rory grow up. It’s a bit like Benjamin Button (terrible film!) going from OAP-baby. 3.5mm=5 1/4″ but then I added two more R8 to enlarge the block so it’s 5 3/4″. I just fancied using my pink 3.5mm hook for a change from the blue 4mm, so I did. Now tell me is there a mistake in the instructions for R6? There don’t seem to be enough instructions before the corner space stitches. I just trebled along until the last 3htr, surely it should specify 14tr then 3htr? There’s always the photo in the book to check; but I think of how confused I’d have been if this particular block was the first I tried as a newbie. 5 3/4″ – 5 1/2″ depending on if you’re measuring the fat or thinner end! 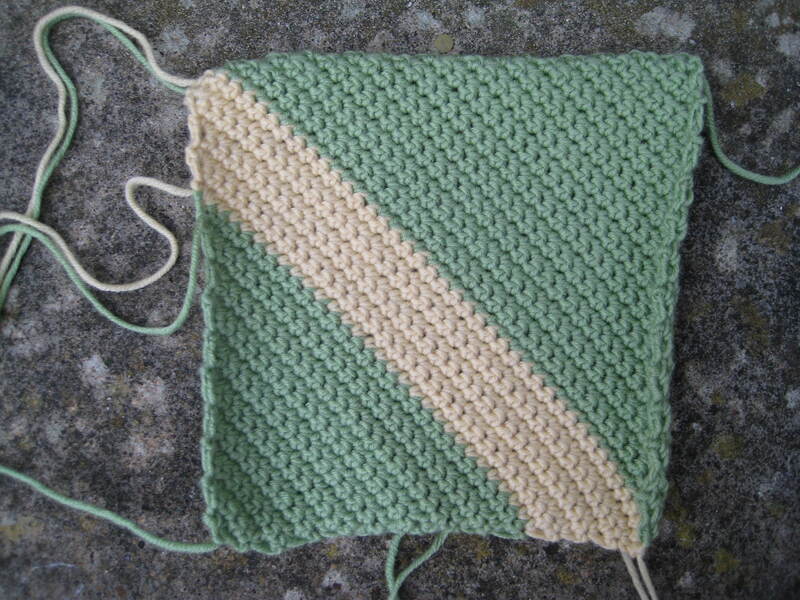 I thought this was less wonky than my usual (unblocked) corner squares, but looking at this photo I’m not so sure. Generally the corners where you increase, rather than decrease, come out less wibbly for me. It’s probably all about the tension. Week 28! 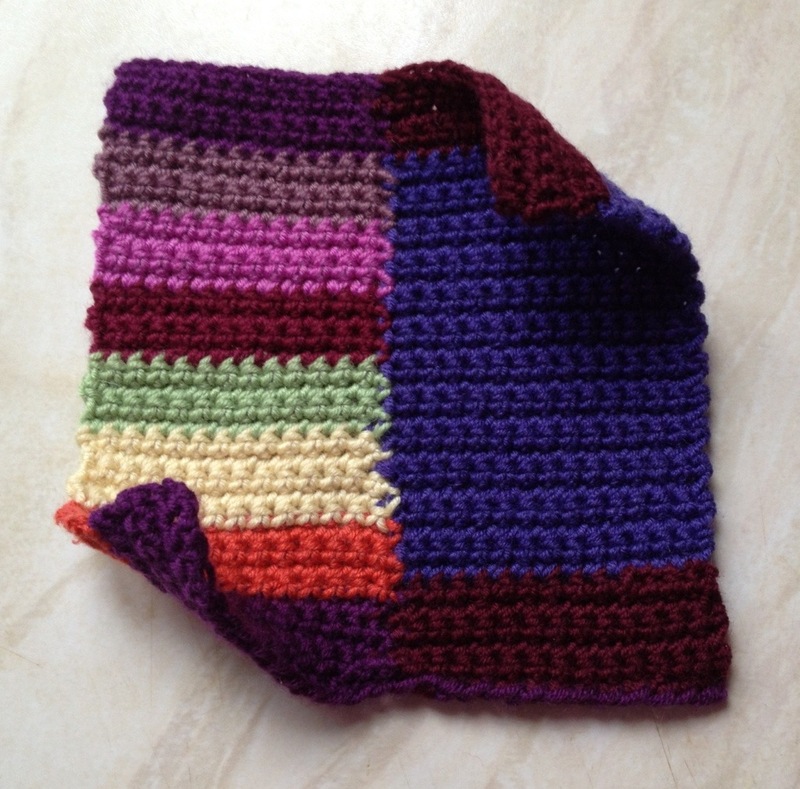 Wow I can’t believe we’ve been going since 1st September crocheting and posting pics! WELL DONE if you’ve been with me since the beginning and are still crocheting along. I could post a list of links to current block-makers’ blogs in my CAL week 29 post to make it easy for readers to click to yours so they can have a peep. Just send me a link to your last CAL post here if you fancy. I’ve heard from Jen of The Eclectic Stitch to say she’s rejoining the CAL which is cool. I’m really looking forward to seeing more of her blocks. I thought I could make a pink alpaca mouse, or two, from my Knitting and Stitching Show workshop wool. Every mile of mice needs a pink alpaca family. 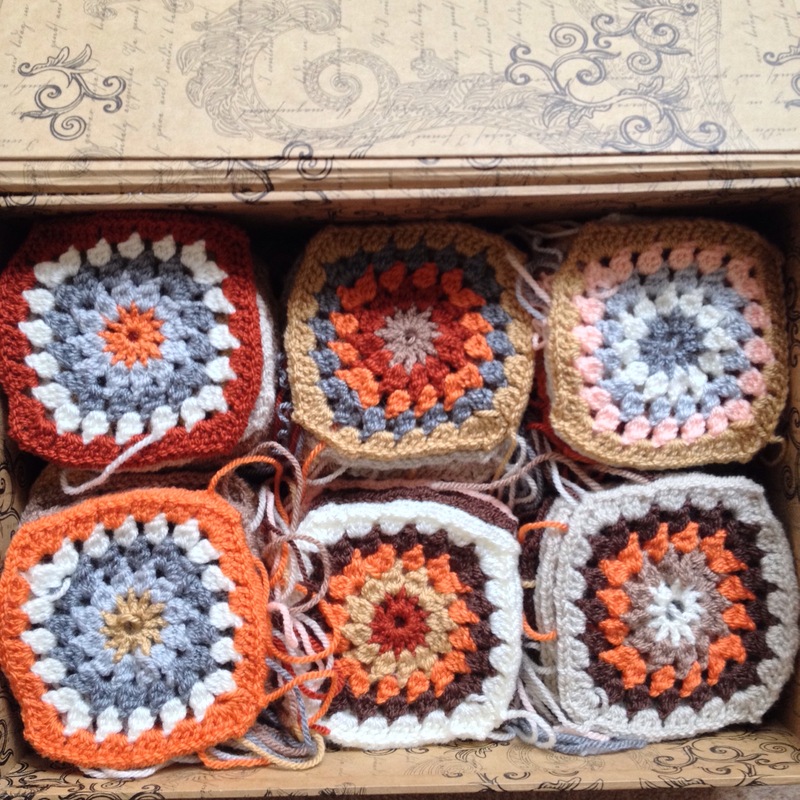 Shall we get involved and do a mini KAL? (Knit-along) but with no fixed schedule? I’m happy to post links to blogs/photos showing completed mice. It could be squeaking good fun. What do you reckon? Urgh! I dislike popcorns in baby cashmerino. I just think they look better in a proper DK thickness of yarn. I used a 3.5mm hook to see if they’d look tighter and sexier etc, but not. Alternatively, it might just be me and my inability to do them properly? 6 1/2″ W with my usual 4mm hook, so I changed to a 3.5mm hook (refreshing change actually) but it’s still a widey at 6″ w x 5 1/2″ h like the previous blocks #76 and #75. 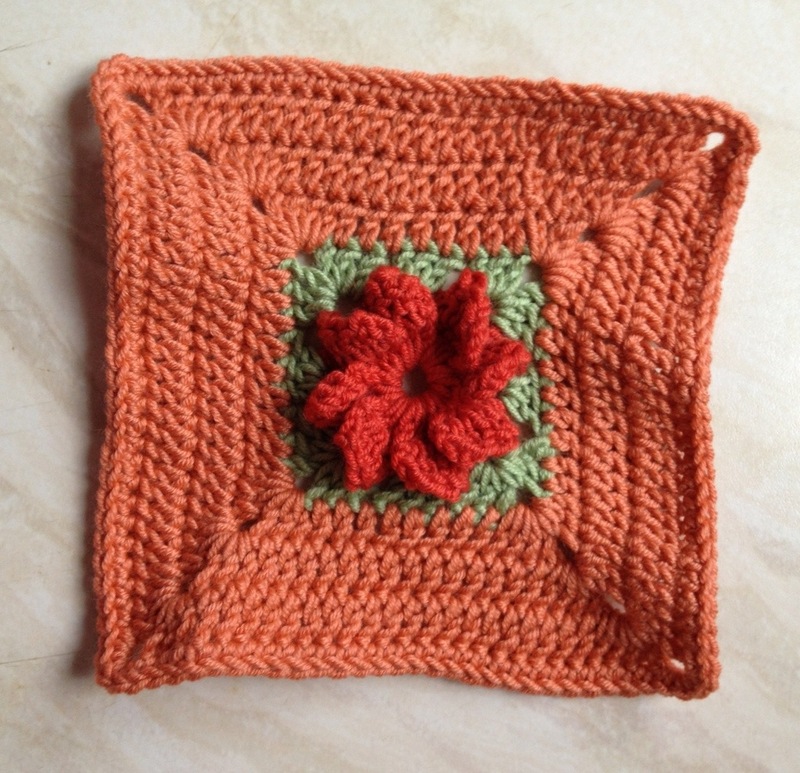 My favourite in a long time, I like the flowery middle and it’s a sturdy block because you go around previous treble rounds in double crochet. This would be an excellent blanket block. 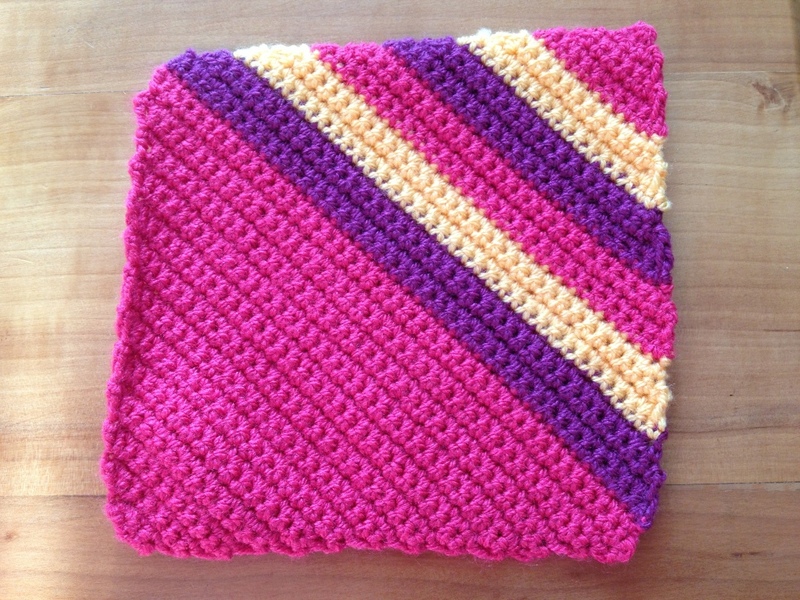 A little darnarama and not speedy to crochet, but overall well worth the effort of making. Sometimes the things that take the longest time to create are the things most worth having. Anyway, I had to show you this Japanese ‘delicacy’ that he takes great glee in buying as a gift for my poor brother. S instructs me that you have use the Banzai voice to say its name. If you’re not familiar then don’t worry, it’s really not that funny! Here are a couple of gifts S gave me after last year’s business trip to HK. At the time I was definitely a beginner crocheter but now I reckon I could dust them off and follow the symbol patterns. What are you doing this weekend? Any fun plans for Mothers’ Day? 6 1/4″ W 5 1/4″ H with a 3.5mm hook. AND I added an extra stripe at the top. So, that concludes the brief experiment using a different sized hook. 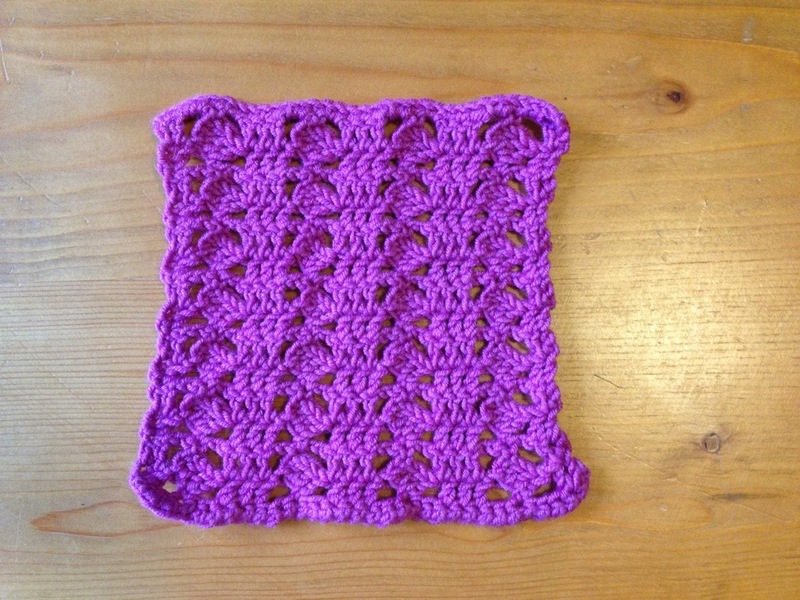 I also redid #75 with a 3.5mm hook and it was still rectangular (6″ W 5 1/4″ H) So I’m going back to my original plan of using the same 4mm hook and just crocheting the patterns. If I change them by adding rows or extra stitches then it’s not Jan Eaton’s 200 Blocks, they’re mine. I know I’m probably going to be struggling with the fixing them together but that’s for later, not stressing at the moment. 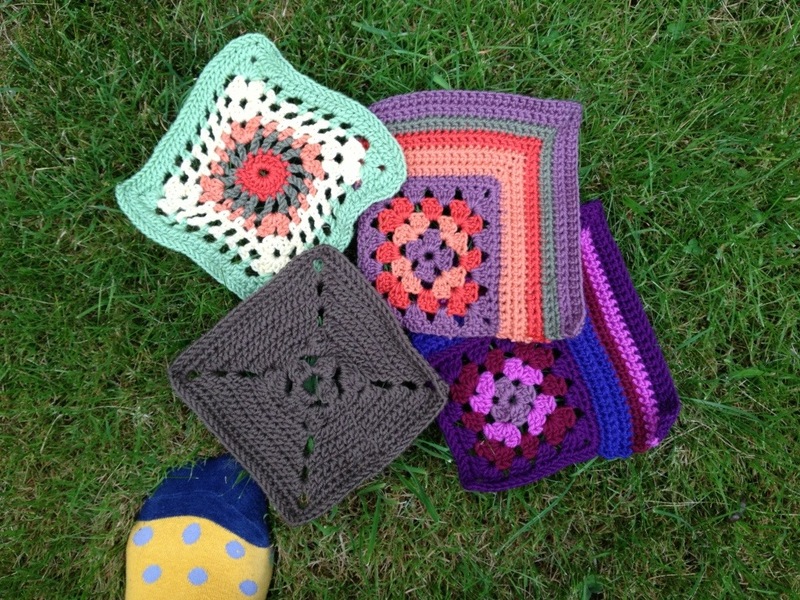 The good thing about doing this CAL is that in the future I can look back to my weekly posts, when planning blankets etc, and choose my favourite similar sized blocks. Hmmm, as usual for a corner square it’s very squiffy measuring between 5 1/4″ – 5 3/4″ at various points of the block. I enjoy these decrease to 3 stitches blocks, they’re very relaxing to crochet because you’re not staring at the pattern every row. Very bright and Spring-like with the yellow and green. I like the colour combo this week. I’ve been slack about my darning this week but I will keep up with my CAL resolution and do the ends before I crochet the next set. 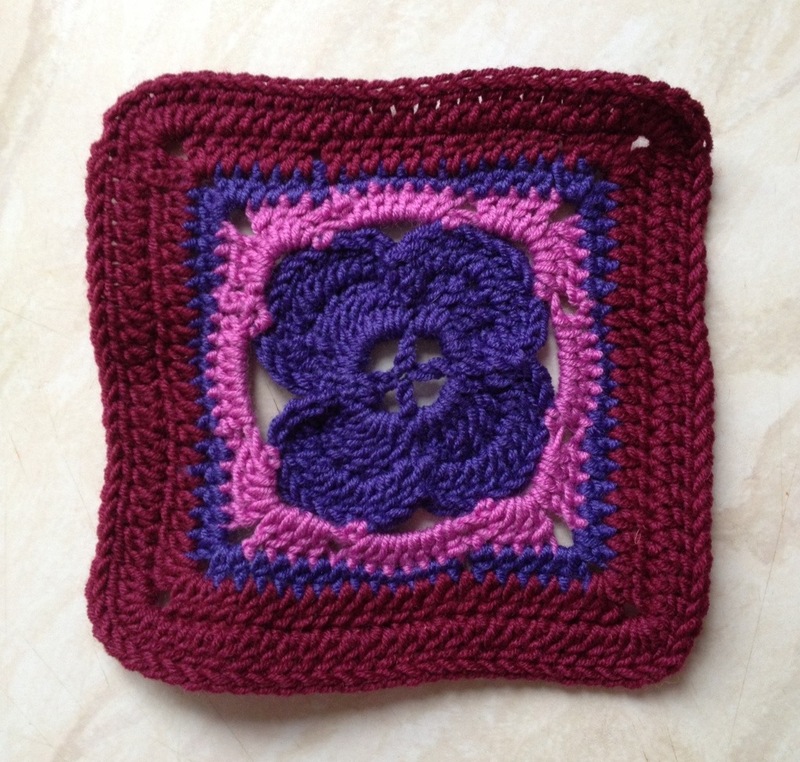 This week we have another new block maker, check out her first CAL blog post here. 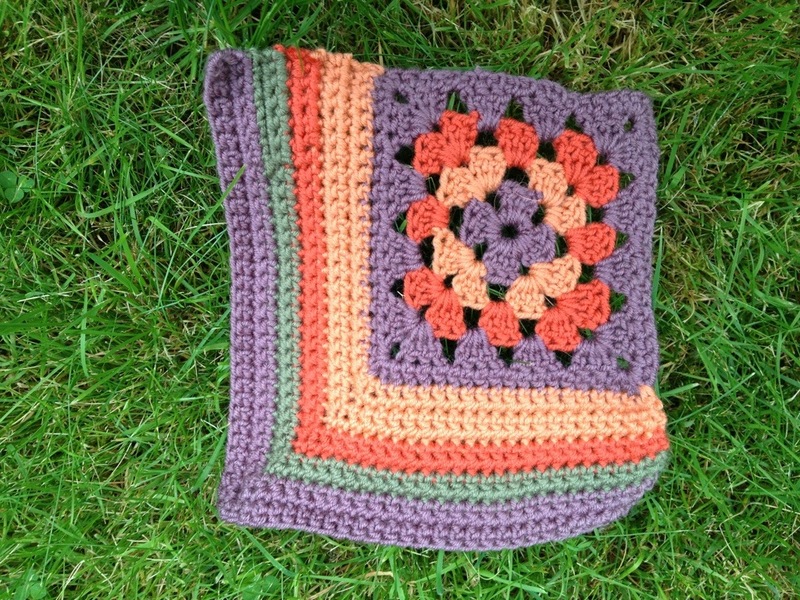 It really made me grin to have someone so enthused about the project, especially when we’re now 6 months into the Crochet Along and I was definitely feeling a bit jaded last week (about the blog posting, not the crochet!) Admittedly that might have been down to lethargy from a cake overload?! Check out the Ravelry group too, we are still gaining members, there are now 100+ which surprises me as the forum is practically silent. It’s great that newbies are still signing up to the CAL. If you fancy playing the TPBM game pop in to the forum. I love silly games! In other news: I dropped my iphone into a cup of coffee this week! It slid straight down out of my hand and plopped into my mug. It all works apart from the wifi, which is pretty vital. It’s going away by post to my mobile operator –Y’know, the company who I pay a lot of pounds to every month — and is guaranteed to be back within 4 working days. In the meantime what will I do without a mobile?! R4 has a missing instruction. It should say ch3 at the beginning (which counts as a tr) If you picked up the book as a beginner, or not so experienced, this is the detail you need to know. I’m not sure about the colour combo, but then I’ve said this quite often. I’d probably choose different colour combinations, and not all in a rush just before the shop closed next time! Or, maybe the yellow was a mistake and the colours were sound before I added more? Another editing issue: R7 should say [1 tr into next tr, 1 ch] lazy proofing, or like many companies perhaps they’ve sacked the proof editors thinking that computer programmes alone can pick up errors. When you read have you noticed how many mistakes have crept into contemporary novels? 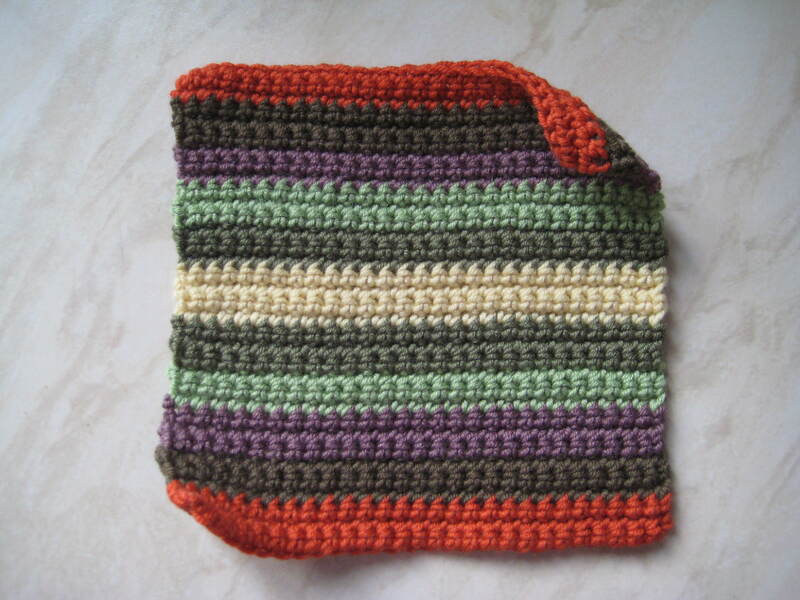 But, having said this please don’t judge me by all my mistakes; this is just another little crochet blog. This needs blocking sooo badly, I know. 6 x 5 1/2 ” rectangular! If I want to use this (and I do, it’s posh wool £££) I’ll have to redo it, but for now it’s shoved in one of my block boxes. It needs either fewer trebles or a smaller hook. I haven’t gone down the using different sized hooks route for different blocks because frankly I don’t want to fanny about here essentially making samples checking for measurements. Yah-boo for number 75! The lateness of my posting (it’s usually around Friday/Saturday at the end of the CAL week) is due to having FUN! A girlies long weekend in Cardiff, Wales stalking the places where Gavin and Stacey was filmed (look it up and watch!!!) and generally mooching, talking and eating a lot of cakey type things. I must admit that the CAL is beginning now to feel a bit like homework, or at least after a very fun weekend away when I know I’ve got to unpack, do washing and write this update. I’m also starting to wonder how the hell I can fix together blocks which differ in size as much as 3/4″. You might be sat smugly reading this thinking you’re not surprised and you expected a similar comment sooner or later, but it’s not really surprising to me either. I knew all along I’d feel like this at some point. This is the plan: I’m finishing the blocks and then will sort out blocking, sizing, coordinating and joining issues…….later! 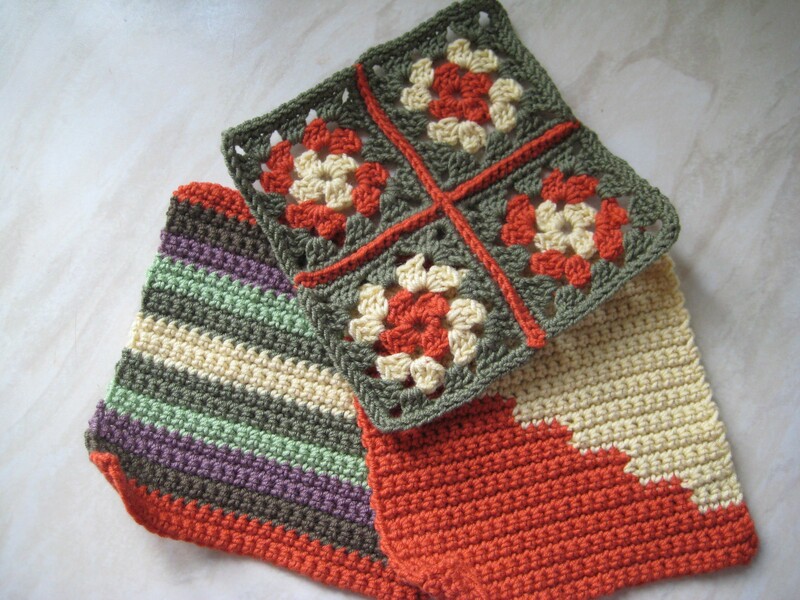 I’ve just heard a huge thump as my new knitting and Tunisian crochet books land on the door mat. YAY! Have a good week blogettes. Yes well I’m really not sure what went wrong with this one, but you can’t say I didn’t warn you! I was initially 99.9% sure my colour changes were to blame for the wiggly look (I did them my usual way ending the last stitch before the change with the new colour) rather than wrongly following the pattern. If I cover the changes with my finger the zigzags show clearly which seems to back this theory, but there are not 3 pointy zigs and the zags are dodgy so…..
Ah well, this is abstract art. 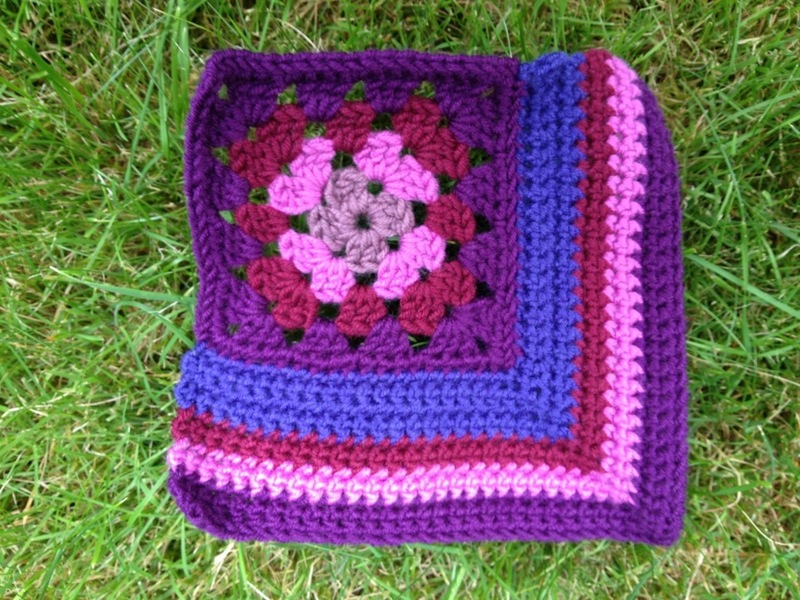 Pretty but a bit holey for a blanket?! 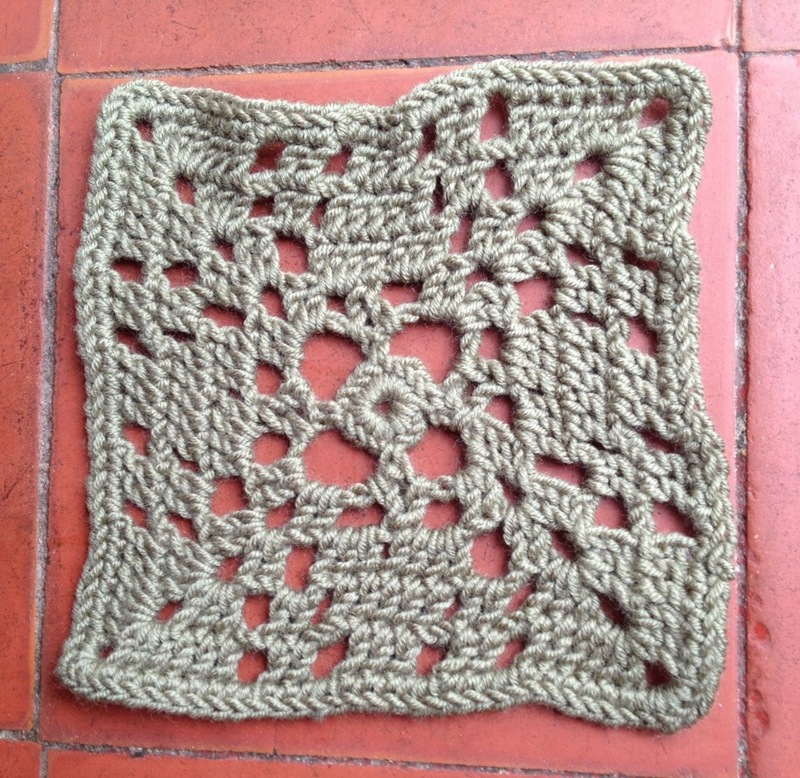 I crocheted this at the beginning of the year when keen to choose and make random blocks that were left. PS: We’ve nearly done six months crocheting along together! 6 months!?! SIX MONTHS?*!Z*!? That’s amazing. The splodge looks like a splodge in the book too. This one’s darnarama also. Needless to say I WILL NOT be making this one again. I’ve had such lovely messages from friends and family too. My favourite text was from my friend Sarah when she saw my two bound dissertations – ‘Holy Sh**!!! Well Done!!!!!! !’ She’s working hard on hers at the moment and I know exactly how she’s feeling. It’s so good to be at the end of a lot of hard work. I’ve got that school’s out for summer feeling now. I took advantage of the first 3 issues for £5 offer. I did the same with The Simple Things mag, but really didn’t like it much. I have high hopes for this one…I’ll let you know my thoughts if you like? Oh and for the final round the book says to 1ch, 1 dc into each tr and ch round edge; I ignored this and just did 1 ch to begin then dcs around. There was a similar mistake for one of the previous blocks I think? 5 – 5 1/2″ ‘square’ urgh! This puts me off the corner blocks. I think my fave is the Random Patches block this week. How are you getting on? Which block are you working on? 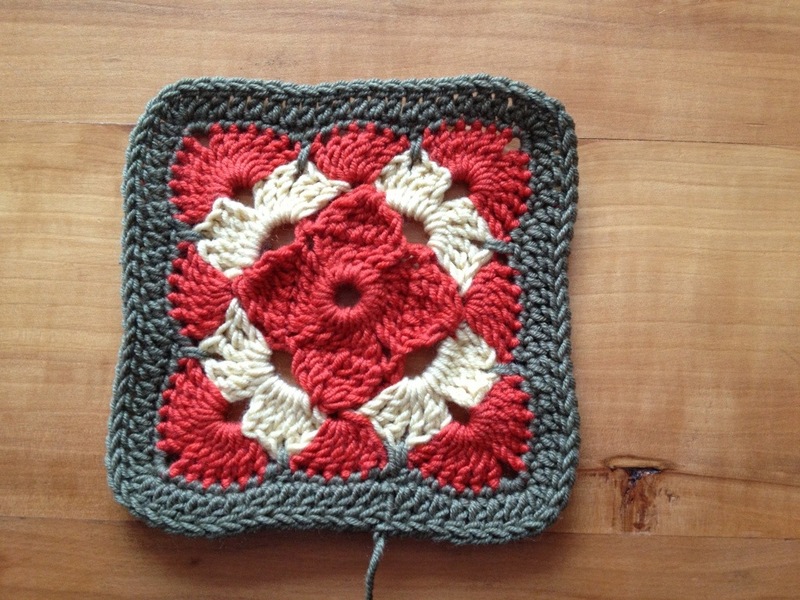 5 1/2″ square. 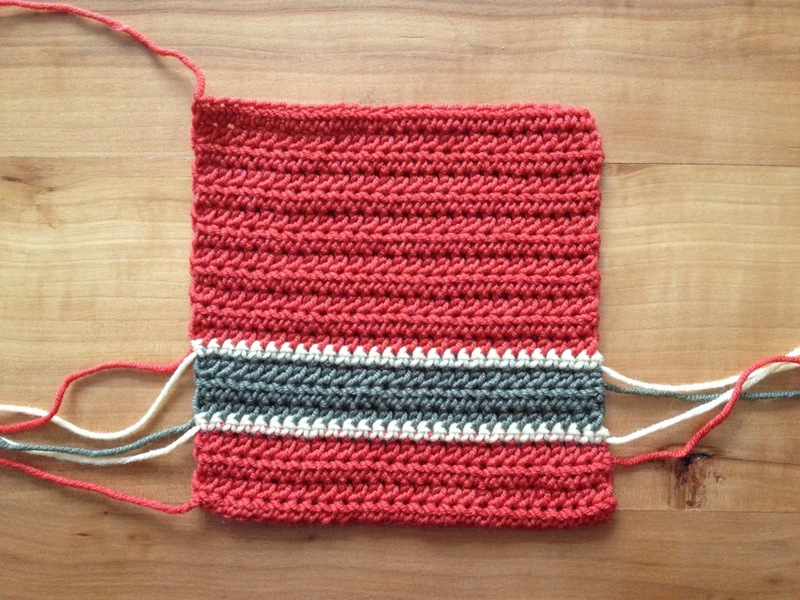 These blocks used to be all around 5 3/4″ on average, as I’m using baby cashmerino, but seem to be getting smaller…. And, because I was in a go get ’em mood at the very beginning of a new year (and if I’m honest avoiding work) and the first two blocks were so straightforward to crochet; I then crocheted four more blocks. I won’t post next week, it’s going to be a very busy one anyway. 5 1/2 x 5 3/4″ oh dear. These kind of blocks always seem to come out narrower than the length. I’ve been speculating that this is why the book is called 200 Blocks not Squares again! Unless it’s me and yours come out perfectly…. Oops it’s upside down, I must have rotated the photo without thinking. One of the middle pc looks a bit flat, it’s got squashed in the pile of blocks I reckon. We thought this “alright” nothing special after I made it, but it’s quite pretty I suppose. It took 2 hours from beginning to darning the ends in! I know because the morning news was on, then the whole of Saturday Morning Kitchen yesterday. S made the spiced lamb shanks with pomegranate tubbouleh for dinner after seeing it made on the programme. 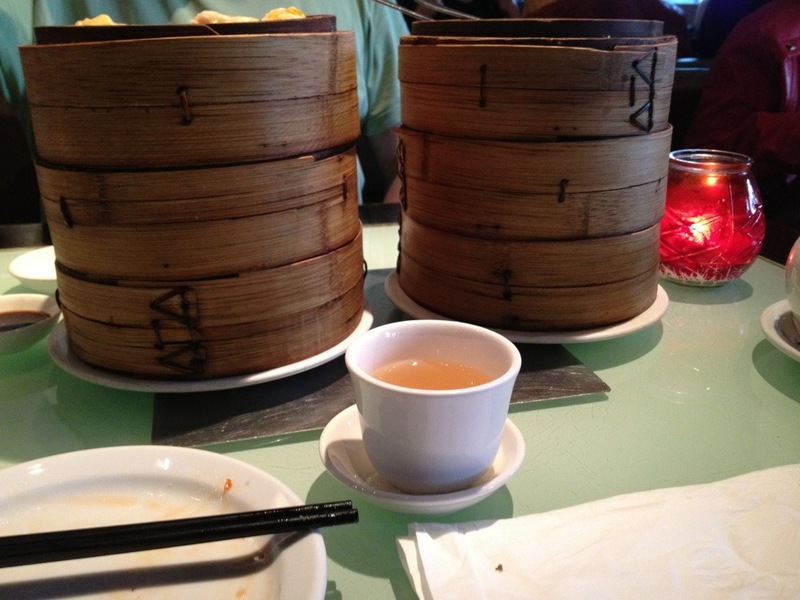 Yum yum yum. The recipe is online, it’s one of James Martin’s recipes. This and #52 Lemon peel were the two blocks I tried a long time ago when I bought the book. The other day I just fancied randomly picking any block to make. I told you I felt keen! The colours have come out looking so different in the shifting light this morning, but you know what they really look like by now. I’m still thinking about making two items with my blocks since my initial Cottage Garden colour scheme really feels like it’s evolved into two sets, but I’m not making any firm decisions till I stop making blocks. How many unique designs are there? I count 126 but my maths can be pretty unpredictable. Getting the hook into the 7ch from the hook (ie: the last) and making a treble without the whole thing twisting around and around is the initial challenge of this block. From then on it’s pretty straightforward, even when you think it’s curly and pulled up in all directions, after R4, it does end up flat and quite square. I’m looking forward to the next two blocks which both have a 1 hook ‘beginner’ rating, it will be nice to whizz around without too much thought. Otherwise known as the week of wonky photographed blocks! Honestly now I look at the uploaded photos I think they look like kids who’ve had to run for the school bus with shirts hanging out, hair unbrushed and clutching pieces of toast. 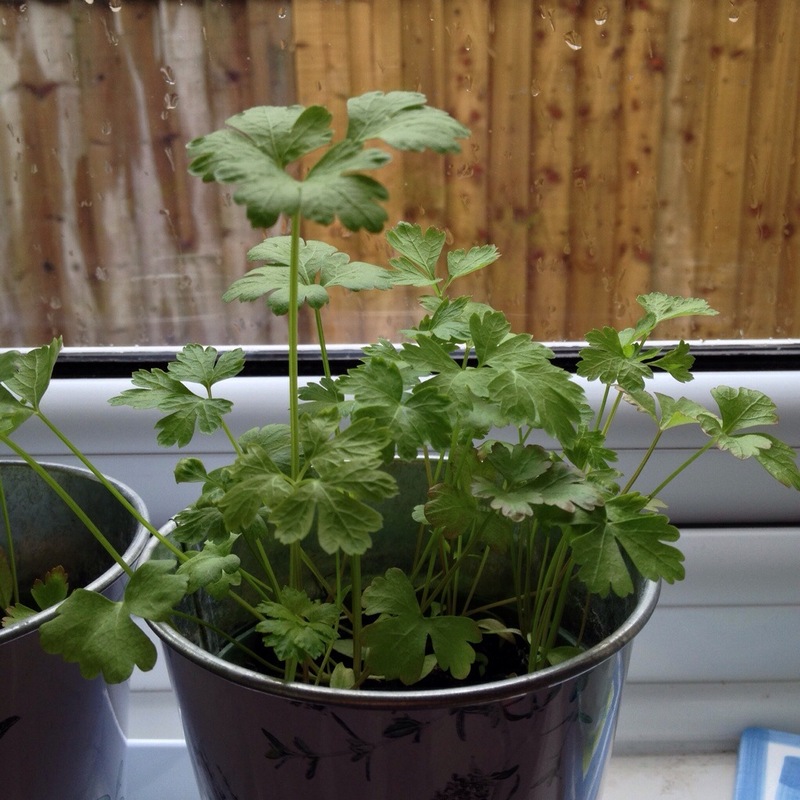 Ah well, you get a rough idea of what they look like…. These corner blocks are quite fun to do especially when you start with 58 ch and decrease down to 3st, but they are going to take some straightening out. I think I’m beginning to repeat myself as I have a feeling of deja vu! I got really engrossed in an audio book on Boxing Day, and as you see the maroon stripe carries on for another row. Due to being a leftie and not ;reversing the instructions the stripes are the other side, but it’s quite effective either way so I’m not worried. I probably need to do this one again practising crocheting the initial stitches tighter behind the petals, or maybe just easing them around the foundation ring as I go; they’re a little uneven in shape. You can see who’s a leftie and who is a rightie if you look at the way the petals lie over each other, I just noticed when comparing mine to the book. When righties go round to the left, we go round to the right! Confused? This would make a really nice blanket, mixed with plain blocks for the contrast. I crocheted this when I first got the book ; (last year?) 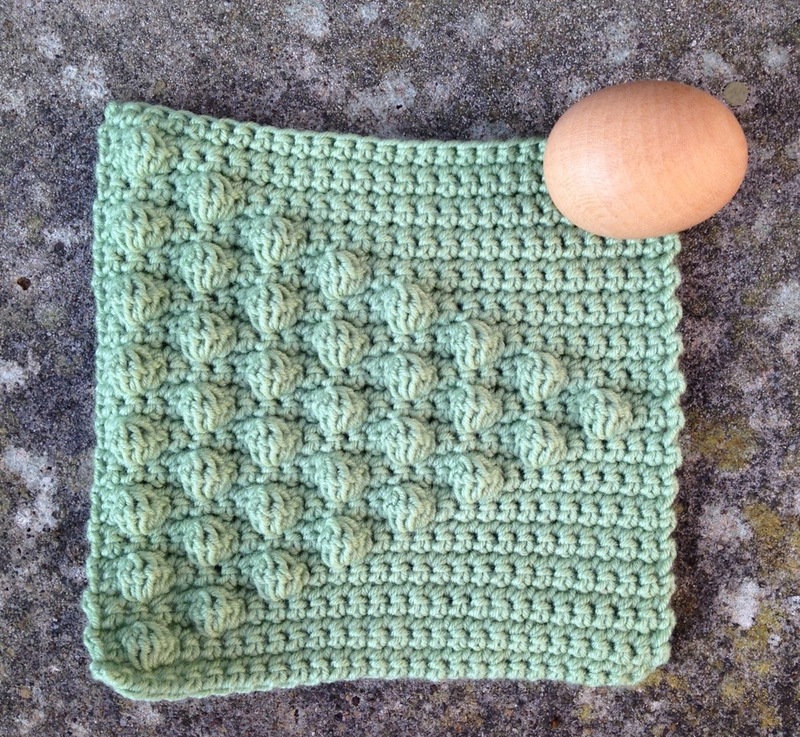 ; and found it quite challenging as I was a crochet newbie. Now? Easy peasy lemon squeezy! I think it’s pictured WS up but I like both sides of this block. 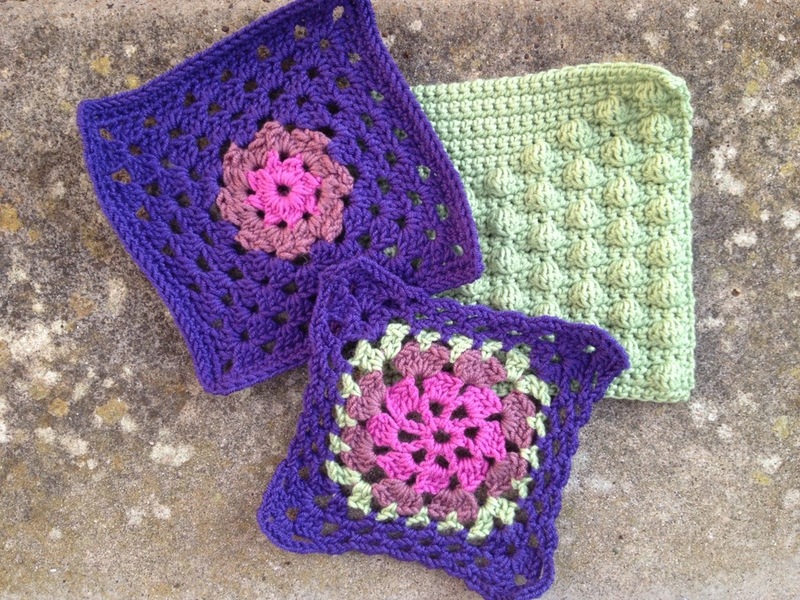 I’m only going to crochet blocks #53 and #54 next week to give others who are crocheting along with me a chance to catch up. It’s that funny limbo time of the season where home is still decked out for Christmas, you’re full of food and drink playing with new presents and the New Year is looming. This is usually when I feel I should go back to being productive and busy, but don’t. I have started a new crochet project though, under the twinkling lights of the Christmas tree with the films Pretty Woman then Bombay Beach playing on the tv. Lazy days! 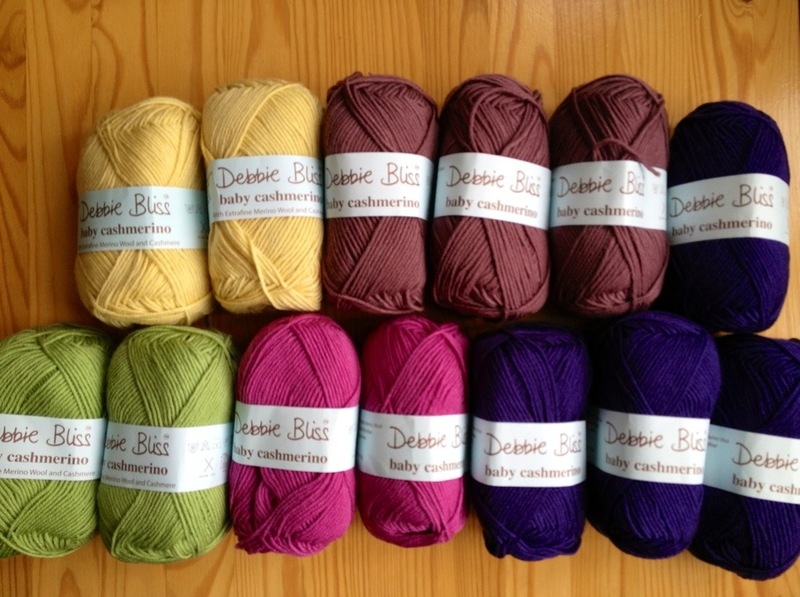 I must have been a good girl at some point as Father Christmas gave me a dozen balls of Debbie Bliss baby cashmerino! What have you been doing during the last few days? 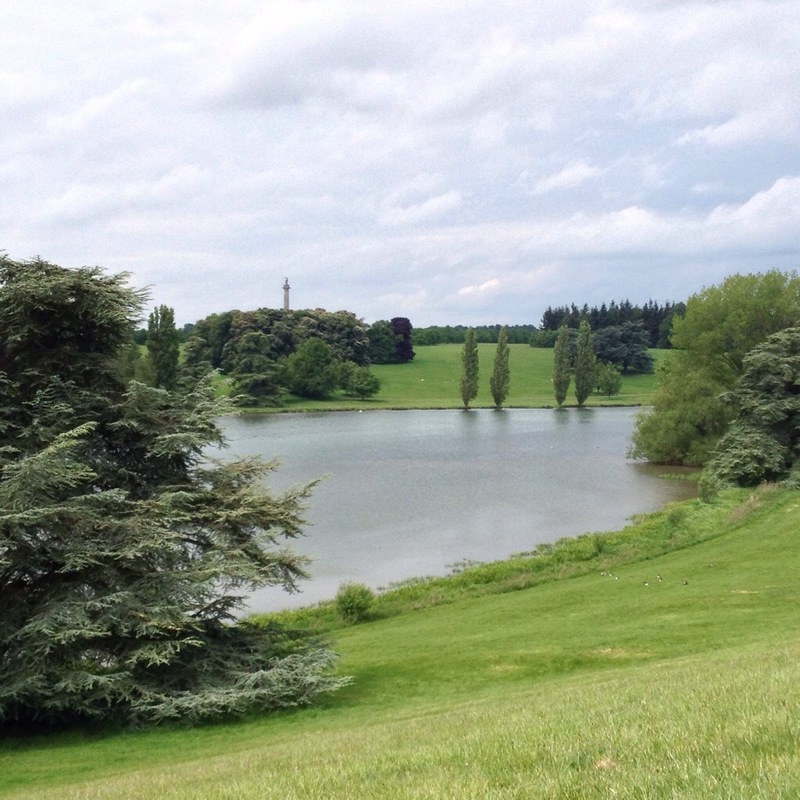 Today it’s very grey and damp again after a beautifully bright and lovely day yesterday. I don’t use a flash because it makes the colours look odd, so put the blocks in the brightest space I could find near the kitchen window. There was a bit of counting to check this one was on track. I like the middle of this, it’s quite a pretty block. refreshing not to have to change colour and only two ends to darn. The disadvantage is it’s one of the smallest blocks at 5 1/4 ” squarish. 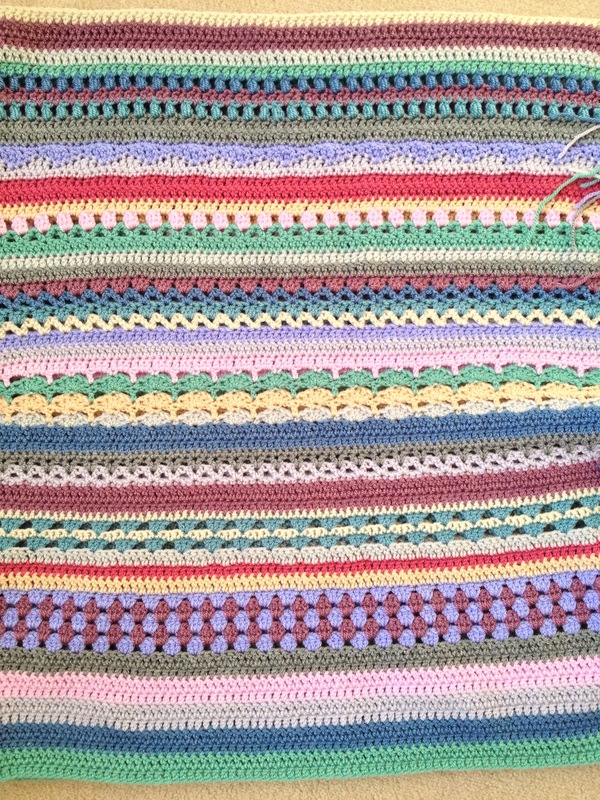 I think nearer the time to making up the blanket(s) this one might need an extra border or two to increase the overall size. I don’t think blocking will quite do it this time. I’m interested to see how this comes out size-wise for other Crochet Along (CAL)ers! R2: I didn’t ss into the first of 9ch as I thought it too wibbly looking, I went into a dc I think. See the difference in size? The Danish square is my favourite this week. 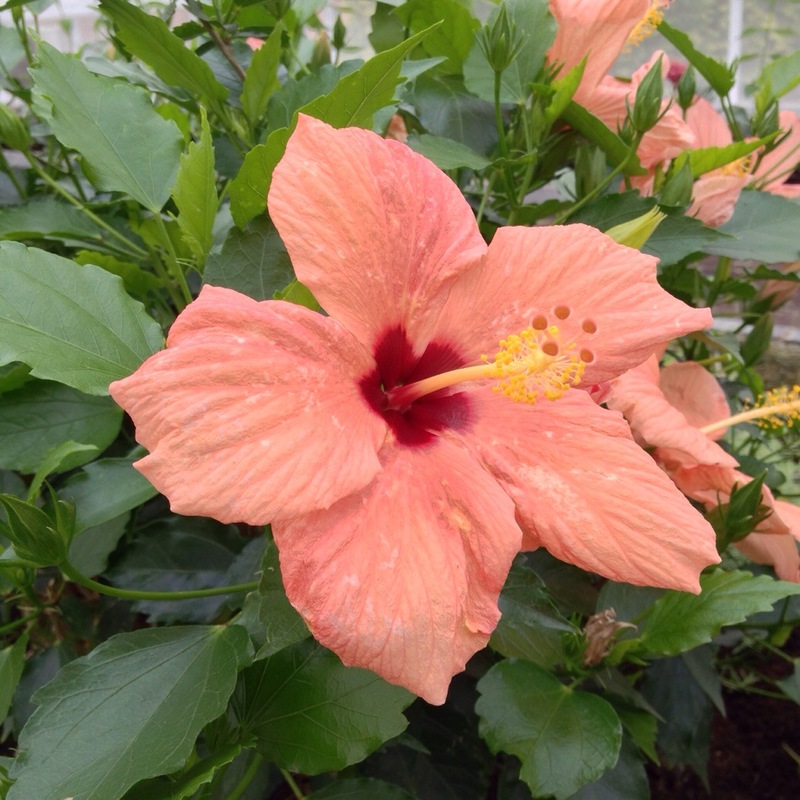 I like the petal shape of the 4 middle holes. I’m planning to carry on and do my usual 3 blocks next week, but will have to see how it pans out. My motivation is to get to the end of the CAL in good time and not stretch it out to next Christmas. 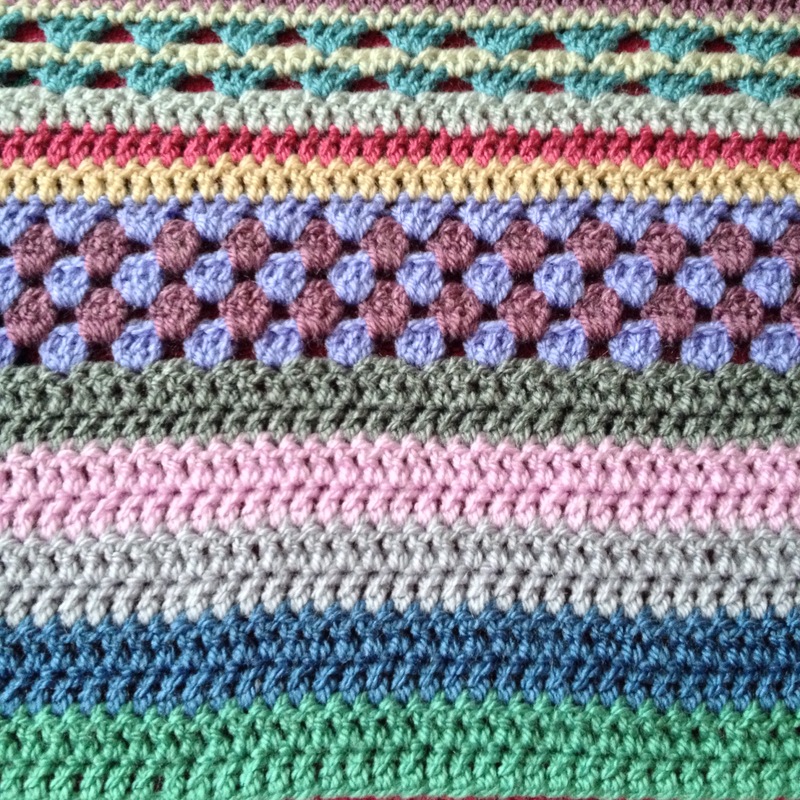 Also I’m still enjoying the pattern reading and stitch practise, and when I look back to the crochet I was doing, very unconfidently as a beginner, this time last year it’s a great boost to my crochet confidence. This afternoon I have more presents to wrap, fruit to soak in Armagnac, baubles to thread with gold ribbon and some reading/notes to do as I’m steadily plodding on with my studies. I’m looking forward to King prawns in garlic and chilli with a crunchy winter salad and a baguette from the local French bakery for dinner tonight. Yum. Where are you up to with your Christmas prep and what are you looking forward to eating this weekend? ‘The turning chain in a row of dc is not counted’ I chanted to myself at the beginning of this block. For some reason I needed to remind myself. This looks like cottage garden in the Autumn. I like it. This could make an interesting design if the blocks were turned different ways, so the steps were going in various directions on a blanket. Maybe? After reading good ole Rainbow Junkie’s CAL post I realised that I hadn’t been thinking, and of course there is a mistake in the pattern for rounds 6 & 7 namely that it should be trebles and not doubles around the edges of the block. No wonder my #42 block looked all pulled in at the sides. 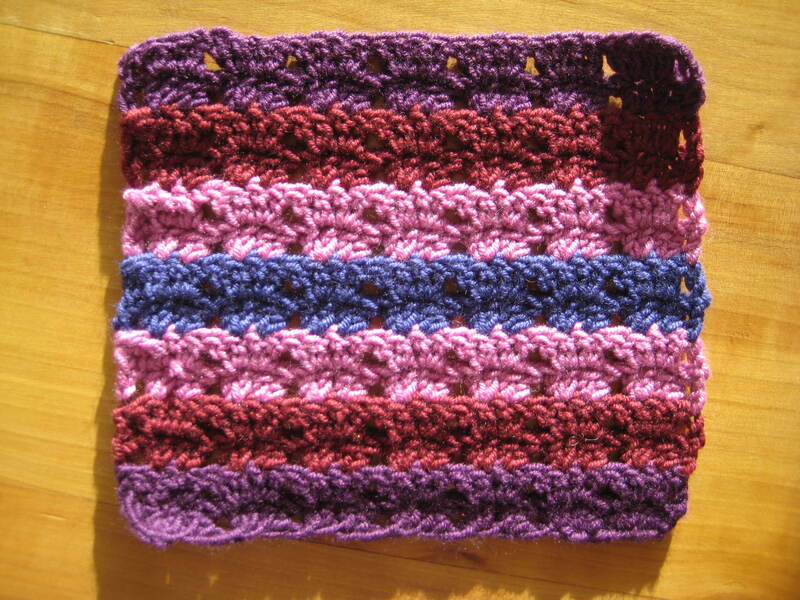 Now 5 1/2 ” square, will be larger with blocking. I hope your Christmas prep is going well. I’ve bought 95% of my presents, wrapped 20% and have been crocheting little sparkly Christmas things. Fun, fun, fun. 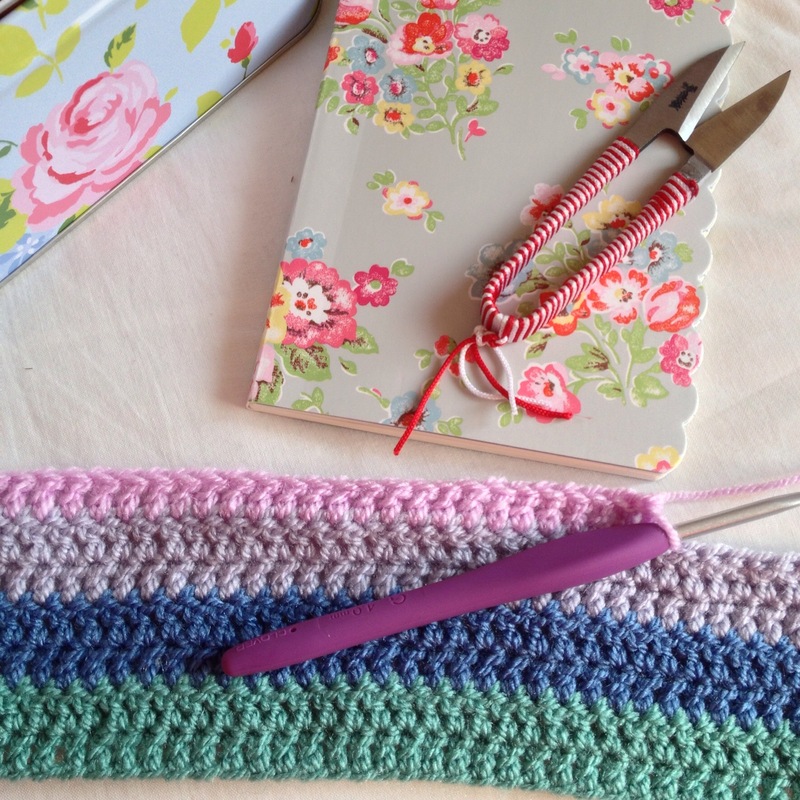 Today I’m going to crochet the picot edge of the granny stripe #2 and that’s finished too. Yay! 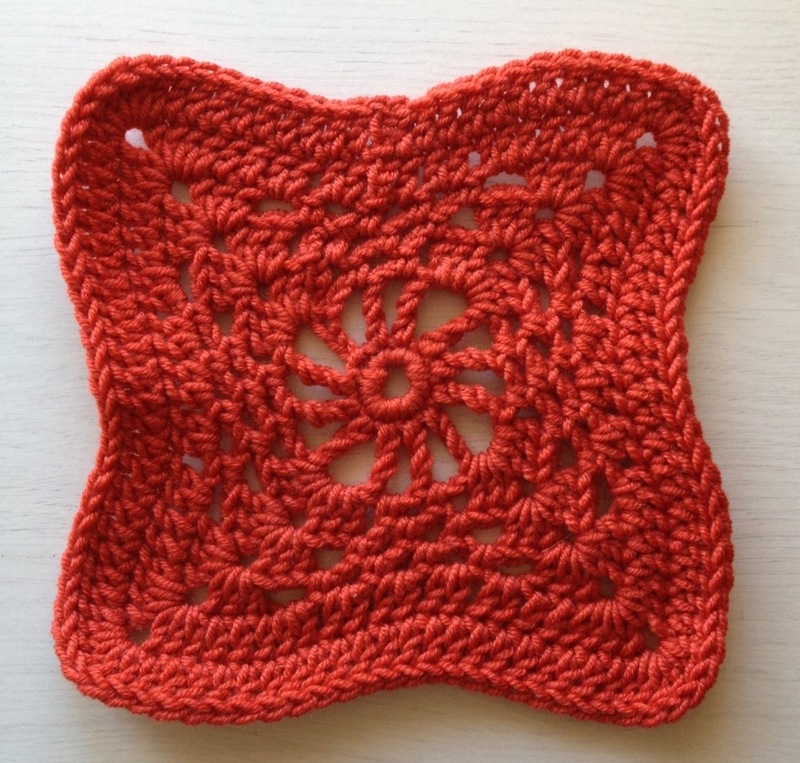 As I’ve said before – these lacy blocks are not my faves but this has a very pretty centre. This week, apart from the 3 blocks above, I’ve finished the main body of Granny Stripe #2 and have (much) darning of ends to do before starting on the edging. uh-oh. I’m glad I made this chunky seashell scarf during warmer weather, it’s needed now! What a nifty way to make a circle into a square in just two rounds! 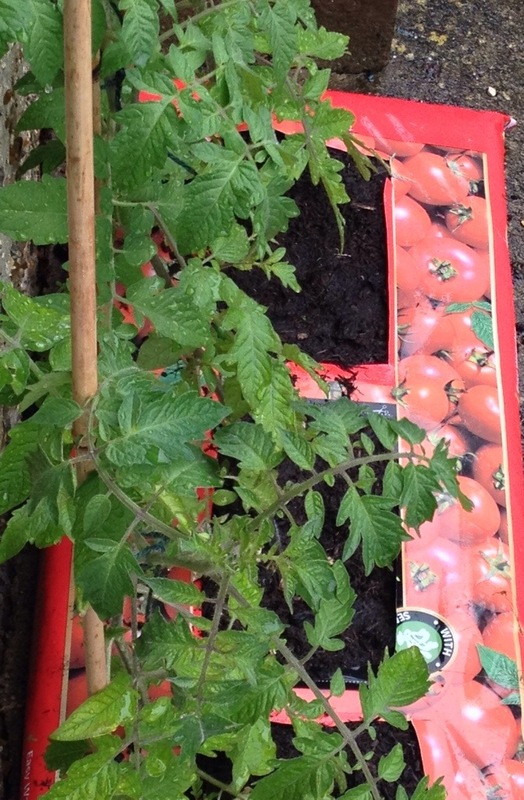 The mid-row joins are untidy but they look about the same in the book, I must be improving. Hurrah! I’m not too keen on the look of this one though S said it’s ‘sweet’. Good popcorn practice, I think I’m getting better at them. Who the hell is Gavin? Maybe Mr Eaton? I really like the texture of the stitches but wouldn’t want to make a big item as the repetition would get boring. I’ll lay out the blocks I’ve made so far one day, and take a piccy, it just needs to be a bright and sunny day. I can’t show you what else I’m crocheting, it’s Christmas themed but I’m not saying any more because certain people pop here and read. Other than that I’m on the last 6 stripes of the Granny Stripe #2 blanket, and carrying on with these CAL blocks week by week. I tend to make them over a few days then leave them so it doesn’t feel like the CAL is taking over, it’s a doable pace and I’m not bored. Have a relaxing weekend and stay warm if you’re in the UK. It’s a few degrees here today with a hard white frost everywhere. Brrrrr!!!!! 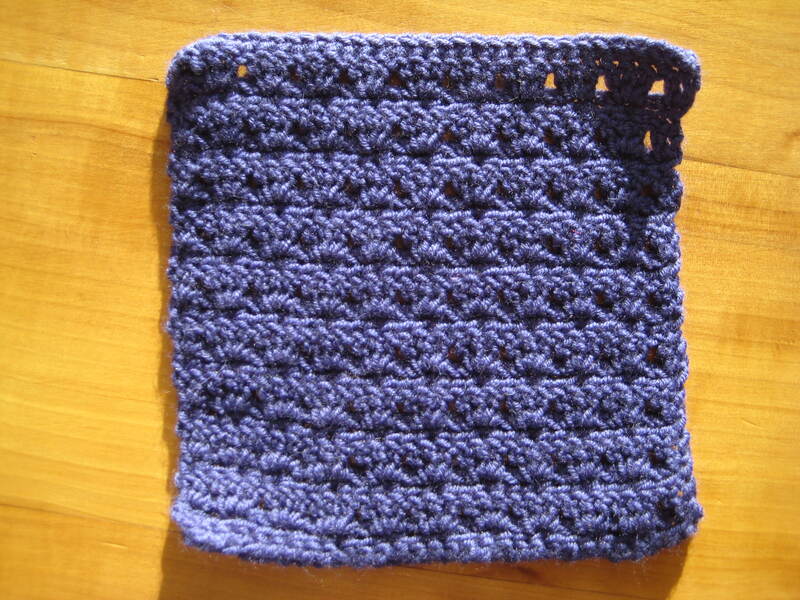 Using htr made a refreshing change, plus it’s fast growing which made it one of the speediest blocks to crochet. What are you making at the moment? Full on with Christmas crafts or ? This took me back to block #1 with all the counting at the end of each row to make sure I’d gone into all the right stitches, there was no redoing this time so things must have improved! I have to admit that even I’m half closing my eyes and sucking my breath in when I look at the colour combination I chose, so don’t worry if you are too! Not so much pink, but I do think this is pretty. 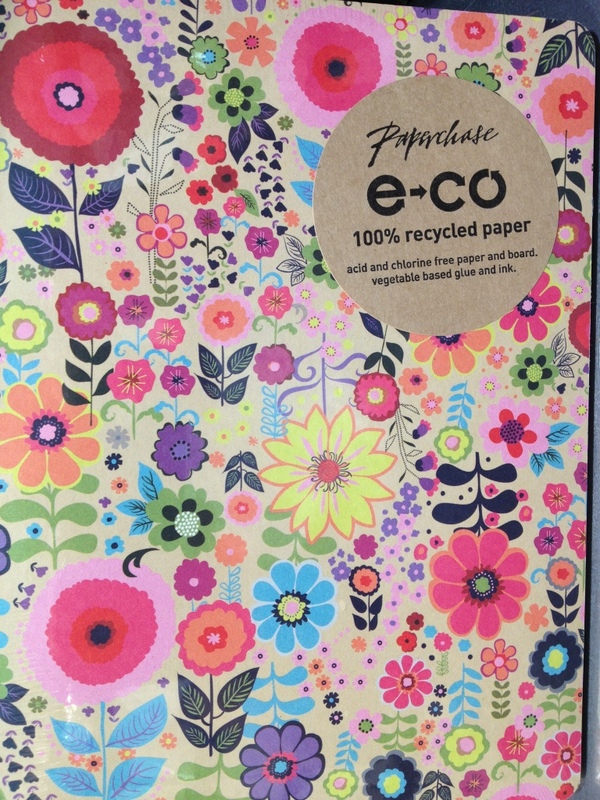 5 3/4″ square – in my CAL notebook I’ve written ‘not very (square) ish’! I’m sticking to my CAl Resolution and darning the ends of the blocks before starting the next set each time. I couldn’t bear to leave it until the end. What a job that would be! The weather is so overcast that I’ve been taking photos of the blocks on one of our back doorsteps each Friday morning. Flash photos inside make the colours look odd. Easy enough to make, but when I got to round 7 the note at the end saying it should be 9 tr along each side of the sqaure threw me as it was hard to see this and mine looked like more petals. I undid the round and tried again to the same result; so I carried on with round 8 and it was fine. If you’re also finding this carry on, it all comes together although at the time you can’t see how it will end up being square. I love, love, love this one! I’ve been rummaging in my stash cube this morning and have found a nice combination of colours of Stylecraft special DK so I can get busy making something with bobbles. It’s my favourite tip top block of CAL so far. There are now 100 members in my Ravelry CAL group! 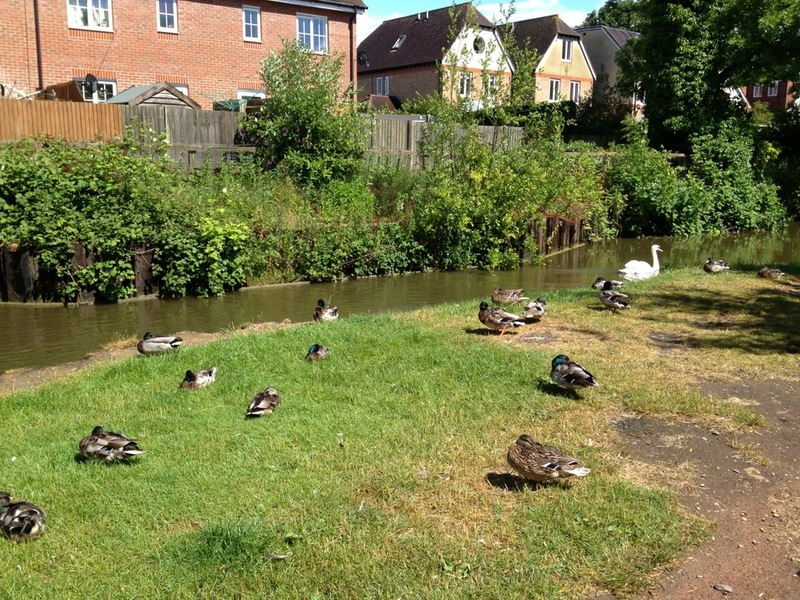 The ironic thing is that although there are now many more members the threads are quieter than they’ve ever been…. tee hee. It doesn’t matter, the threads are there if people want to share an SOS moment or have a chat. I’ve had a trying couple of weeks as I’m not well and have been told to rest by the Doctor. 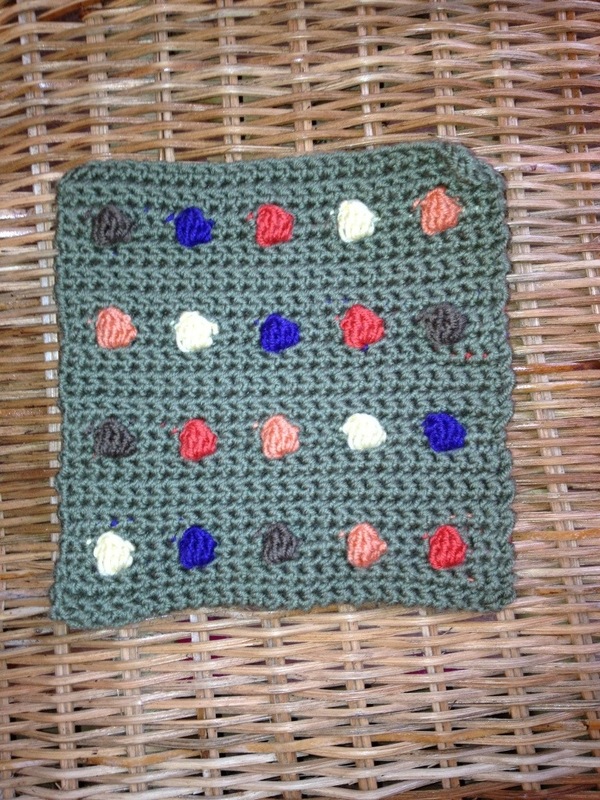 I can crochet (hurrah!) read and watch TV but I have so much work to do that it’s really frustrating. I’ve also developed an (un? )healthy addiction to Loose Women and The Gilmore Girls. Uh-oh, but the plus side is I’m up on Rod Stewart’s new album, what all his children are up to, Sienna Miller’s controversial photo portrait, the goings on of Ken and Deidre, who is going into the jungle on Sunday and that Stars Hollow is now clear of rotten Easter eggs. I hope you’re well and getting on with whatever it is you have to do, as well as the other stuff that you enjoy. Have a good weekend! Baby cashmerino (being slightly thinner than dk) is just a bit too thin to show off this stitch, like I thought for the popcorn stitch it needs a bulkier wool to show it off. I probably should have pulled the chain a bit tighter as the top of the stitches look a bit loose. But it’s my first ever go at the puff stitch. Darning the ends will make it a bit less saggy looking in places. 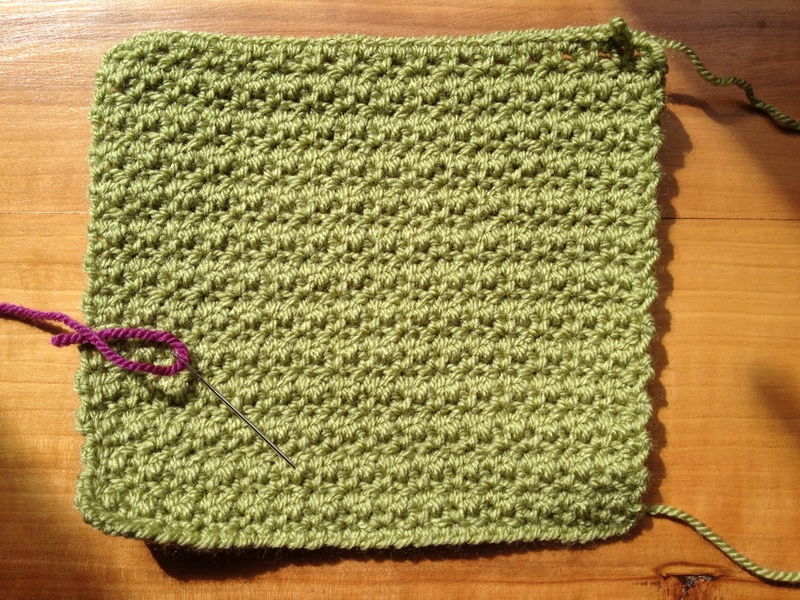 In my CAL notebook I’ve written that the Harmony Guide to Crochet says ” A puff stitch is a cluster of half treble stitches (usually 3-5) worked in the same place to make a soft lump.” Ha! I’ve created soft lumps. 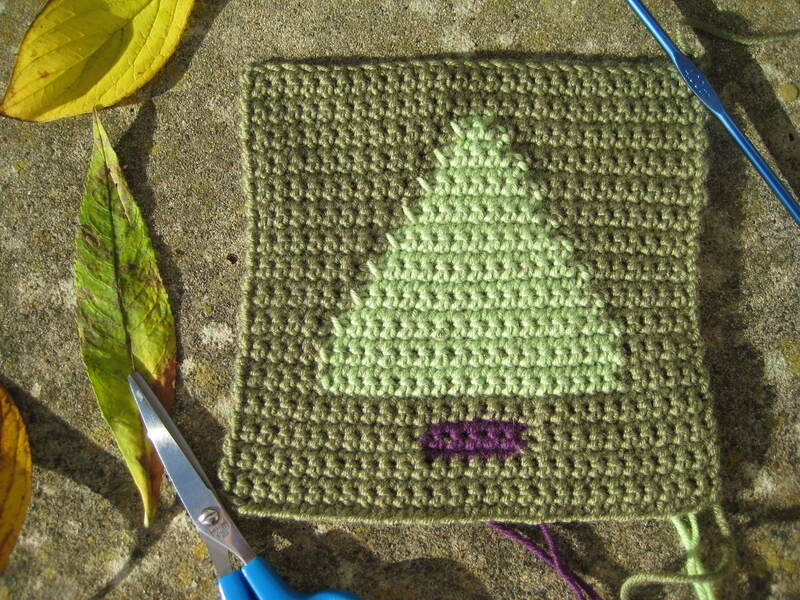 I used the new colour to finish off the last stitch in the background colour when starting the tree stitches each time, and swapped to the background colour to finish off the last stitch of the tree design. It seems to work. I’m kicking myself that I didn’t think of using two balls of background colour instead of carrying all that yarn, but I wanted to avoid darning and didn’t think of the third way. D’oh! At 5 3/4 ” square this is turning out to be the average size of my blocks. This, of course, needs blocking to straighten it out but it’s ok. I’m not a fan of very holey blocks but it’s good to try new stitches. I think there’s a mistake in the notes for spike stitch at the top of the pattern. I checked the notes at the back of the book, then went to my trusty Harmony Guide to check too. Basically don’t go into the top of the next stitch after going below the next stitch, yo and pulling through, just yo again and draw through the stitch as you would a normal dc. I tried it the way the note said and the spikes were almost diagonal. 6 1/4 ” wide 5 1/4″ high. Oh! Lots of darning too, would it work to carry yarn up the sides? What did you do? I’m definitely learning new skills and picking up tips from other people doing this CAL, it’s good learning new techniques. It’s made me want to move my knitting on and try something new (harder!) sometime. Did you see what a commenter wrote on my last CAL post? Garish shades actually, knowingly made bright and a bit clashing, but it’s an antidote to the grey roof outside. I like it actually, though wasn’t sure at the time of making. This is an ingenious pattern; I assumed we’d be increasing from the bottom up and out, like other corner squares, but it’s decreasing top down. 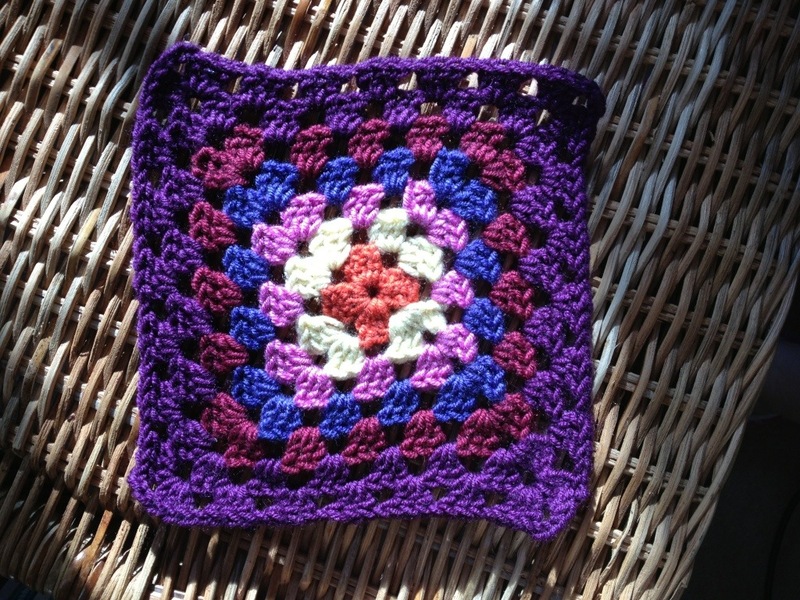 I say ‘square’ but this is going to take some blocking to achieve that! 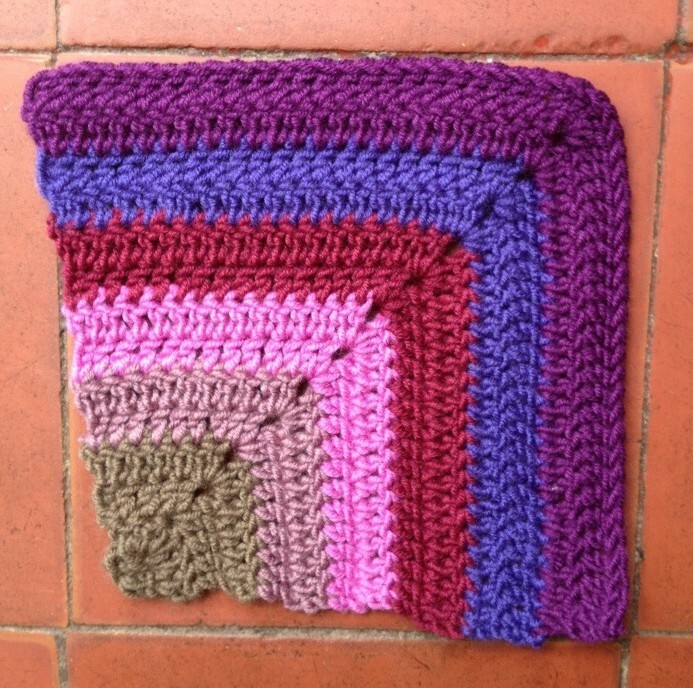 I’ve read on a Ravelry forum that front post crochet can often pull the work inwards, this was a relief to read. This is my first time doing front and back post crochet and it’s quite fun. I like the warmth of the block as this technique makes a thicker fabric than other stitches. The colour combo in the book is not the best in my opinion as it makes it look like the maker used a variegated yarn and the stitches and texture don’t show up very well, completely different colours ie: red and green and a charcoal grey might have been more effective? 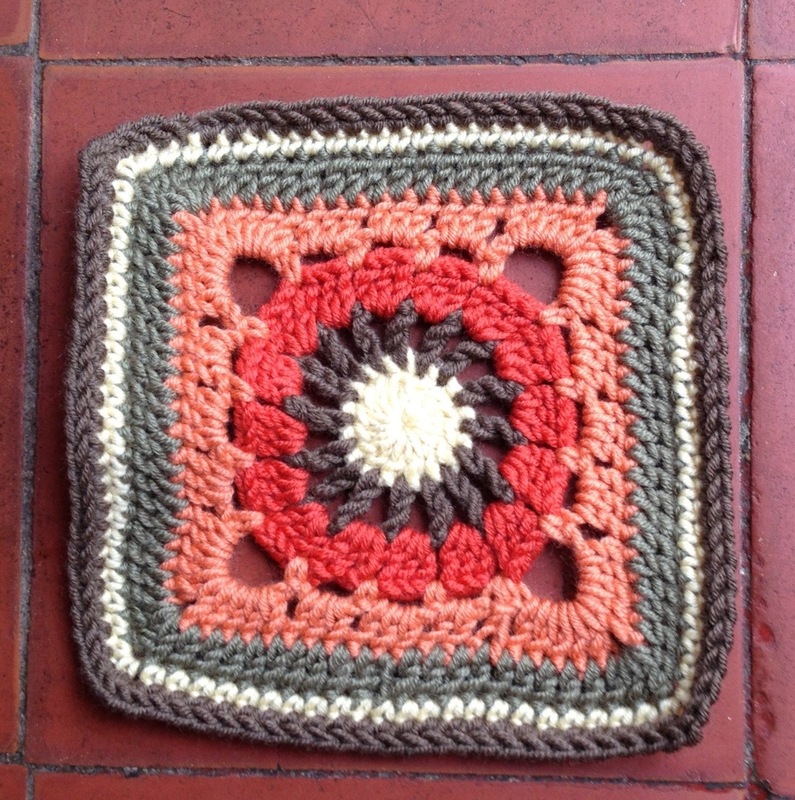 I’ve added an extra round of dcs to bring it up to a 6″ square – well it is when it’s pinned out. This is the first time I’ve added another round to a block and think it’s a nice band of border. Not a nice one to make. Horrid! 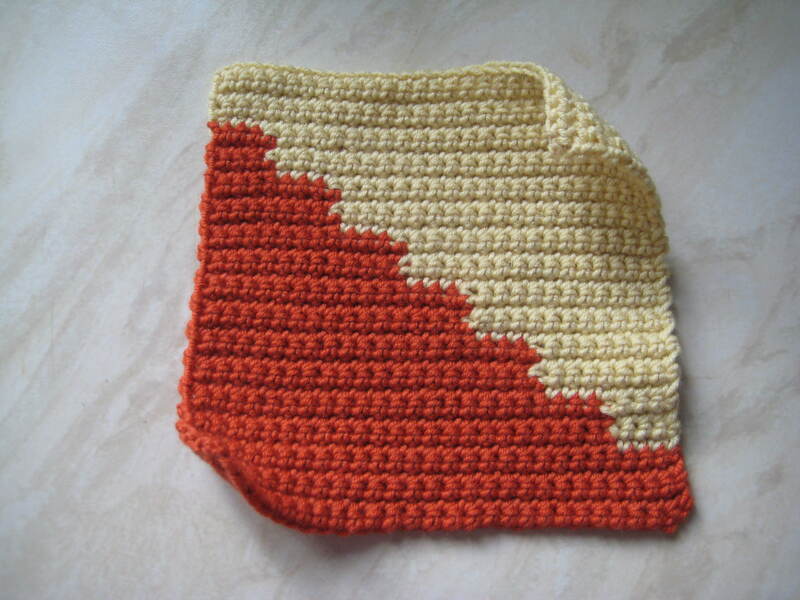 I hated crocheting trebles into the side of another; it was fiddly and annoying. I did enjoy listening to the last part of this audio book during the process, it’s superbly read by the author and made me laugh and cry. (Trying not to sob over the death of a horse when in the smart business class section on the flight home from Lisbon was not a good look.) I like the look of the pattern but will avoid repeating this technique numerous times in one design in the future! Terrible photos I know, all taken at the same space of time but the light is so variable (poor mainly!) that the table looks different in every shot! I think we’ve lost some block makers on the CAL now, or at least they’ve completely disappeared out of view since the first few blocks. It is a bit of a big project and easy to get behind on, that’s not a problem as anyone can join or rejoin whenever they’re ready. I’m enjoying it still but the thought that at 2-3 blocks a week it will be going on till June is a bit daunting! 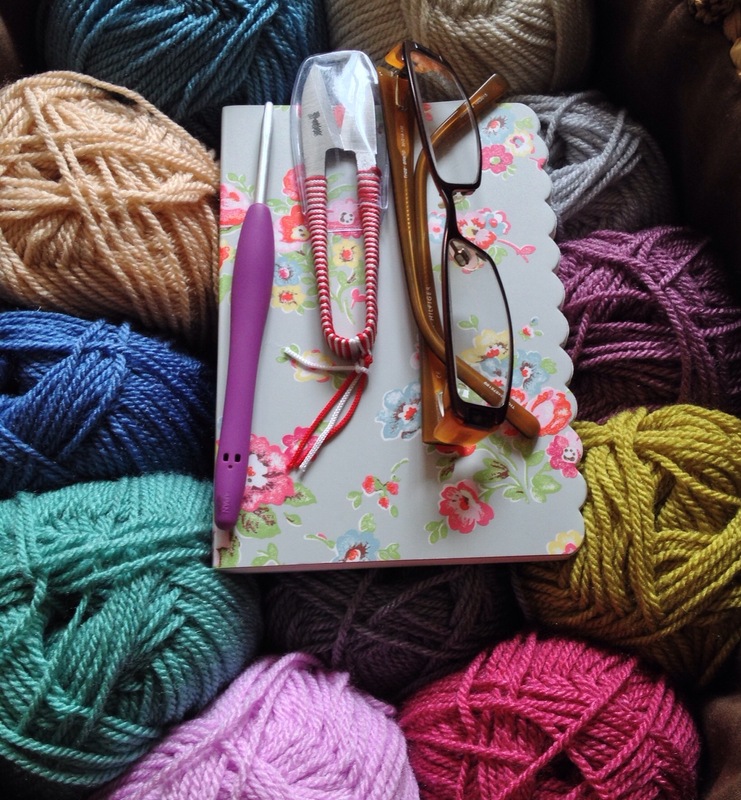 If not crocheting along with us what are you up to at the moment? 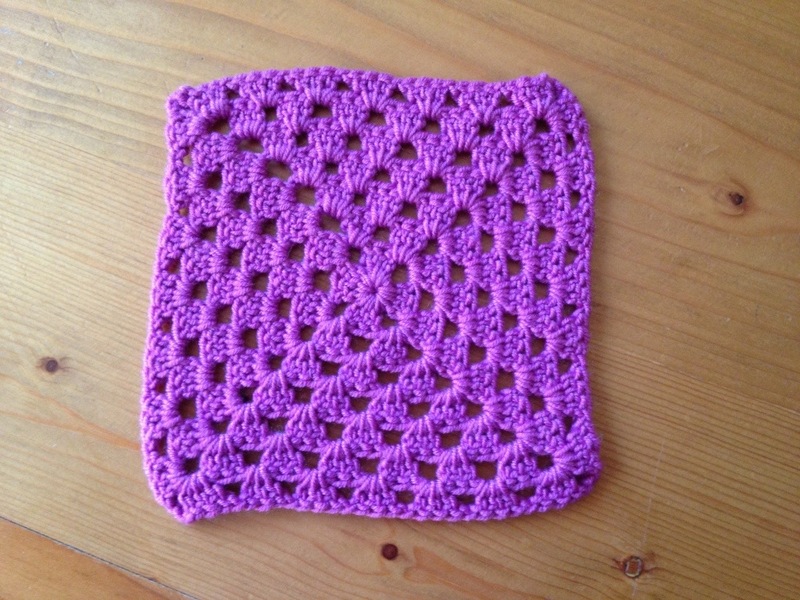 This is a really pretty square and I can imagine a whole lightweight throw made of them. I used the finish-the-last-stitch-with-the-new-colour method which usually works well, but in this block you can see a spot of colour to the left of each bobble. I’m glad I wasn’t trying to replicate Jan Eaton’s exact colours as her a,b,c method doesn’t work so well when you’re a leftie. Basically if you look at the bottom right bobble that was my first as I work from L-R on the FR, turn and the bottom right bobble ends up being the first. If you’re a rightie and are furrowing your brow; don’t worry, it’s ok. I can say confidently that I’ll never make this again! As anticipated the round block is smaller than the rows one. That’s fine I’m not worrying till it’s time to decide how to use them all. 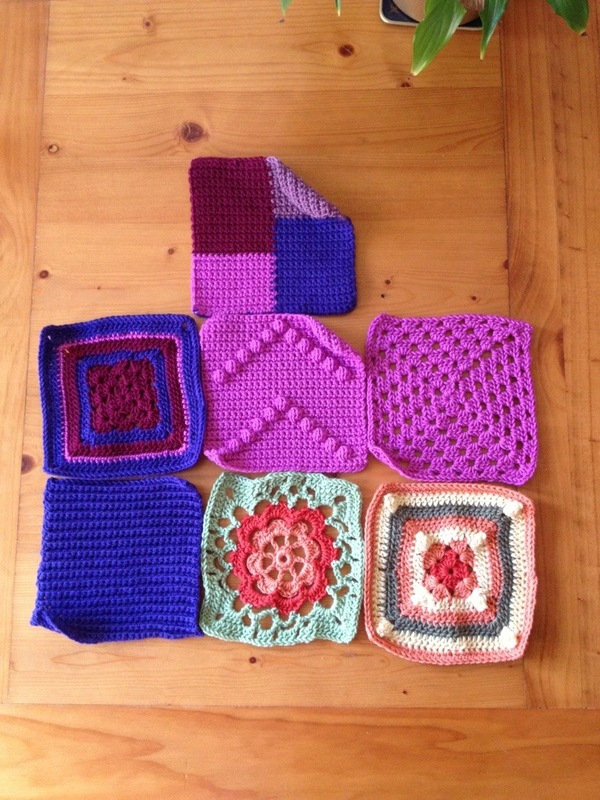 I had a message from someone who had given up the CAL after the first two blocks; when she realised they were all going to be different sizes. Oh dear. 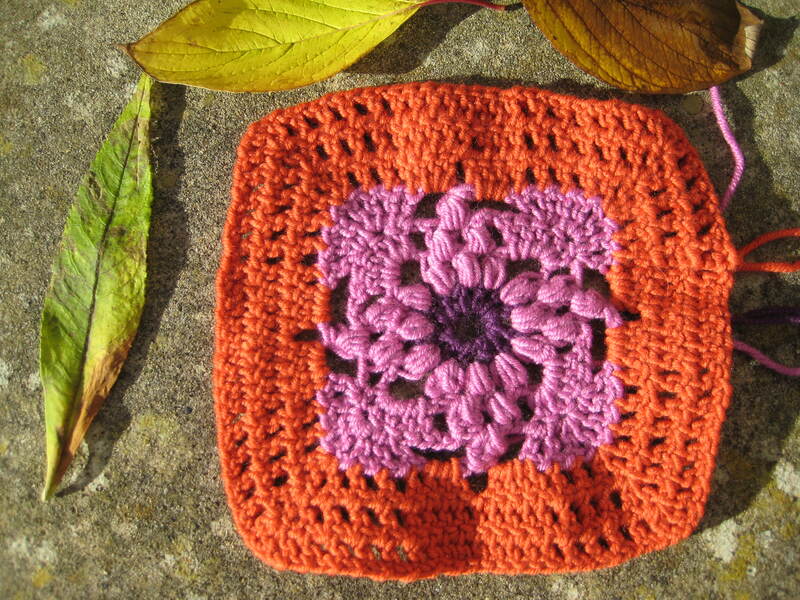 I’m off to a (fingers crossed) sunny place today so will crochet #21 when I’m back next week. 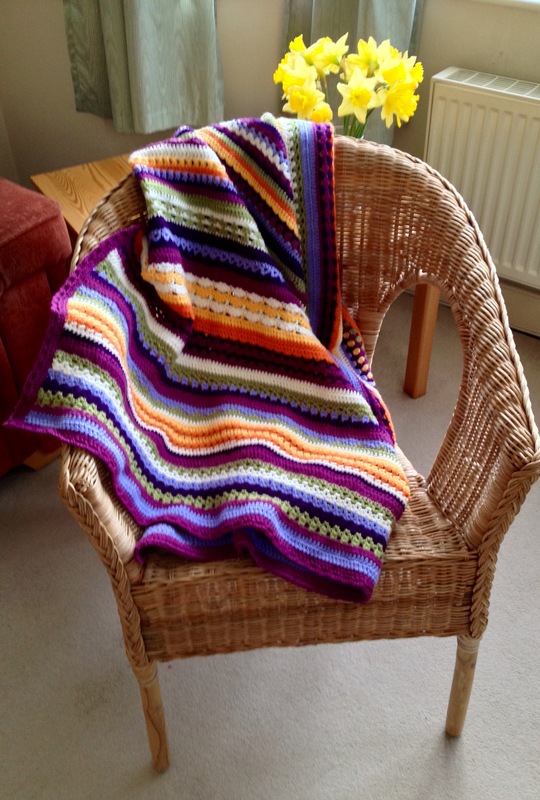 I’m going cold turkey – NO CROCHET! A knitting fiction book that I’m halfway through will be my sort-of substitute. 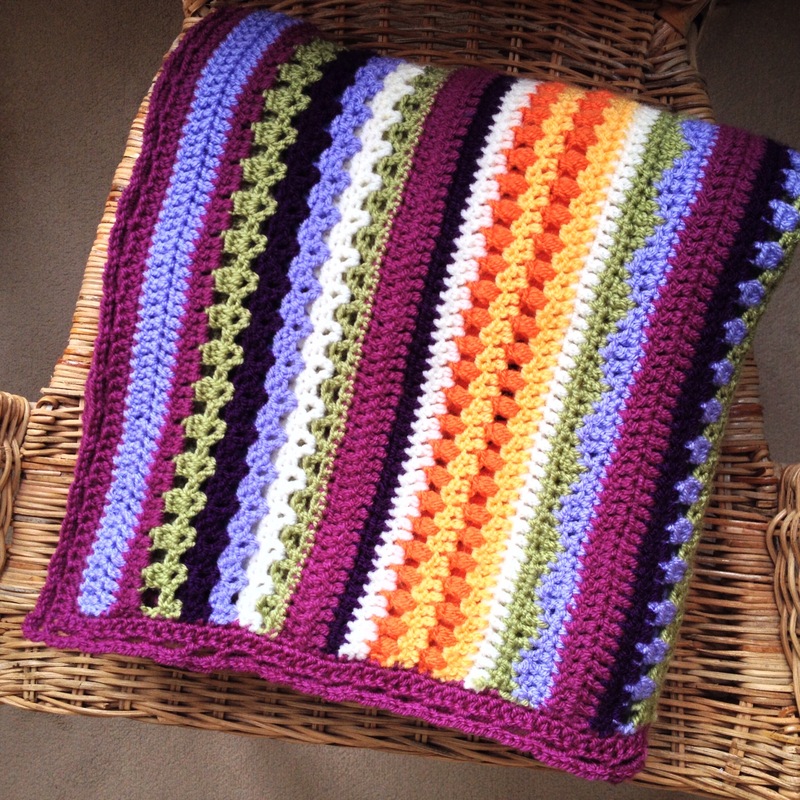 I need a bit of a crochet holiday after completing those blankets and that bobble block! 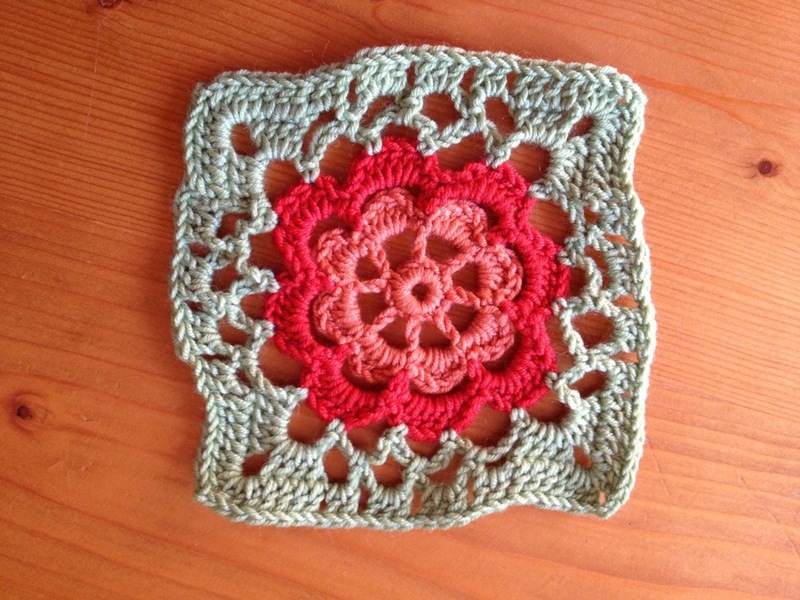 How are you finding this crochet along? Is it still fun and enjoyable, or feeling like homework yet? Any blocks you’re dreading making? 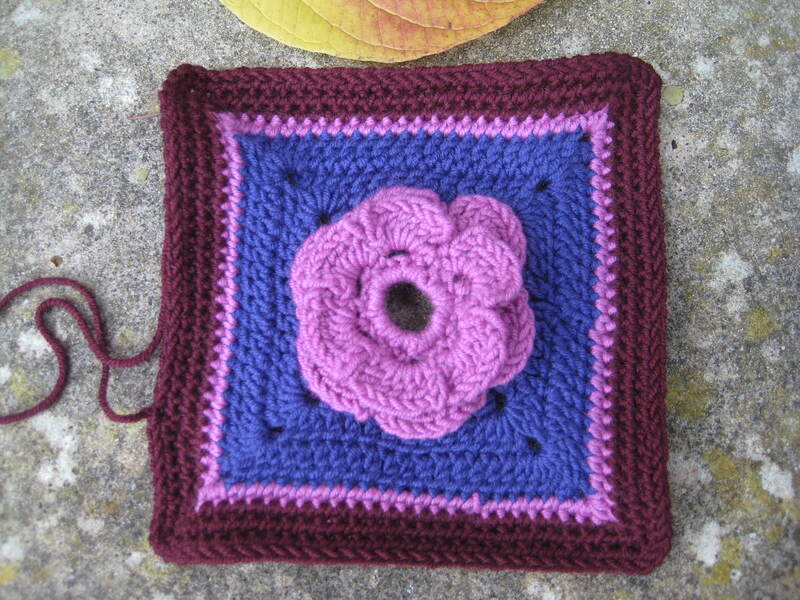 I have to say that the entire pattern for the Blooming Flower cushion is better than the one for this single block. 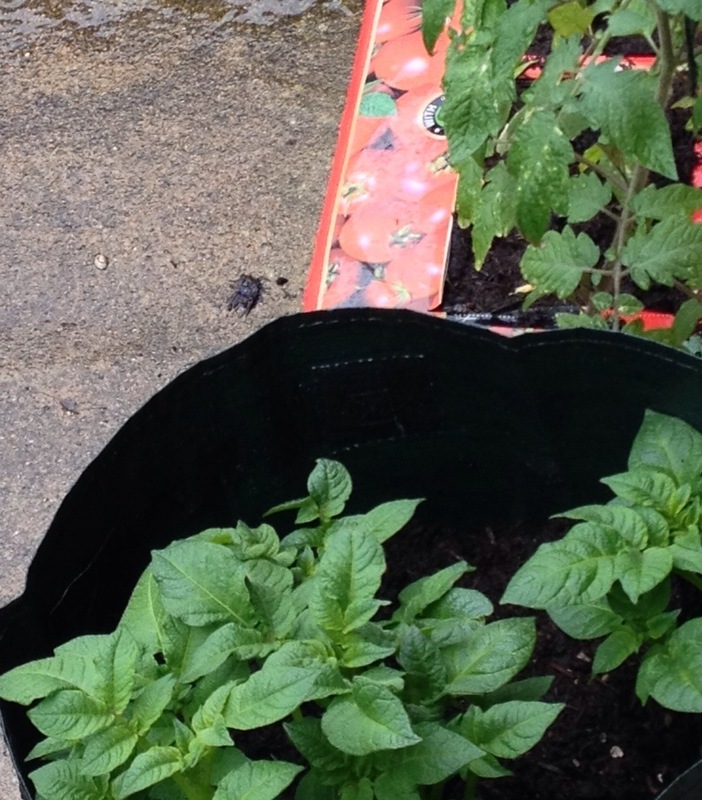 It just makes sense with Lucy’s adaption of an old pot-holder pattern. I chained 6 for the foundation row, not 8 as specified because the resulting hole was too big on my first try. Row 5: I chained 6 not 7 and that may be why the petals are slightly frilly. I quite like the look, but I might do another version of this block sometime. The other bobble blocks were curly too and needed pinning for the CAL photographs. I will try blocking for the first time soon. This morning I grabbed what was to hand! 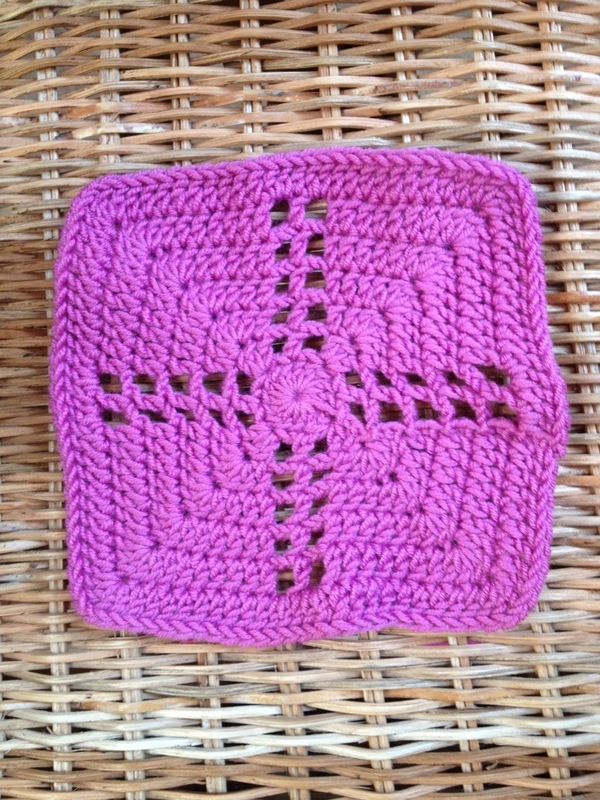 Another one of the blocks which has turned out to be 6″ square – always pleasing! Can you tell I grabbed a small corner of sunshine this morning?! It irritated me seeing the strand of light green that I haven’t worked in properly but I made myself not unravel what I’d done. I found this block not tricky as in making my head swirl with complex instructions, but because of changing the yarn over so frequently. 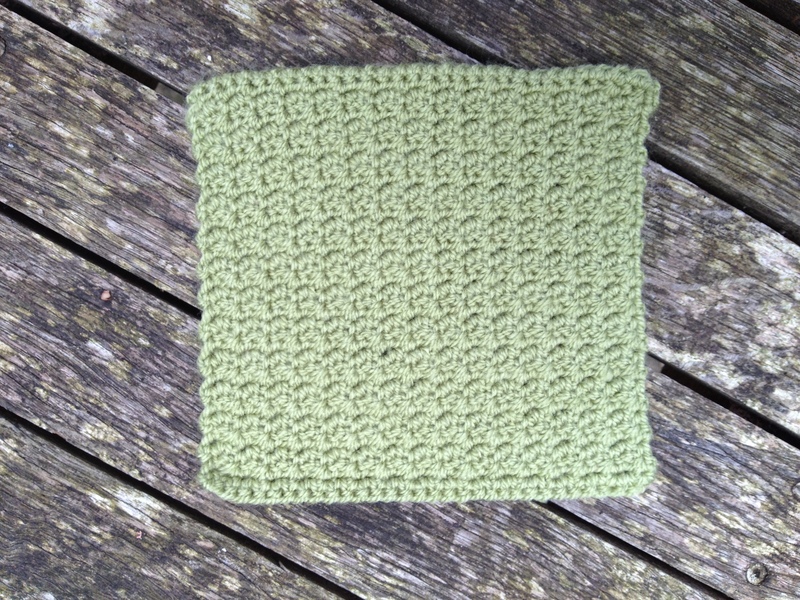 (I finished off the fourth stitch in the other colour shade ready for the following block.) 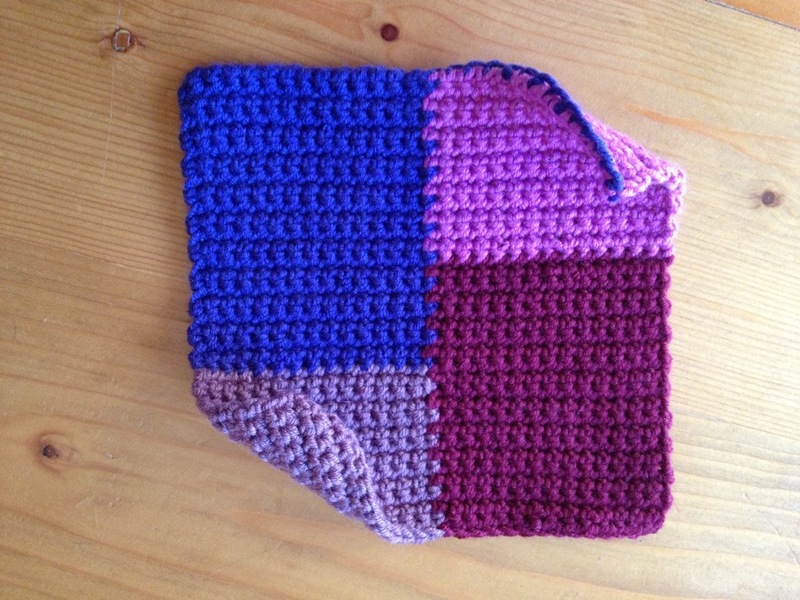 When I crocheted the #169 Interlocking Squares block you snip and start a fresh colour each time which is much more relaxing. Give me more darning, than swapping colours every few stitches, anytime! 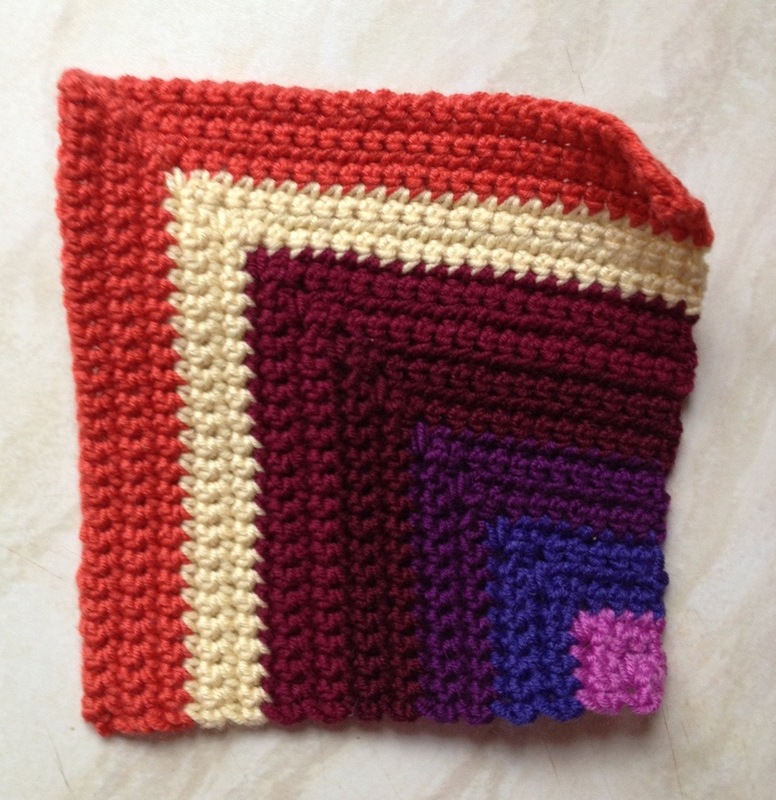 This is one of my favourite block designs so far, along with #4 Bobble Diamond and #7 Corner Granny which were both crocheted during week 2 of the CAL. I used the magic ring method for this block instead of the chain and not chain stitches as the pattern called for, and I think it’s probably a much tighter centre circle. I was really careful to darn in the end firmly as MCs may not be so secure as starting with a slip stitched chain. I started this with a magic ring too. Is there a typo in this pattern? I tried the instructions for round 6 where it says to do 2 tr into the next 2 tr but it doesn’t look like there are 4 stitches in the block photo in the book and it looked a little top heavy, so I just did 1 tr in each of the next 2 tr and it looks right to me. I do like these corner blocks, but if my blocks are going to become one or two blankets some are going to have to be part of the main body as I’ll have too many. 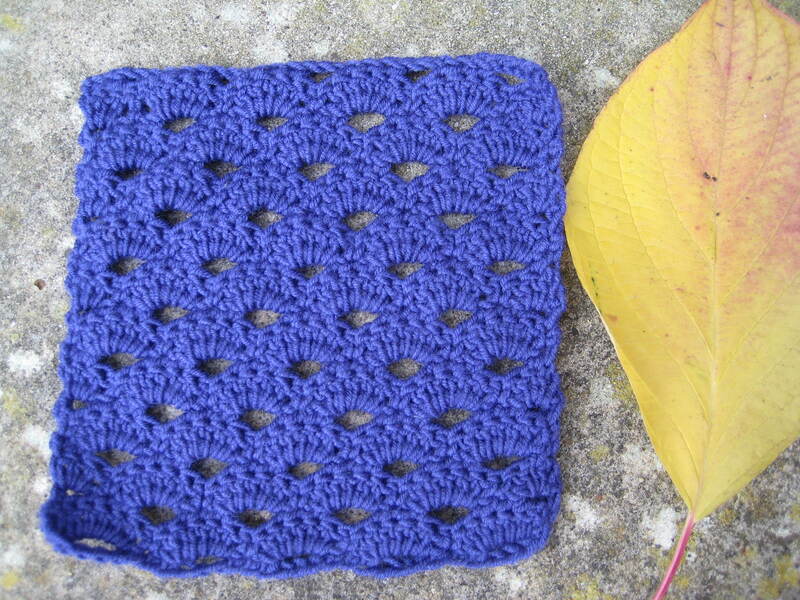 This square is very easy and quick to make, though the blocking might take a while. I’m putting that part off till….next year?! Five weeks worth of blocks! This is a good pile already. 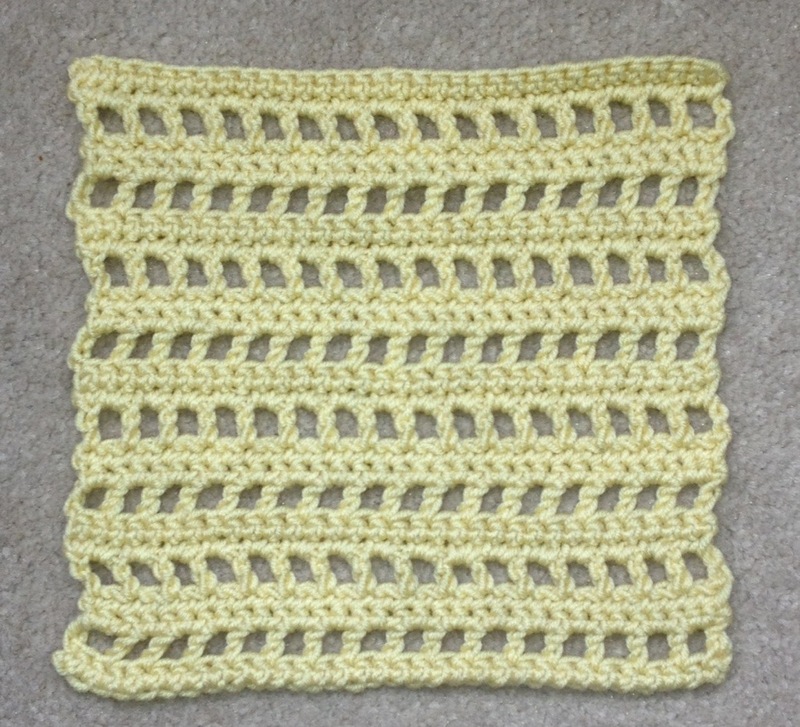 For the last few weeks I’ve had enquiries from new readers here, or members of Ravelry, about joining this 200 Blocks CAL (crochet along) which is great. There are now 92 members signed up to the Ravelry CAL group and other block makers who are following along through this blog. I reckon there are over 100 people crocheting along with us. :-) If you want to join in then please do! I keep saying the more, the merrier. 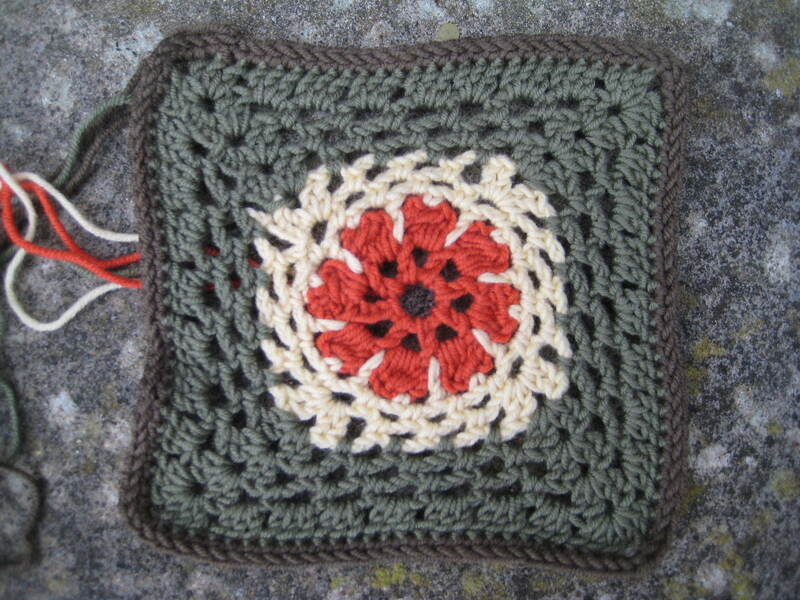 NB: The Interweave site has a list of corrections for some of the block patterns #16 #35 #47 #48 #58 #79 #100 and a correction to the technique instructions for working in rounds on p.120. I think this is just for the USA publication. My book is the UK edition published in 2004 by David and Charles. It’s vital to check there are 33 dc at the end of your foundation row and I also found counting at the end of each row 2 a good check to make sure you aren’t missing/adding a stitch. Wibbly wobbly patterns like this are easy in lots of senses – they grow fast and aren’t tricky to do – but they can funnel out or in if you’re not careful. I wasn’t sure about this after I’d crocheted it, S thought it “looks particularly 70’s crochet” and I reckoned it was a bit string bag. After a weekend away and looking at it with fresh eyes I think it might work well as a scarf design, if you turn it on its side and squint a bit. I stopped halfway and spotted a few places where I hadn’t crocheted the yarn in properly and so decided to unravel this block. I’ve just been away for a fab long weekend with a group of friends in the oldest recorded city in Britain (guess before you click?) and so I’ll do another version this week. I really like this! 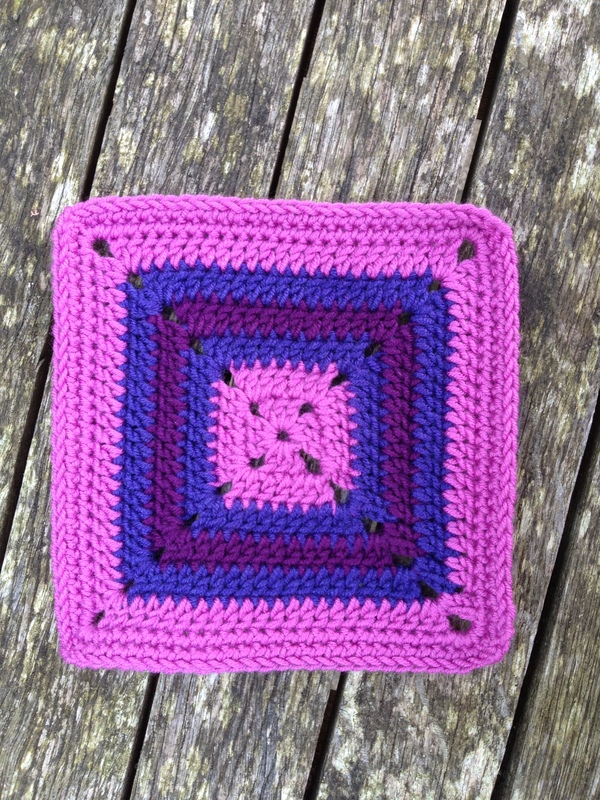 It’s also one of the few perfectly 6″ square blocks so far. We are now a month into the Crochet Along! It’s incredible how fast time has flown. How are you getting on? Is 2-3 blocks a week feeling do-able? Yesterday after my last post I had an email from someone saying they didn’t like to comment publicly, but did my popcorns look a bit odd?? 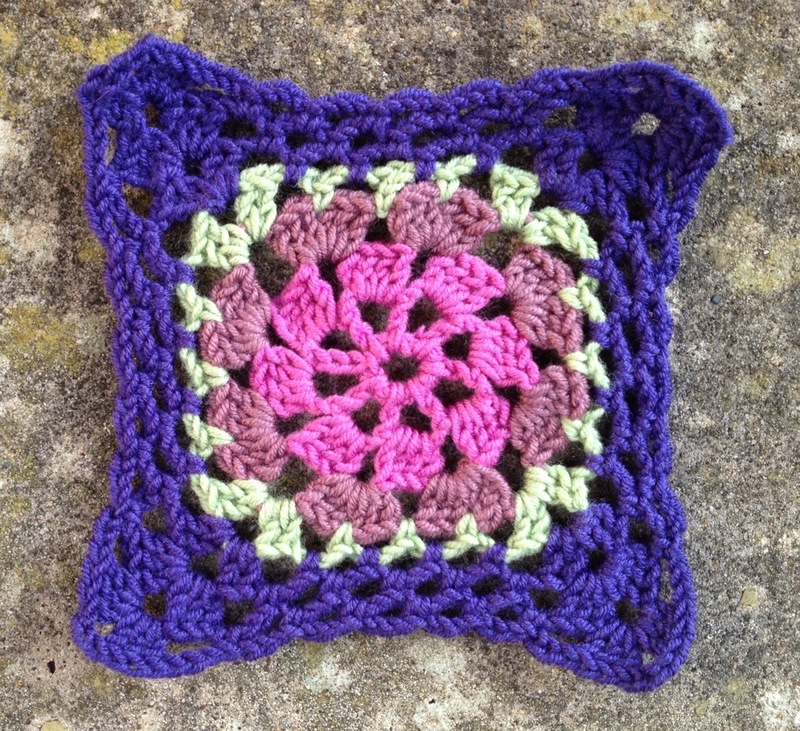 After affectionately calling her a nasty biatch or similar, to which S said “it’s only crochet”, I had another closer look at the block this morning. Apart from the centre looking square rather than drawn into a circle the popcorns are a bit flat somehow, maybe just not pulled quite tight enough on the finish? Have another look too and see what you think? I also realised that I’ve obviously missed out a row because there aren’t enough holes. 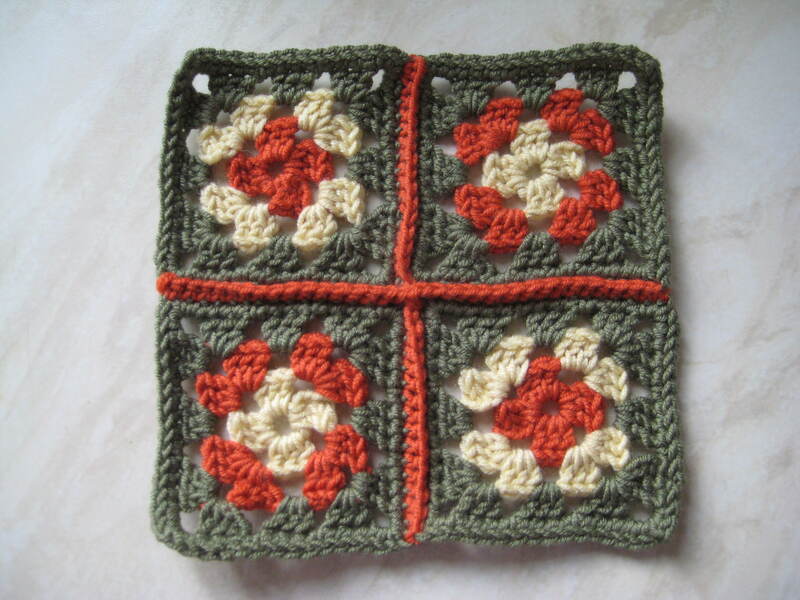 I’ve only done three – if you look from the middle outwards -rather than the block in the book which has four. 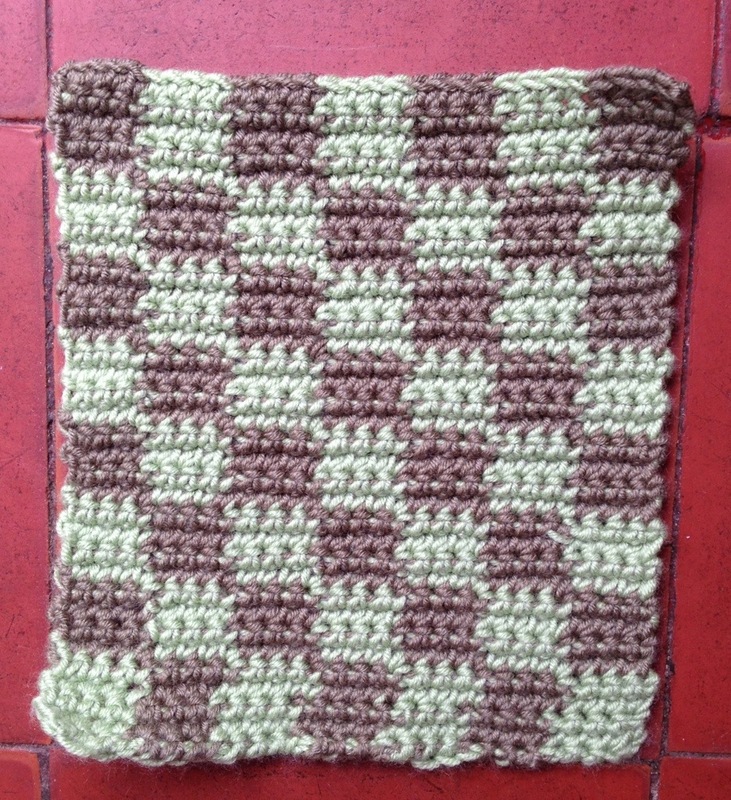 Yes it is ‘only crochet’ but the point of working my way through Jan Eaton’s 200 Crochet Block book was to learn new skills, techniques and become better, not perfect but improved. I’ll be back with a third time lucky #8 shortly. Grrrrr. I like this pattern so much I made two! It’s my favourite so far in fact. I might have to try blocking for the first time so these are at their future best. I dislike the mid row joins too. This is not going to be a pattern which is doubled, eh? 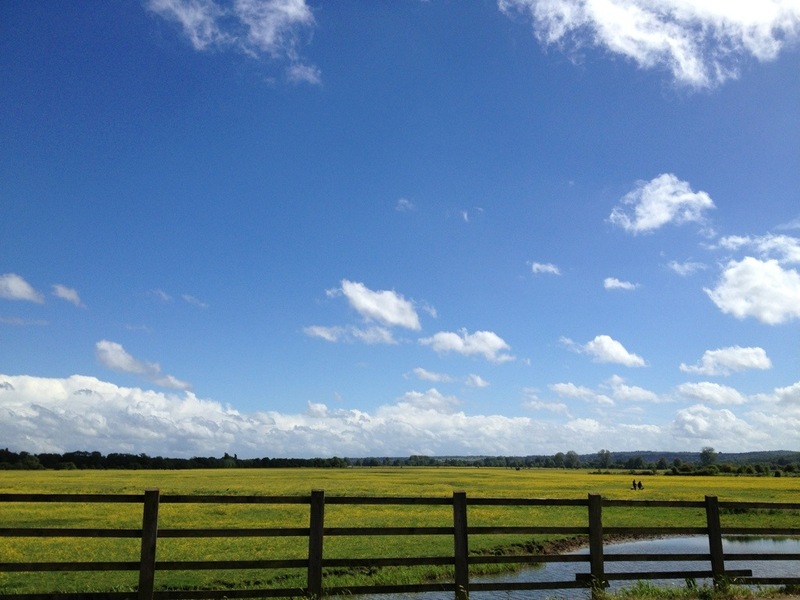 (Introducing my new colour – yellow.) Easily made but I’m not so keen on very holey patterns though the colours are pretty. It needs block-blockety-blocking of course. Really looking forward to #12 Fine Lines next week, it’s pretty and has an easy rating in the book. Aren’t they beauties? 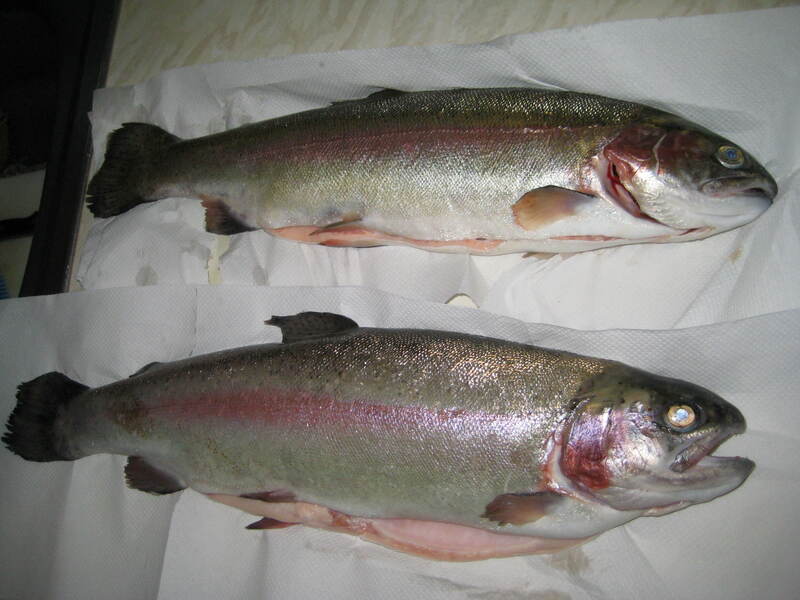 We’ll be eating part of one (they’re big beauties) tonight – new potatoes, trout and salad here we come! Practice block in Stylecraft Special DK, 3.5 mm hook. Ok so Popcorns are not tricky exactly, just a little fiddly, but I’m just not a fan at this point. They don’t look very special to me, but I do love a good bobble stitch I’ve decided! More importantly: what are you having for dinner? I’m pleased that I found bobbles so easy after my concern that I’d struggle. They are a piece of cake! As I said before; I checked The Harmony Guide and did a chain after each bobble to secure them. So easy in fact that I made another! (They curl a bit at the top right and bottom left corners so I pinned them to the carpet to photograph. Anyone else have curly bobble diamond blocks?! It’s crucial to get the very end stitches of the foundation row right otherwise row 1 is completely off-kilter! I like this one a lot, I think the DBBC colour fits the name and pattern perfectly. I just wanted to see how my Debbie Bliss colours, well 8/9 of them anyway, look together. I decided there’s something missing and bought number 10 yesterday. All will be revealed soon! Have you noticed that I’ve stuck to my CAL Resolution? 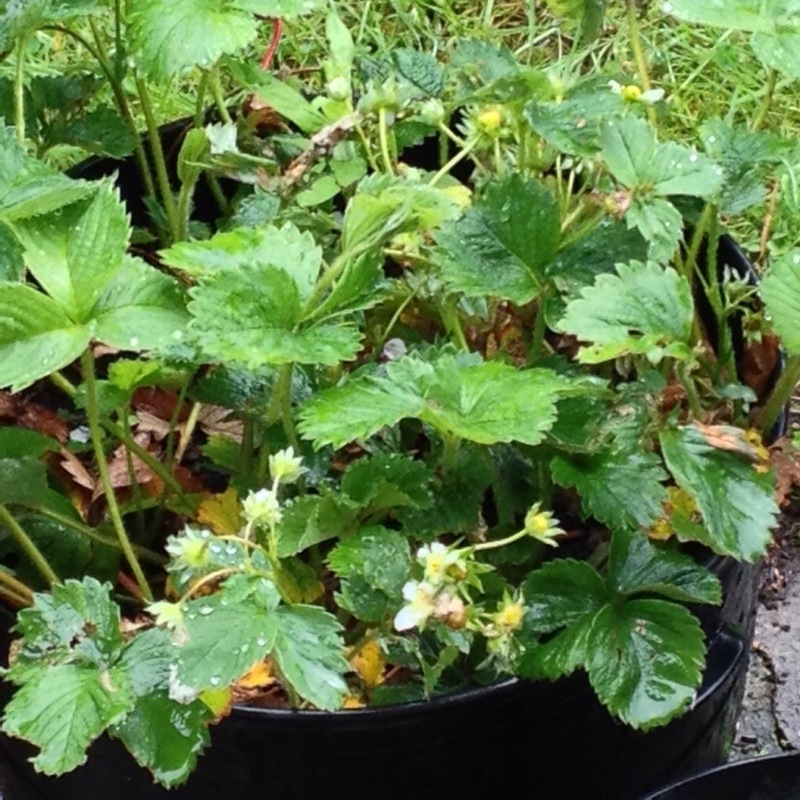 So far so good anyway…..
I’m going for a little wander round blogland now to see how others are getting on, there are also some fab pictures on Ravelry and more being being added to the group’s projects page all the time. My first attempt at the dreaded bobble stitch. They’re easy! The tops of my stitches lie the other way to those pictured in Jan Eaton’s 200 block book I note. I think that’s because I’m left-handed so crochet in the opposite direction (left-right along a row) if you know what I mean?! The Harmony Guide to Crochet Stitches advises that with bulkier bobble clusters it’s a good idea to work an extra chain stitch to close them firmly, so I have. How are you getting on with this block? PS: S said “You could crochet a snooker table”…I don’t think my eyes can possibly roll any more vigorously than they did. 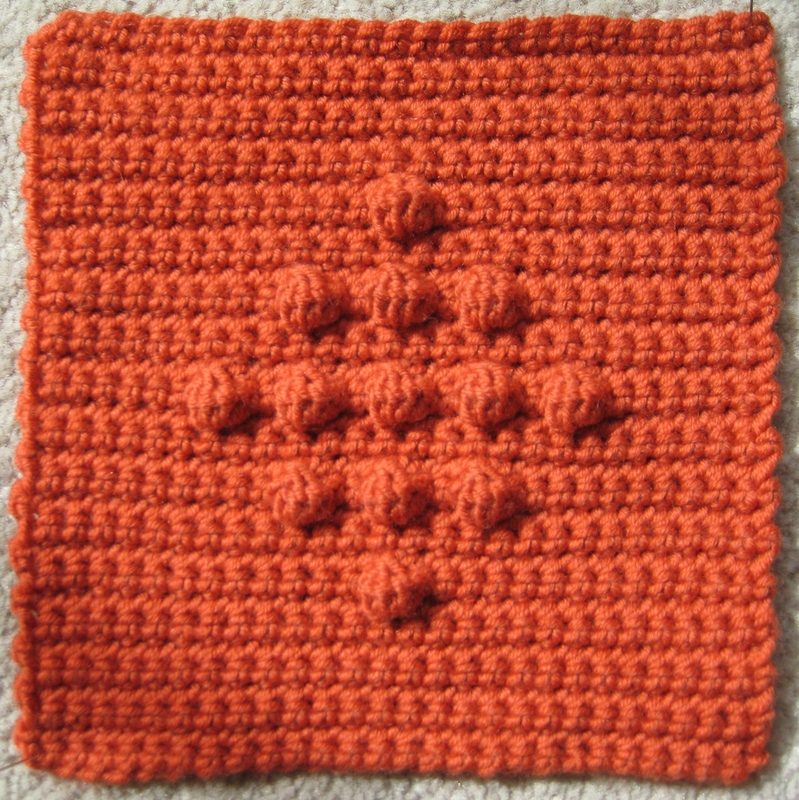 I’ve undone and re-crocheted block #1 (of the Stylecraft practice set) because I had a message yesterday saying that the reason it was smaller in size than the babycashmerino block was it had 12 rows in the first half, as opposed to -the correct- 13. Oops! Once I know there’s a mistake or something wrong, it will bug and bug me until I have to do something about it. Oh well, maybe I will get a ‘satisfactory’ rating from The School of Crochet OFSTED team but I don’t care. This is a fun project to practise and improve my skills, while learning new techniques. 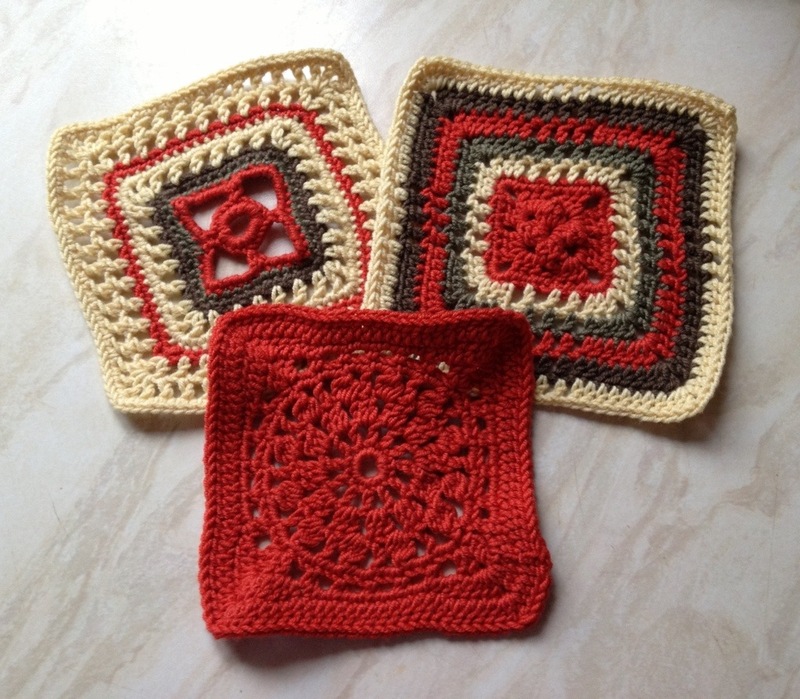 I was really keen to start crocheting something new, so I crocheted the first 3 blocks last week. I was feeling a little apprehensive about how long they would take me to accomplish, since I am probably only at an intermediate crochet level at this stage. Will I understand the patterns? Will I master bobble stitch (block #4 uh-oh) spike stitches and the dreaded popcorn which always makes me nervous for some reason, although I’ve never actually tried making one. They’re probably a cinch? I’m also between projects because I’m meant to be darning in all those pesky ends of the Rhubarb Ripple and the Target Squares blankets, but my fingers get itchy if I don’t do any crochet for a day or so. CAL Resolution: I’m going to darn in every single end when I’ve finished a block before I begin another. Darning is fine, but not 1000 ends at once which holds up the exciting final stage of joining or edging. Have you made any CAL resolutions? 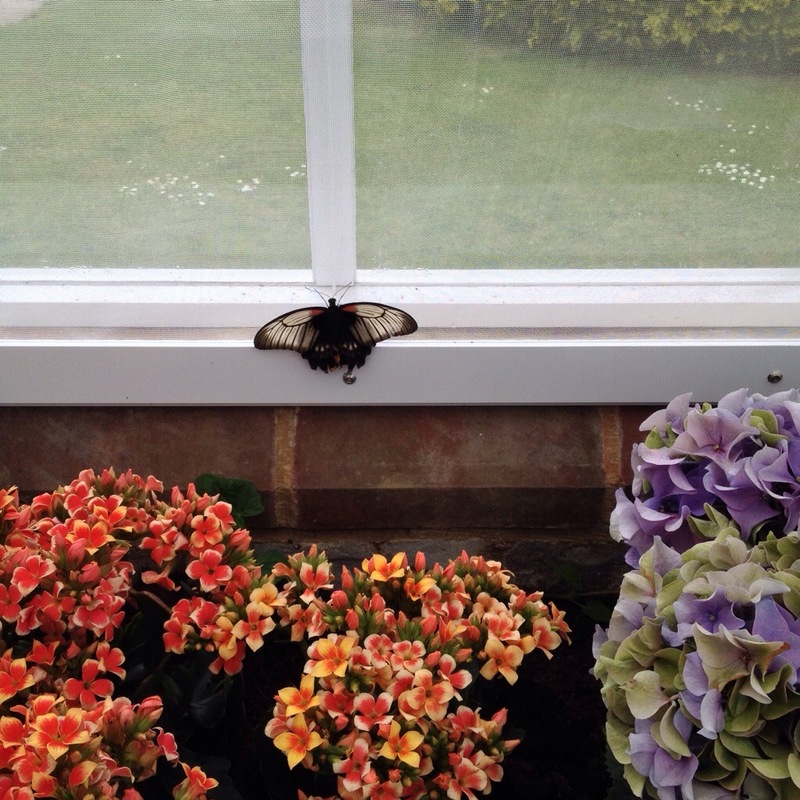 Go on, spill if you have – I’m so nosy. If the paper can stay this is fine! Redo – carefully! Counting is the answer. 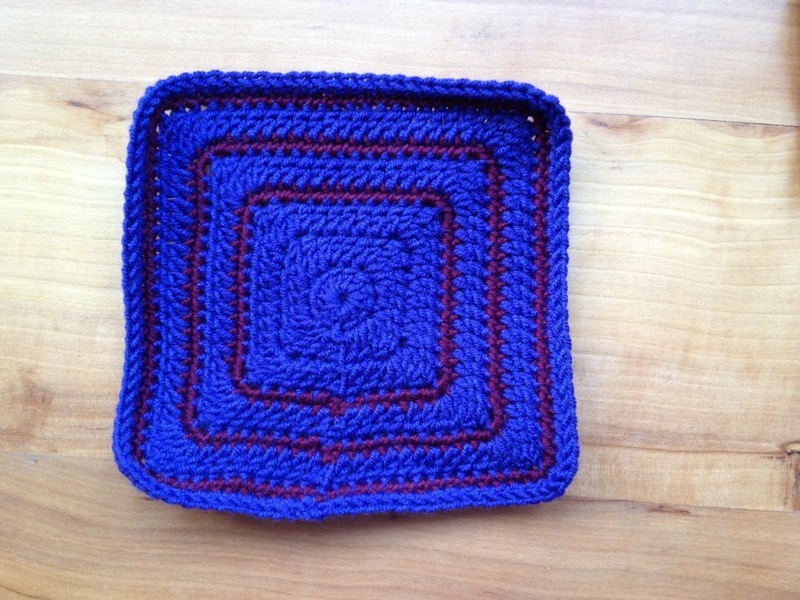 Stylecraft special DK (SSDK) 6″ square-ish! >I’m going to carry on using the two hook sizes for the two yarns. >I’m not going to stress about the differing sizes as there’s blocking, which I’ve never tried but is meant to work like magic, also some clever soul suggested using the larger blocks for one project, the smaller ones for another. >I’m just going to enjoy the challenge of crocheting the blocks and decide what to make out of them later. PS:: I’ve found out a mug of earl grey tea on a lap-top does not reach a happy conclusion. 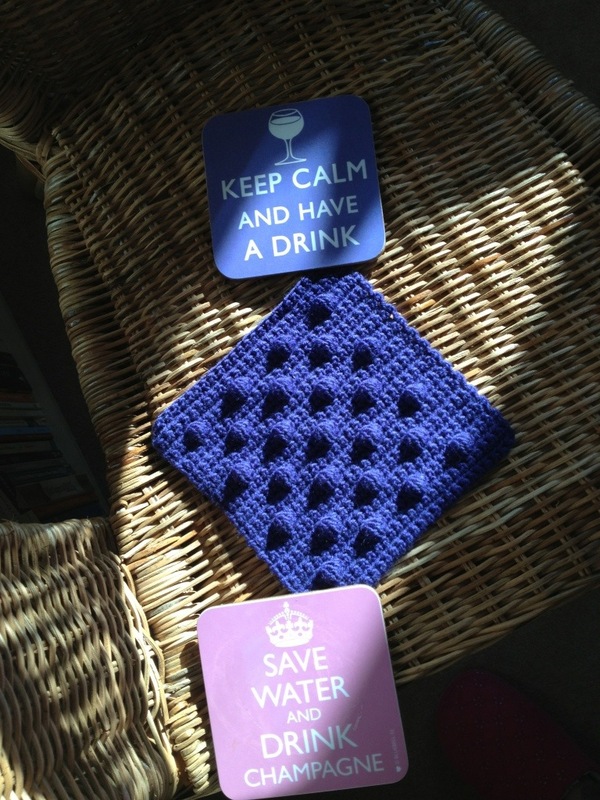 Just to let you know in case you’re breezily sitting with your drink right there…. DON’T! I’m aware that my CAL block makers (Rachell and the block-heads?!) are spread online: through the blogging world, Ravelry, Twitter, Flickr and some are email followers, so I thought I might do a little poll to see where the majority of you are going to show off your finished blocks. I’ve been dying to find another excuse to host a poll. I don’t know why, but I love them! 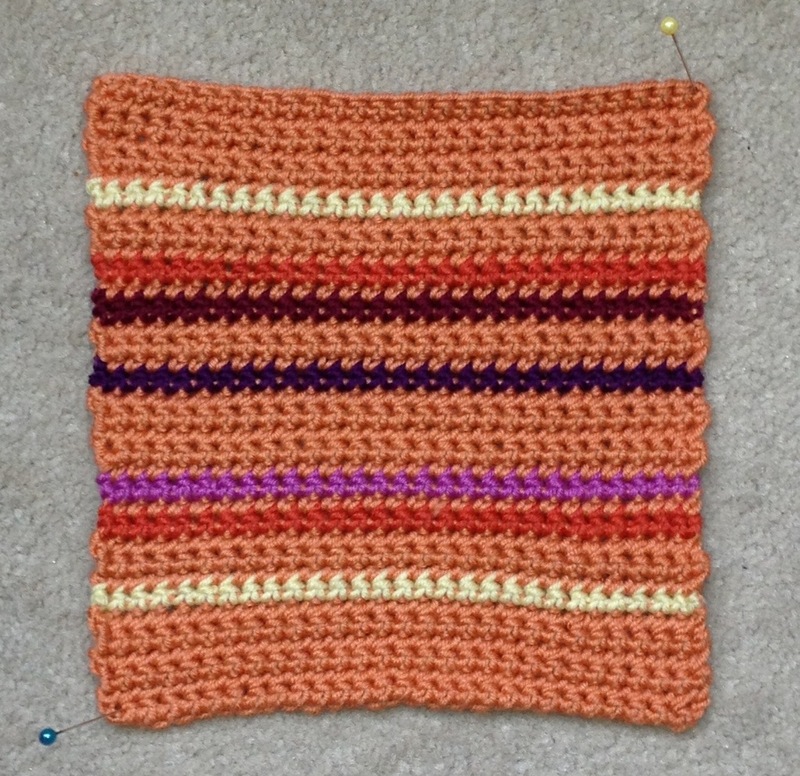 200 Blocks Crochet Along with Rachell: the THEME! The final votes for the theme for my CAL have been coming in all weekend. Yesterday one theme (Sea & Sand) began to gather more and more votes, but it didn’t quite make it. Yes! 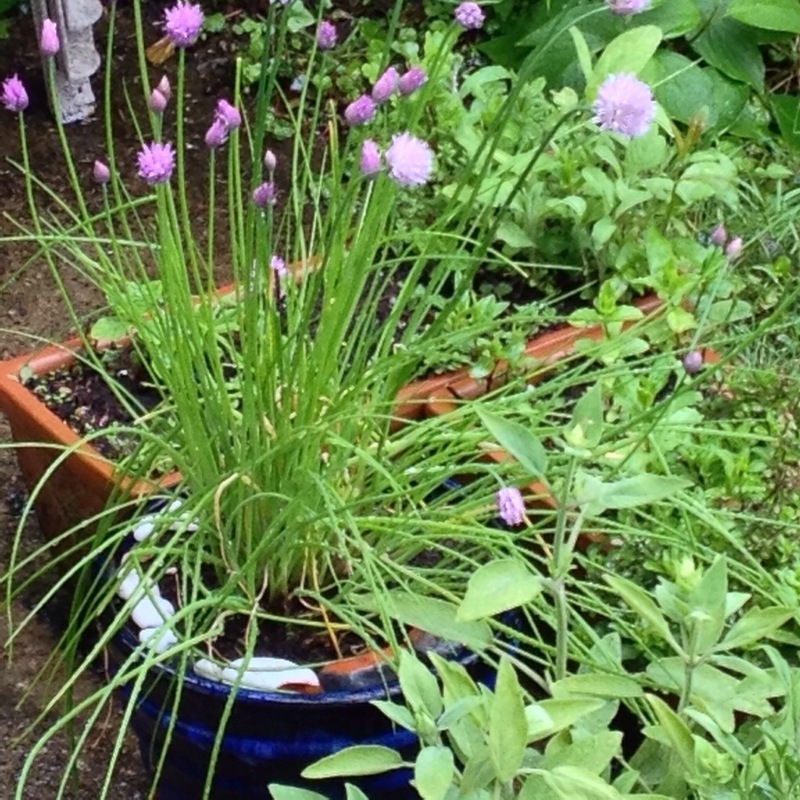 The winning theme is Cottage Garden. And it’s not too late to join us, everyone welcome. Originally I was going to link to everyone’s blog. I thought there would be around a dozen people doing this CAL with me, but there are currently 71 people in the Ravelry group I started alone, and more here, so it’s hard to tell exactly how many. Judging by the number of messages/votes I’ve had it’s LOTS! 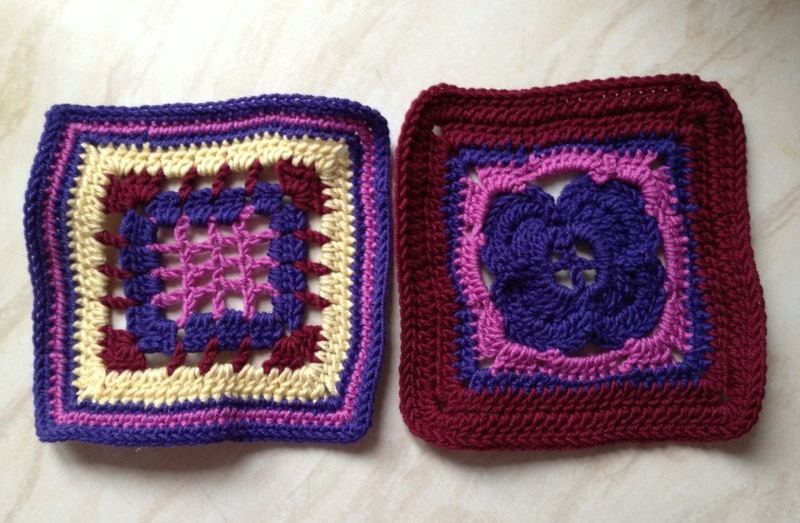 Come and add your Cottage Garden inspired blocks as we go week by week to the group I’ve set up on Flickr It’ll be fun to see everyone’s yarn choices. 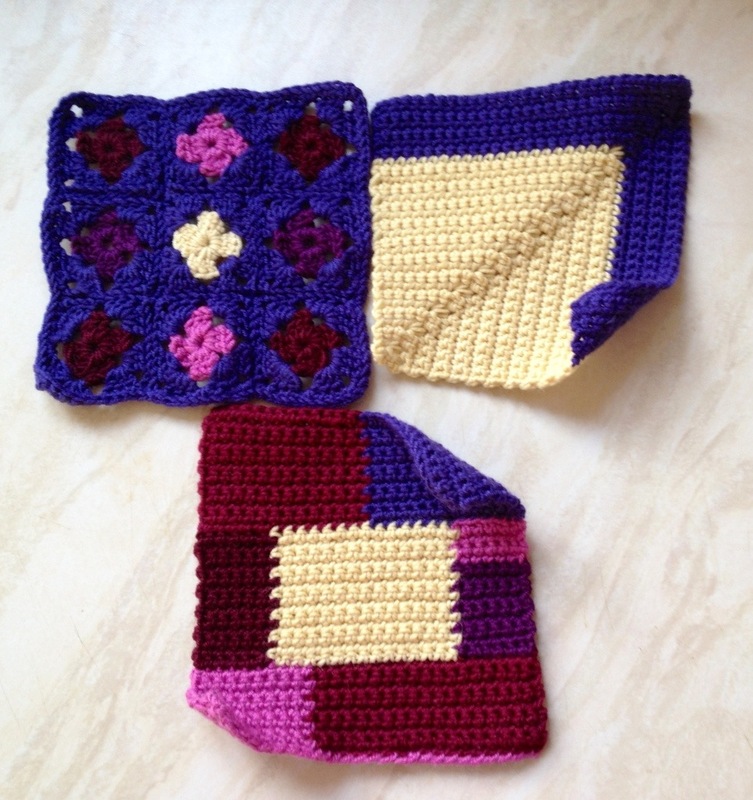 We start on 1st September with blocks #1 & #2 and pics can be added from then. 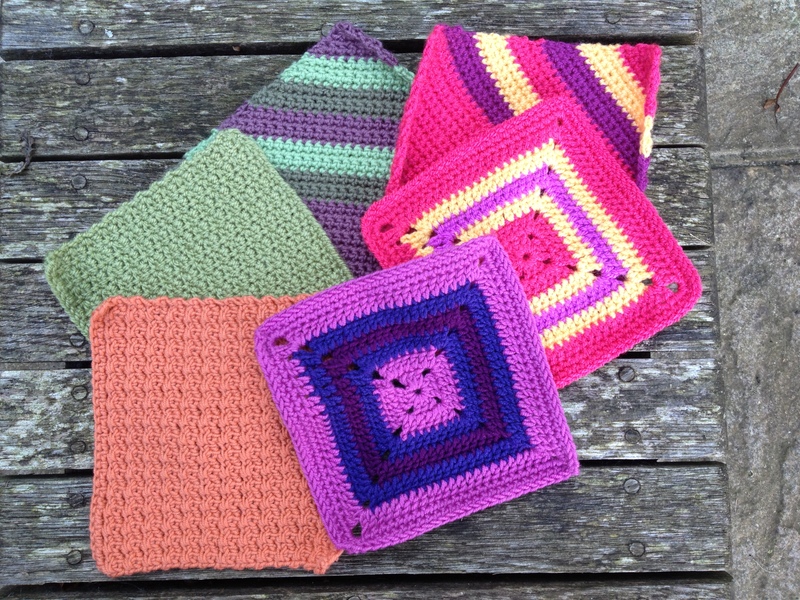 If you get stuck there are some super experienced and friendly crocheters on the Ravelry 200 Blocks Crochet Along with Rachell group who will help. I’ll definitely be there asking for help! 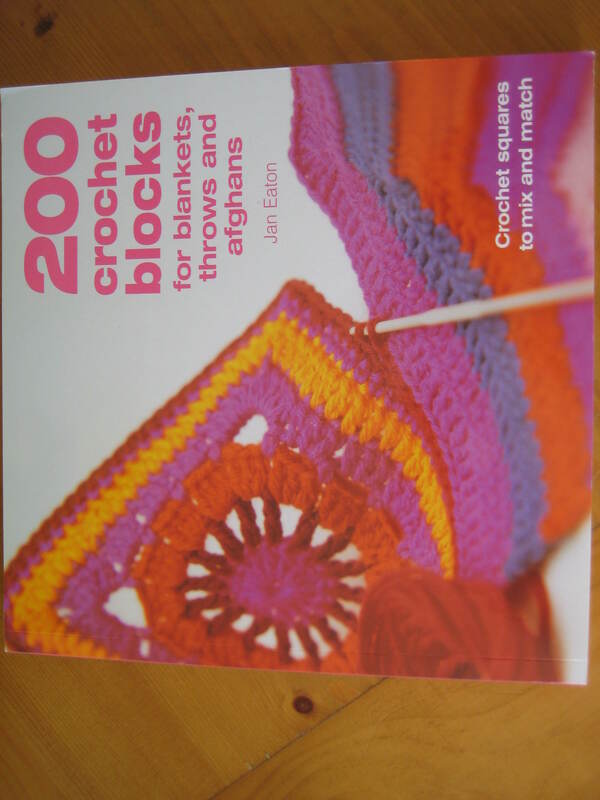 A couple of weeks ago I mentioned starting a CAL – a crochet along – as I’ve owned this superb book: 200 Crochet Blocks for blankets, throws and afghans by Jan Eaton for a while now but haven’t used it apart from referencing stitches and techniques. (See here if you’re interested.) 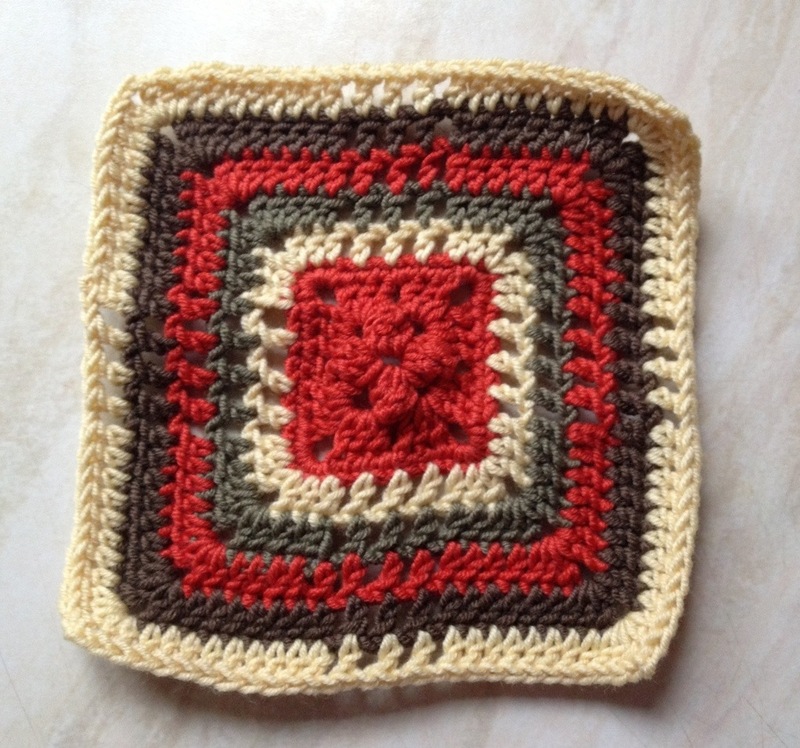 I asked if anyone would be interested in making 2-3 squares a week and had an enthusiastic response. We will start from block number one and take them as they come in order (2-3 blocks a week) otherwise I just know I’ll choose all the easy ones first. The CAL would become a bit of a trial, I’d stop and I’d have to leave the blogging country! If you have decided you want to join this CAL you’ll need to get hold of a copy of the book, since I can’t post patterns here as I would be infringing copyright. This is a popular book that many crochet fans already own, and it should be easy to get hold of a copy. I have a link to it on Amazon on my sidebar to the right under ‘Books!’ If you are trying not to buy anymore books at moment you could try looking in your local library for a copy. If the theme fits with my yarn collection I’m initially going to use that up, but we’ll see. I’m hovering between themes and so am going to vote last, because I can! I’ve made myself choose a theme because I could dither for days otherwise! Once the broad theme is decided we would use our own choice of yarn, shades, colours and hook size, then compare notes as we go. It will make the CAL much more interesting especially at the end; seeing everyone’s choices. 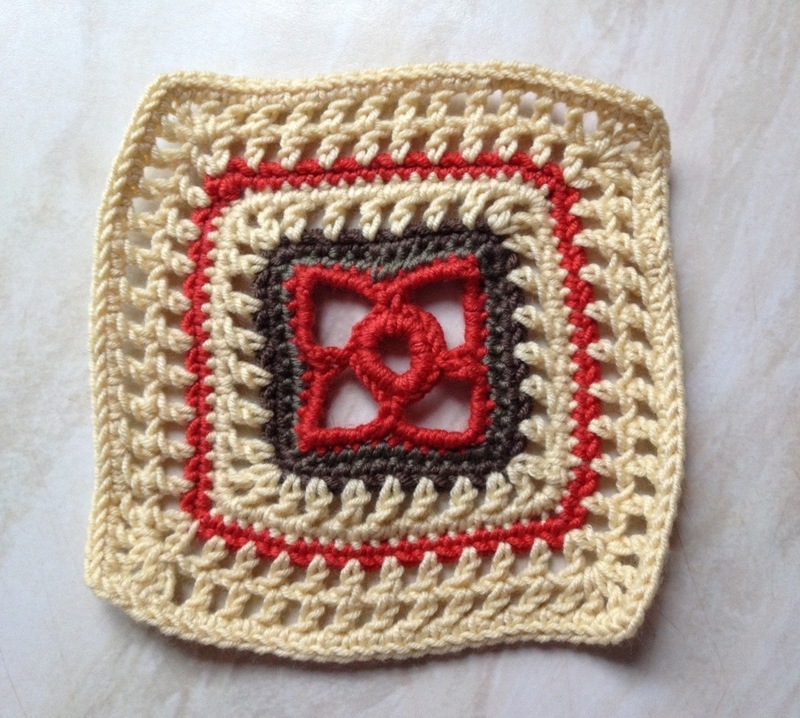 I will post links to your blog as well as photos of my completed squares as we go on a weekly basis, ideally at the beginning of the following week. I’ll announce the winning theme on Tuesday 28th August here in a new blog post, then we can get our yarn together and fingers flexed ready to start the CAL. YES! At any time, the more the merrier. I’ve started doing some cross stitching for the first time in a very, very long time and am enjoying it. It’s funny though because I was always a bit down on cross stitching because I thought it relatively skill-less when I was younger. I used to do tapestry and embroidery more in those days. I’m working up to more sewing but have lost confidence through lack of practice and have forgotten lots of techniques. I also need to take a refresher on using a sewing machine since I have forgotten the teeny leetle bit I used to know. I had to drive cross-country to work for about eight years and all the gear changes really aggravated my elbow, and so I actually gave up everything crafty. I just packed my hoops, frames, wools, threads, needles and books away. Then I got into study and stuff which left no time. I feel like sleeping beauty in lots of ways where craft is concerned as I didn’t do any for most of a decade. It seems extreme now, but I really was in pain at the time and used to find that even stirring cooking and cutting out with scissors aggravated it. It’s much better nowadays and learning to crochet, then discovering the world of craft blogs, has awakened a gradual desire to try my hand at different skills again. It’s really exciting! And there she is going strong playing his landlady, bless her. I originally knew her from Aunt Sally in Worzel Gummidge. I wonder if she’s still sewing in between filming? I’m not sure whether there’s a law of cross stitching (or, x stitching as it’s now known as in the 21st C version of kool crafts) as in all the stitches must universally go in a particular direction, but figure as I’m a leftie the top stitch goes L-R diagonally and as long as all stitches are in the same direction it’s ok. You see; I really have lost my mojo….! On another tack; I was wondering about starting a CAL – a crochet along – here as I’ve owned this superb book for a while now but haven’t used it apart from for referencing stitches and techniques. 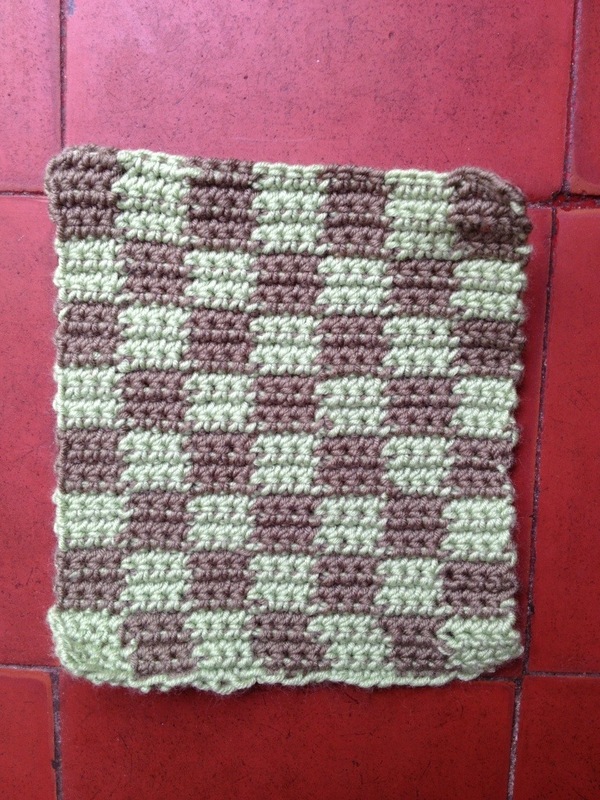 Would you be interested in making 2-3 squares (or fewer? Is that too many?) with me a week? 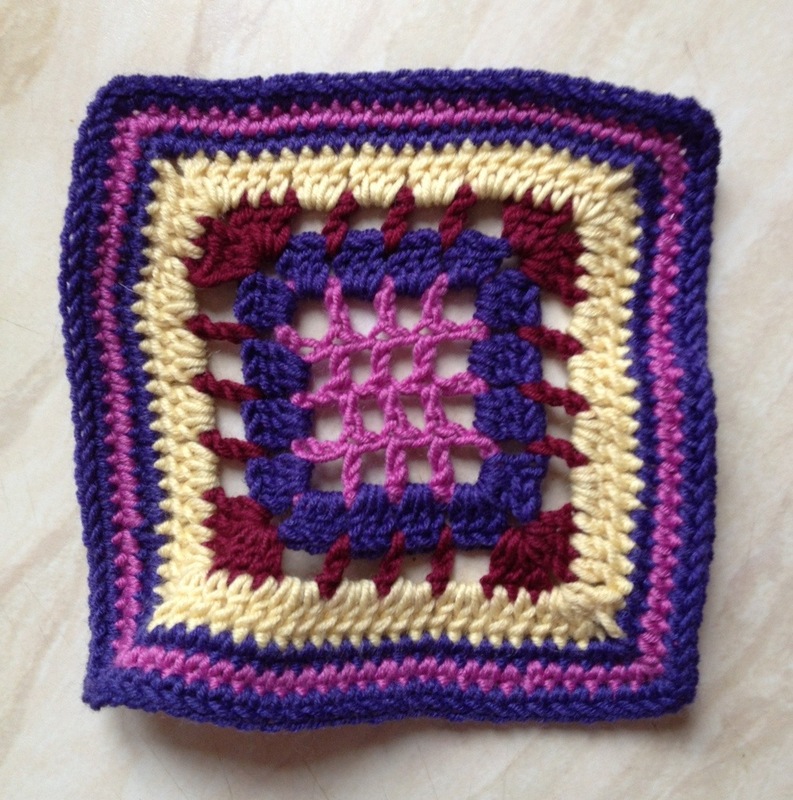 I thought I could post links to your blog and photos of the completed squares as we go on a weekly basis, maybe at the beginning of the following week? I’ve run the idea by (clever) Patch who has suggested having a colour theme such as: Sea and Sand, Moonlight and Stars or Autumn Leaves. I love it! I’m drawn to Autumn Leaves since I wanted to make a blanket for my living room which ties in with my favourite rug there. It’s reddy, brownie, yellowy-goldy coours. BUT I can set up a poll for votes and alternative suggestions. I’m all for democracy. 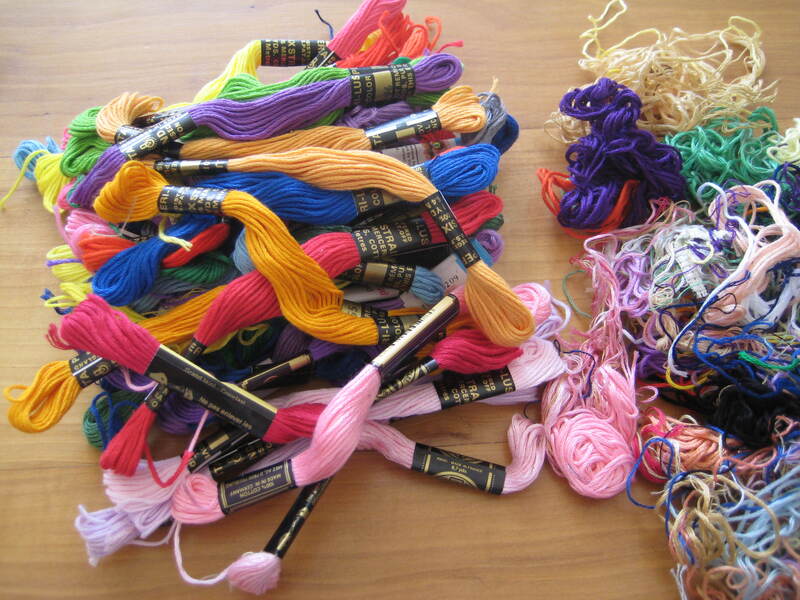 Once the theme is decided we would buy our own choice of colours, according to the theme, and type of yarns then compare notes. Would you be interested in doing a CAL with me? I’m enthused by the idea since I haven’t got a social crochet group together yet, and this is a step in the right direction, albeit online. I’ve also never taken part in a CAL before either. pLeAsE sAy YES! It’s holiday season so I reckon the best time to begin would be the first week of September, but that depends on you. 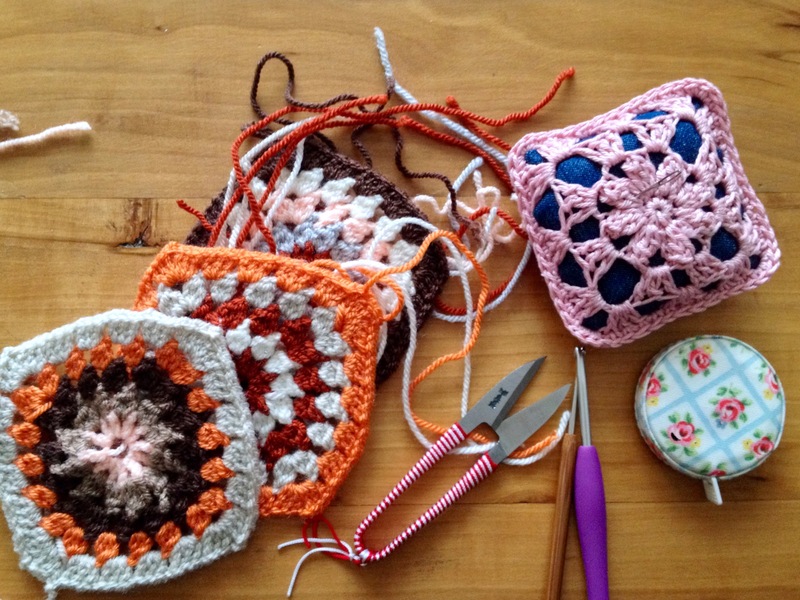 It’s a busy going back to school week for many, but then you’ll probably need the meditative power of crochet and the sharing of progress in a social crochet kind of way won’t you? 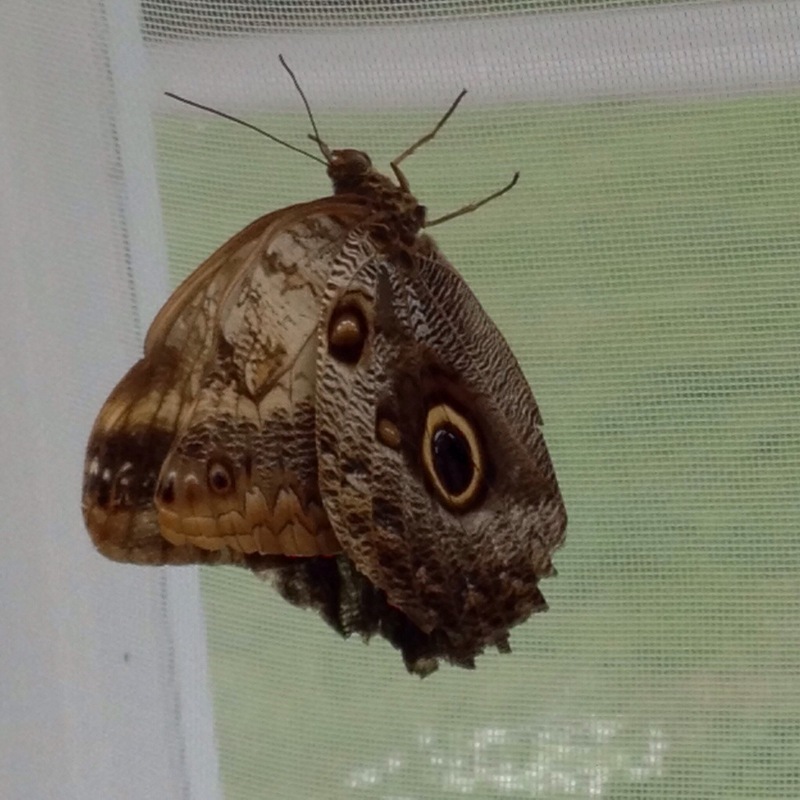 To finish I wanted to show you this beautiful creature. 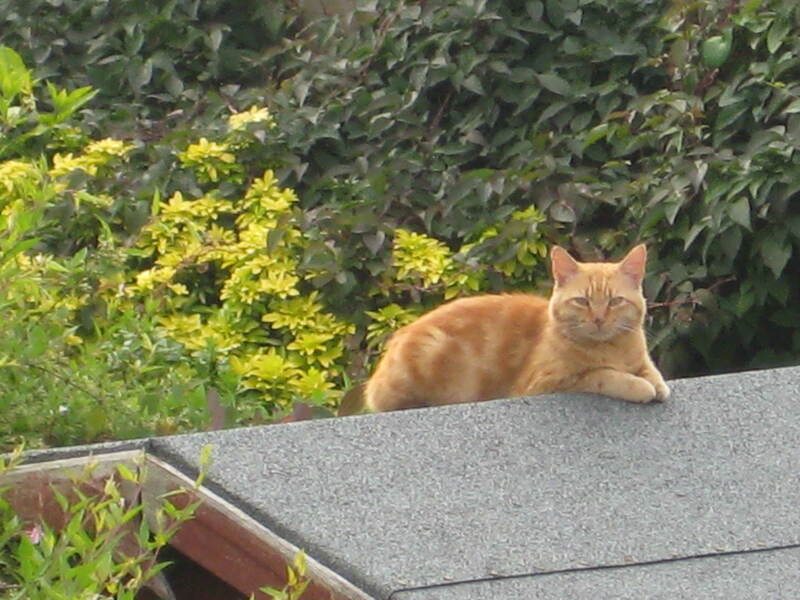 I opened the curtains the other morning and there he was sitting on ‘his’ shed roof enjoying the morning sun. 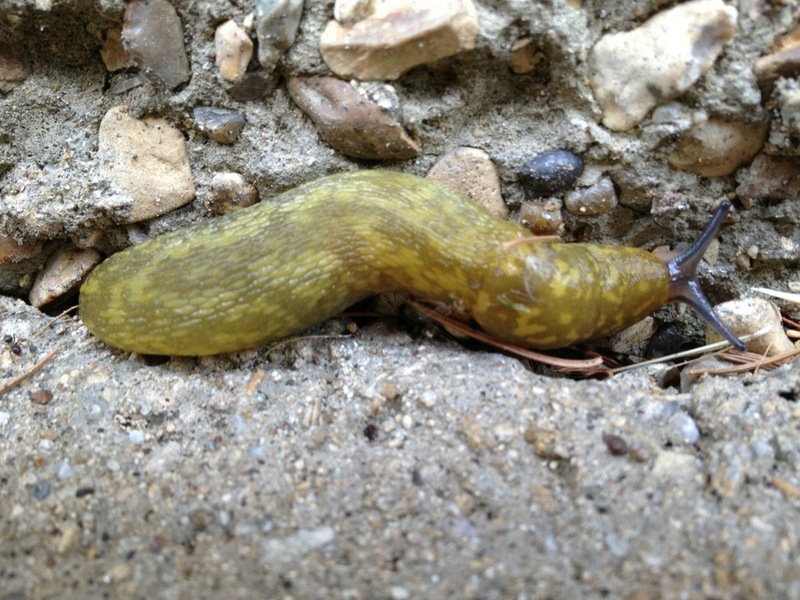 He’s either Ziggy or Spike, I can never remember and can’t ask my neighbour again!